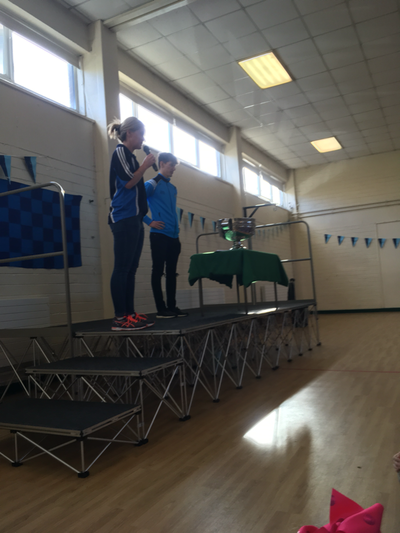 Ms Treanor - St Paul's Junior N.S. 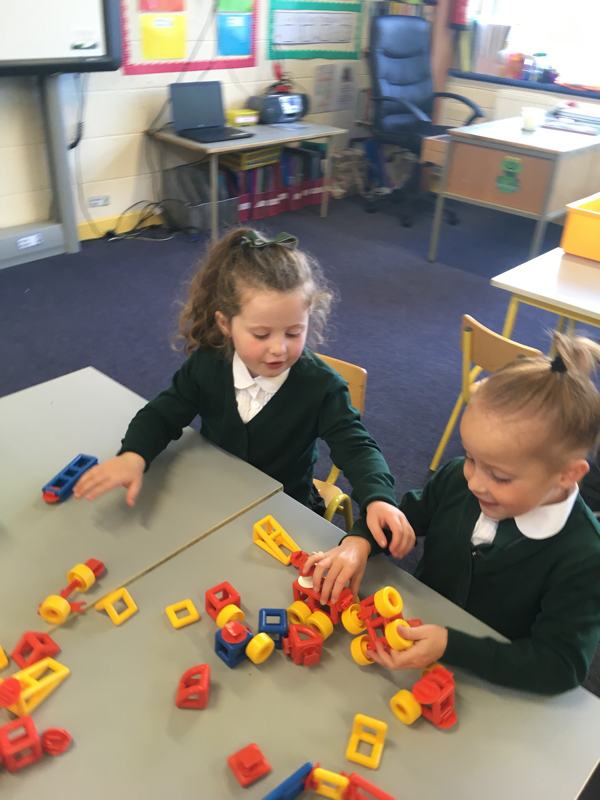 We are currently learning about weight in Maths. 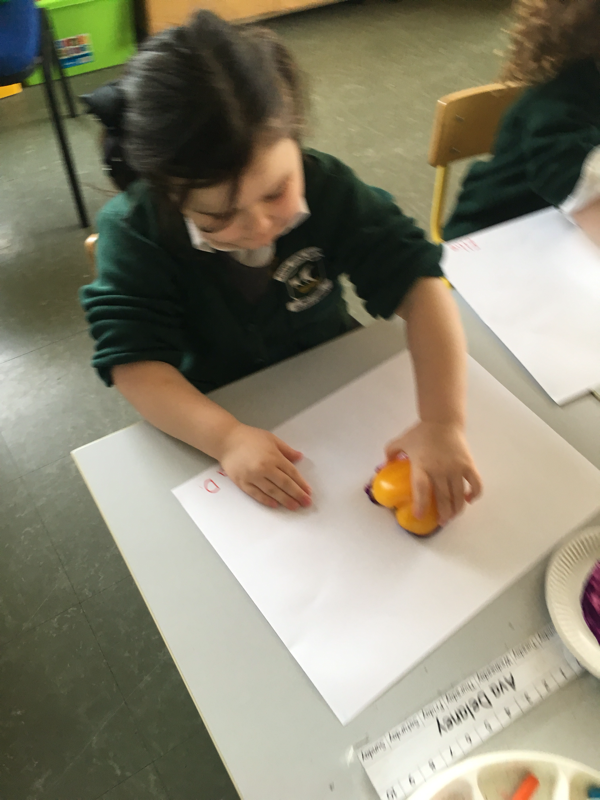 We are measuring objects, estimating which is heavier and then using a balance to see if we are right. We have great fun using the balance on Friday. 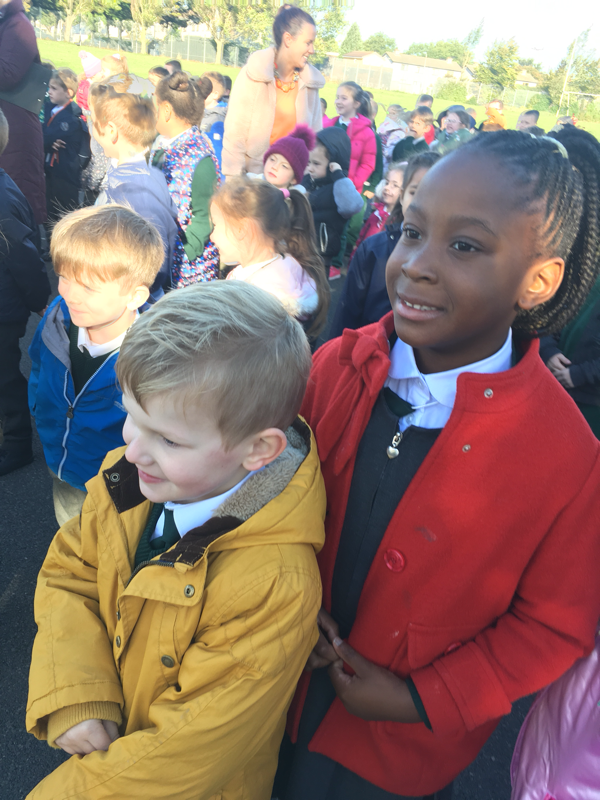 Have a look at us enjoying our autumn nature walk. 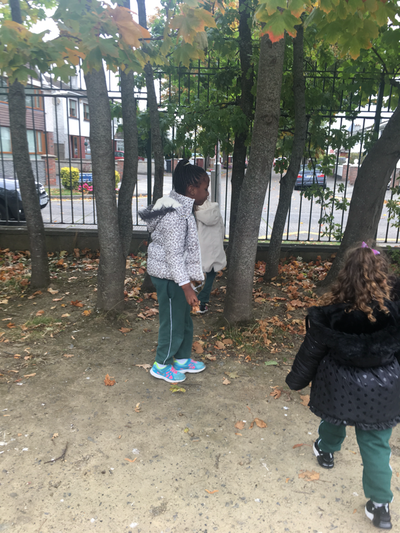 We’ve learned all about the signs of autumn and looked out for them during our walk. 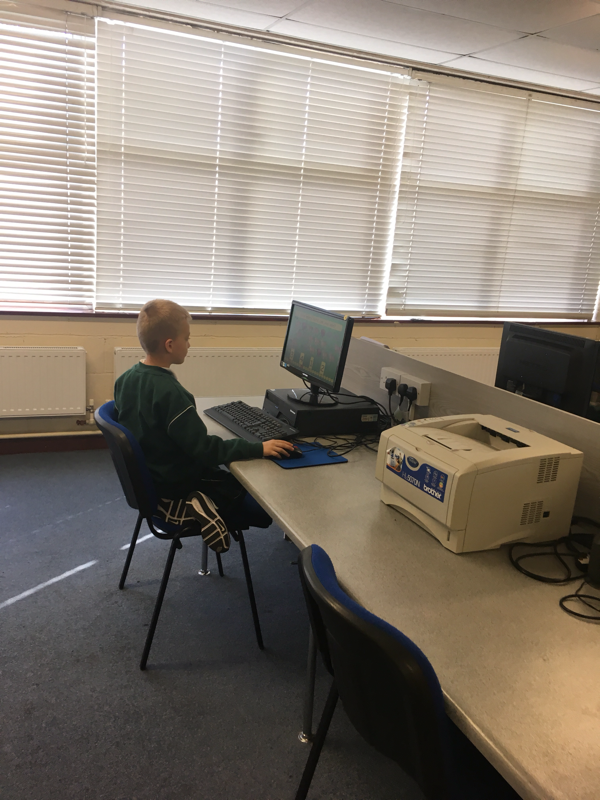 We love going to the computer room. 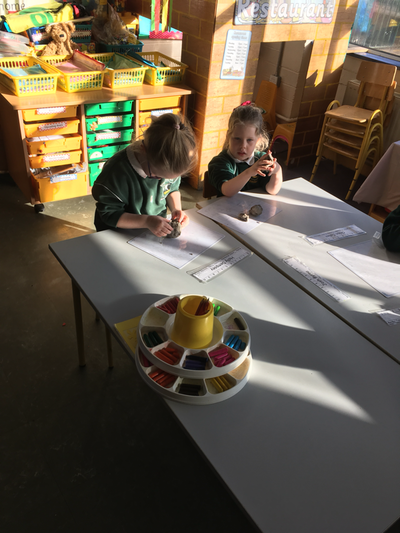 We play lots of maths and literacy games when we are there. 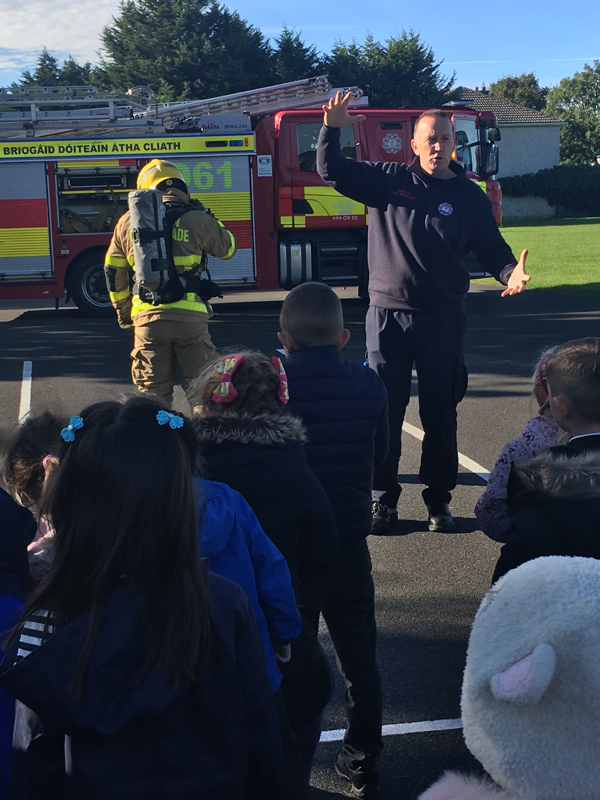 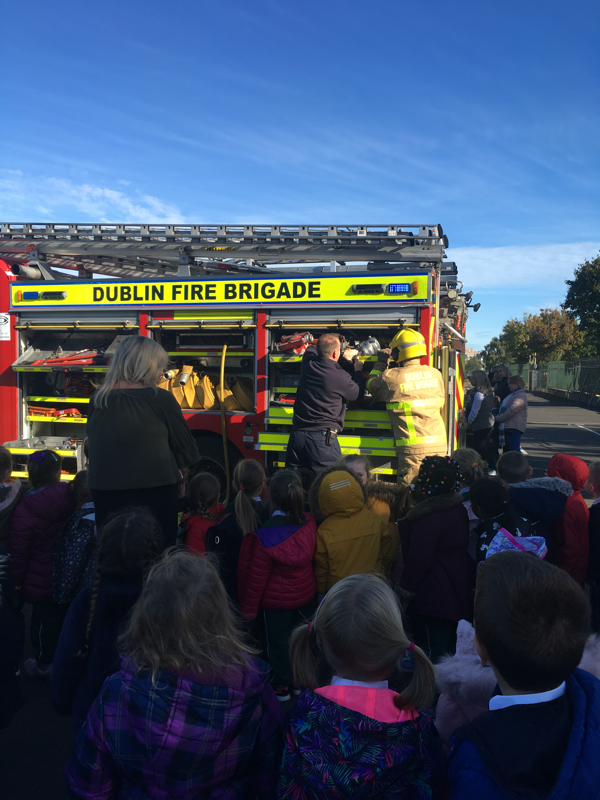 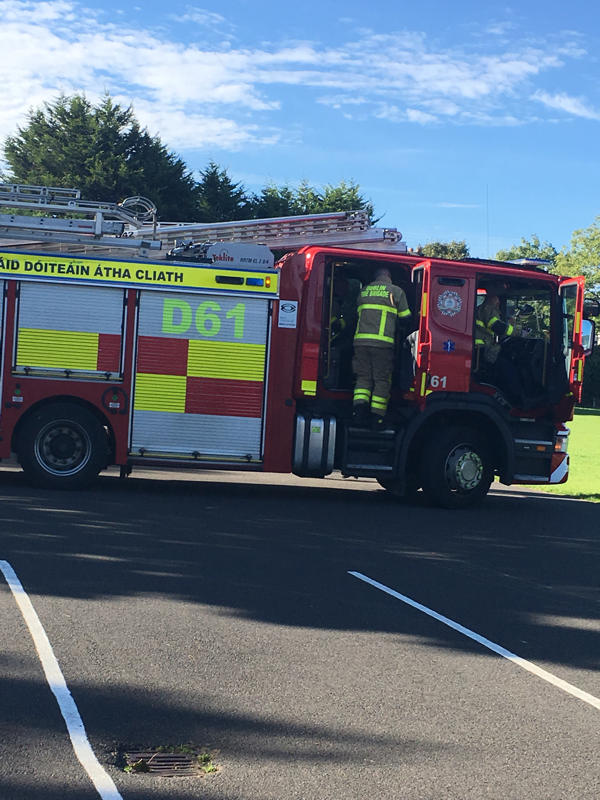 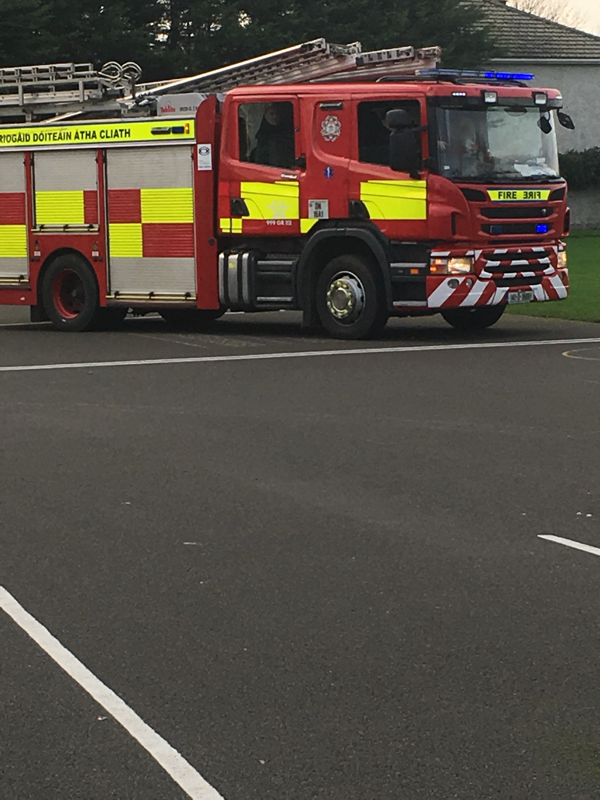 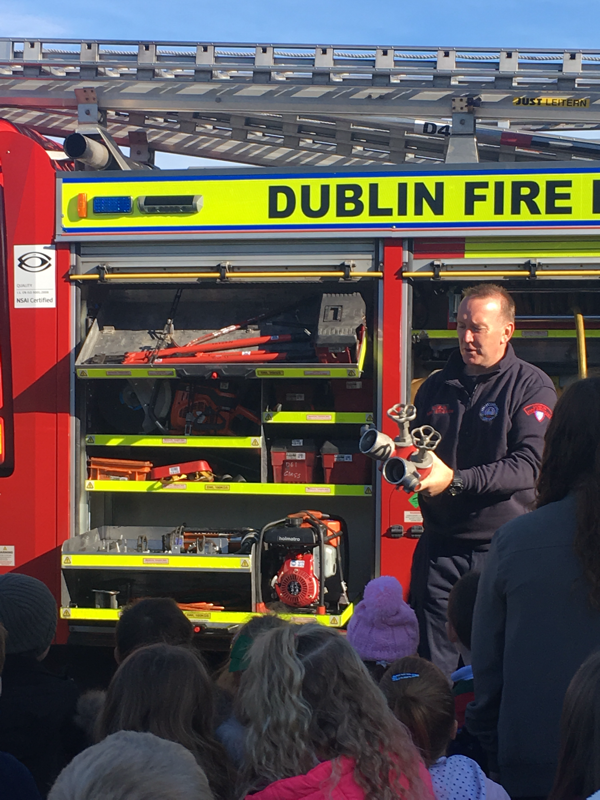 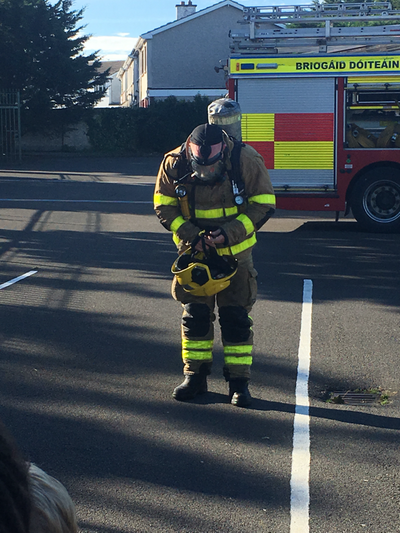 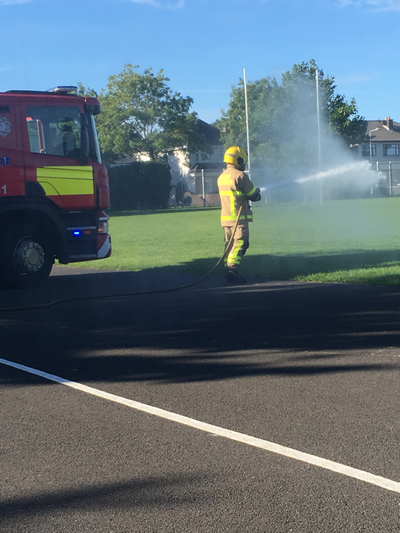 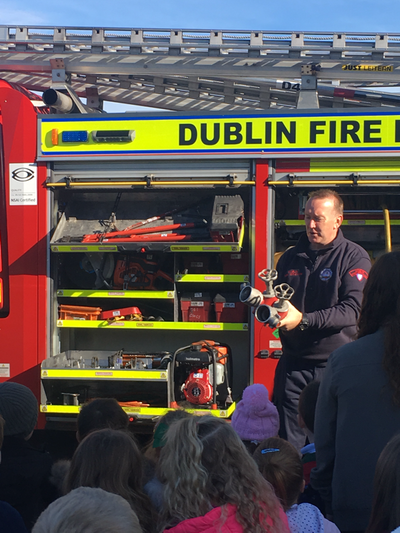 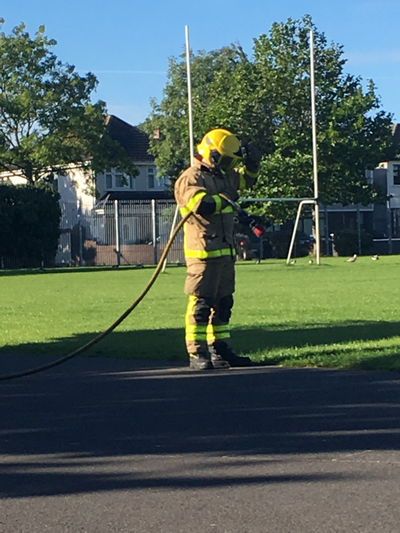 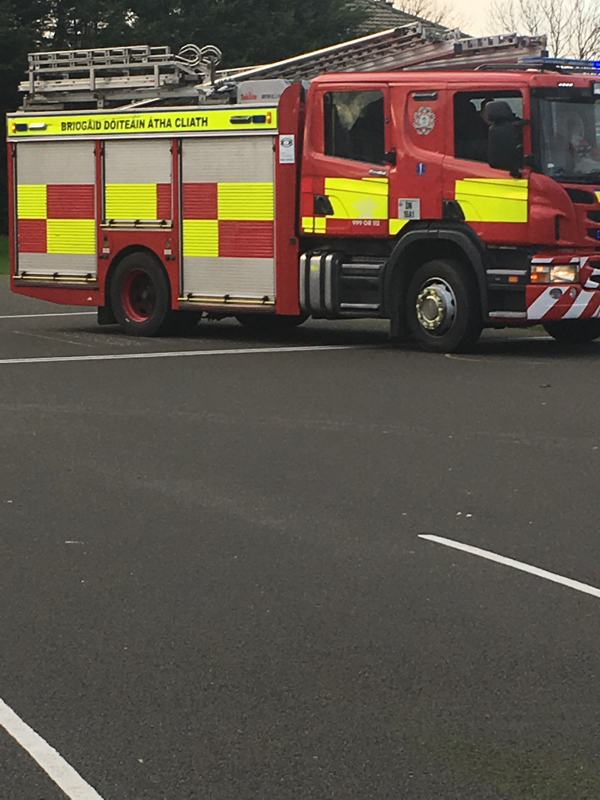 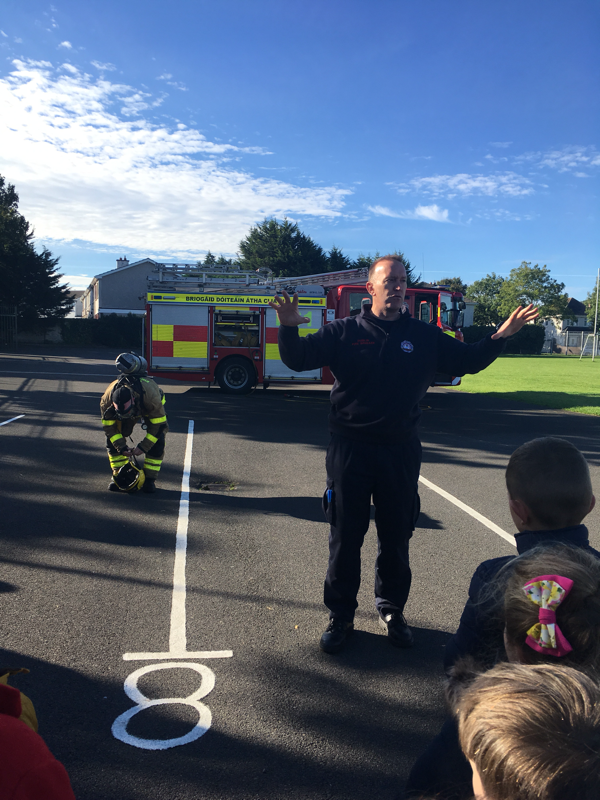 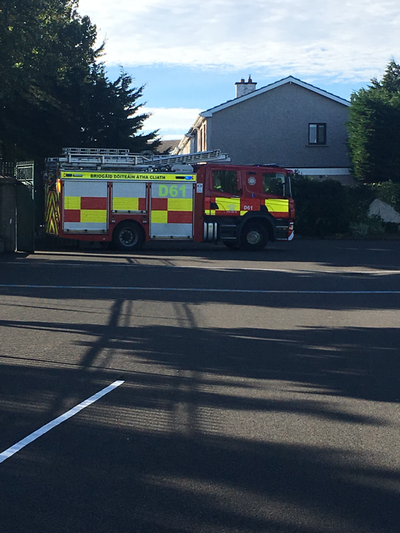 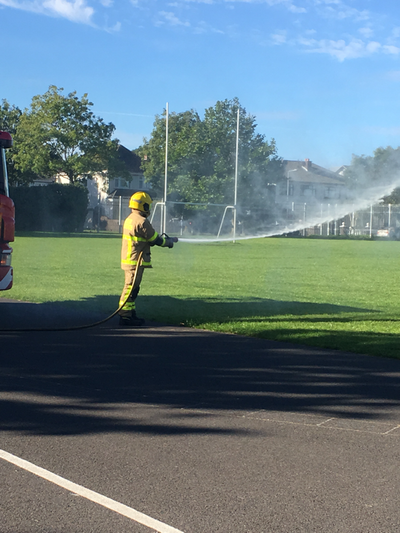 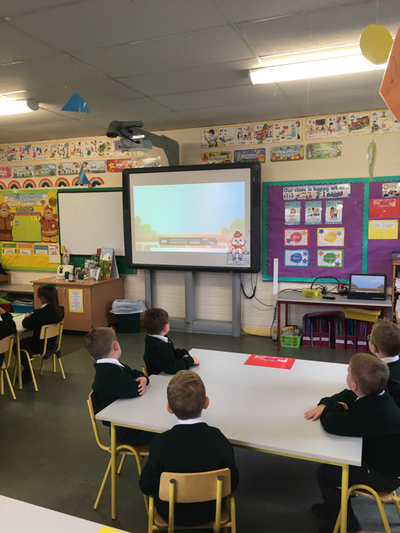 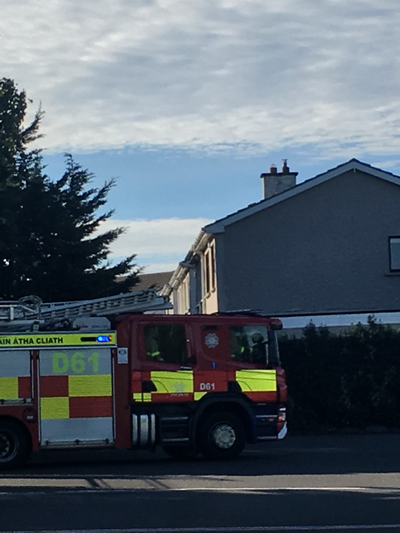 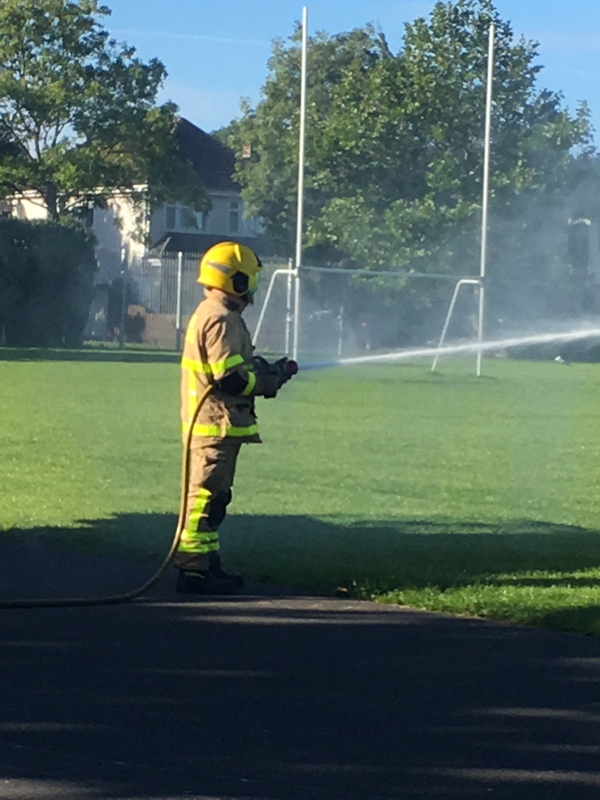 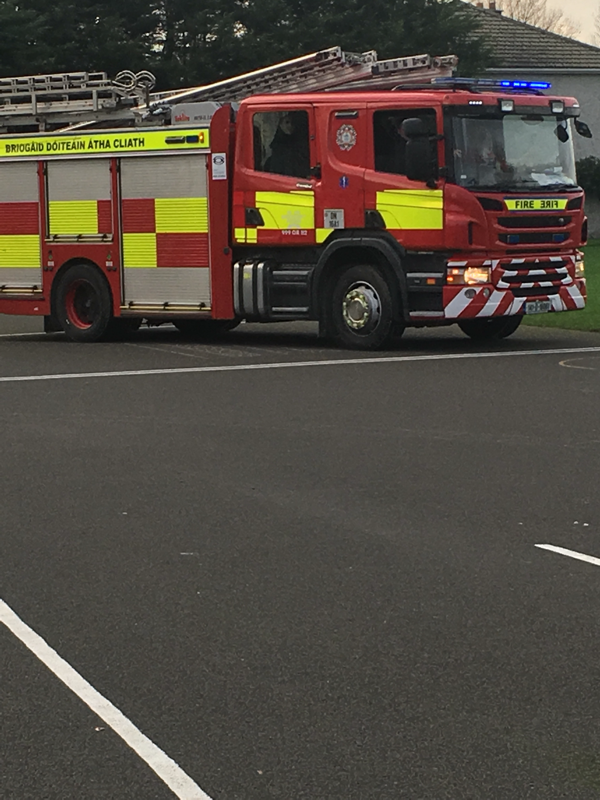 Thank you to the firemen from Kilbarrack Fire station visiting our school. 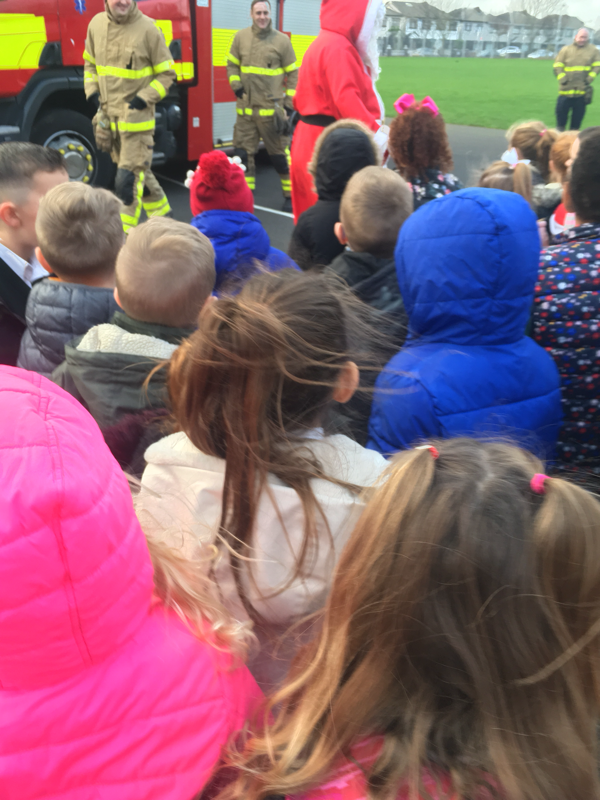 They showed us around the fire engine telling us what each compartment was for. 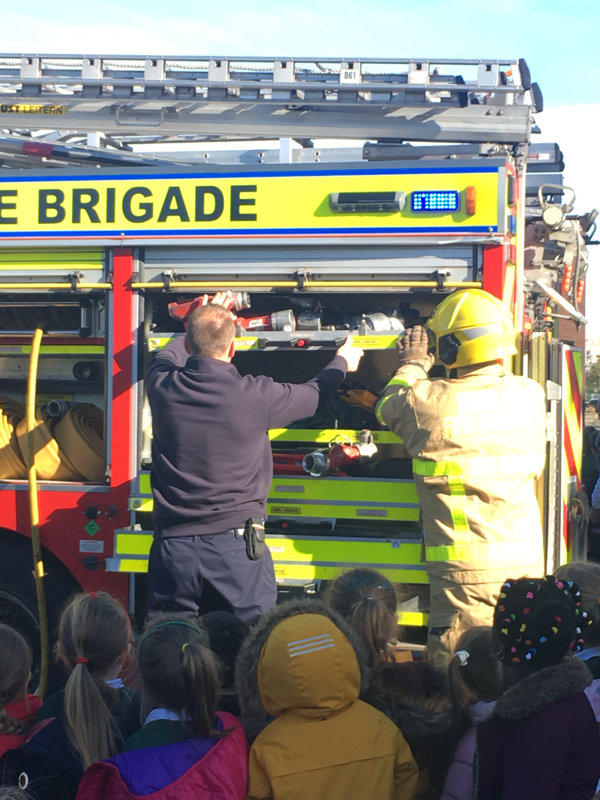 They showed us how to use the fire hose. 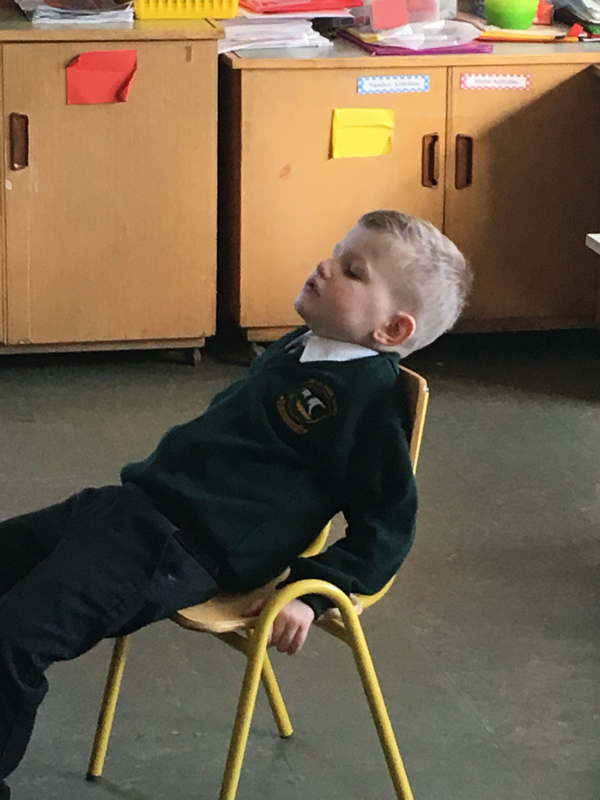 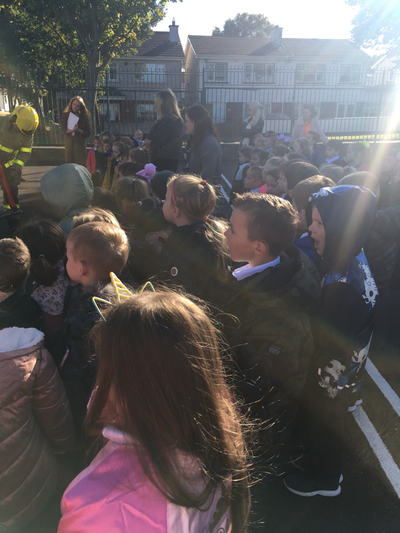 We talked about how to look after ourselves if we were in a fire. 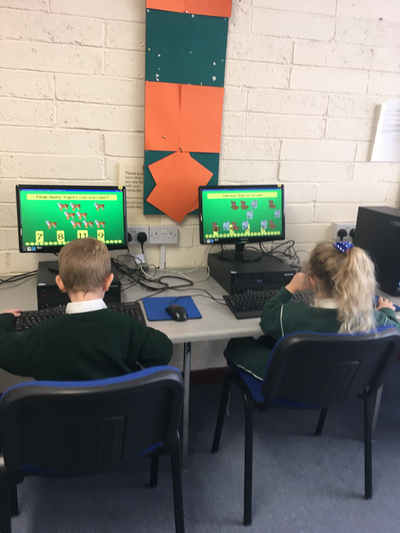 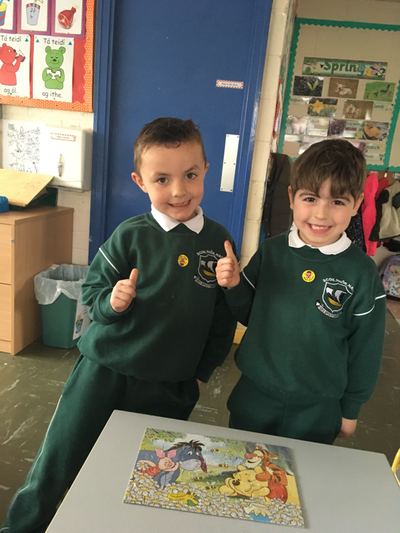 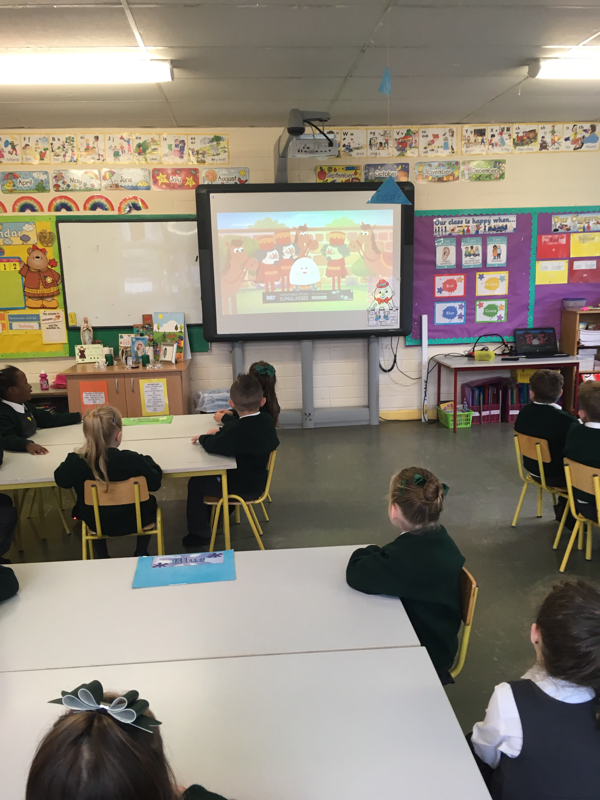 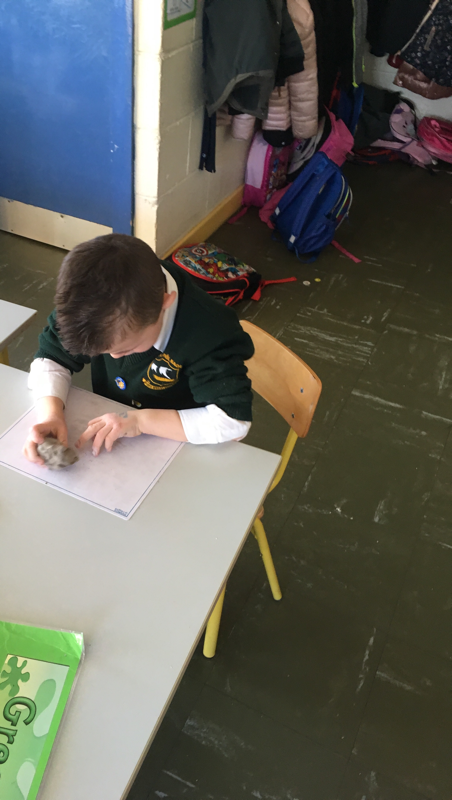 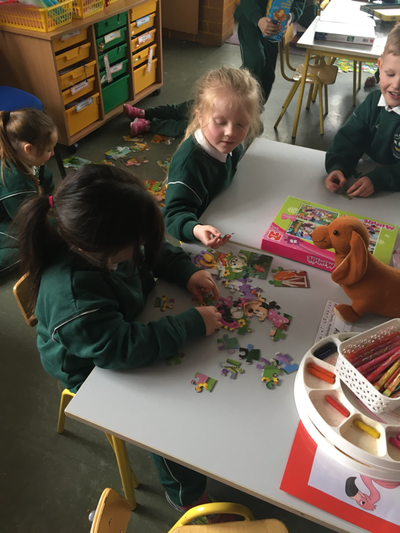 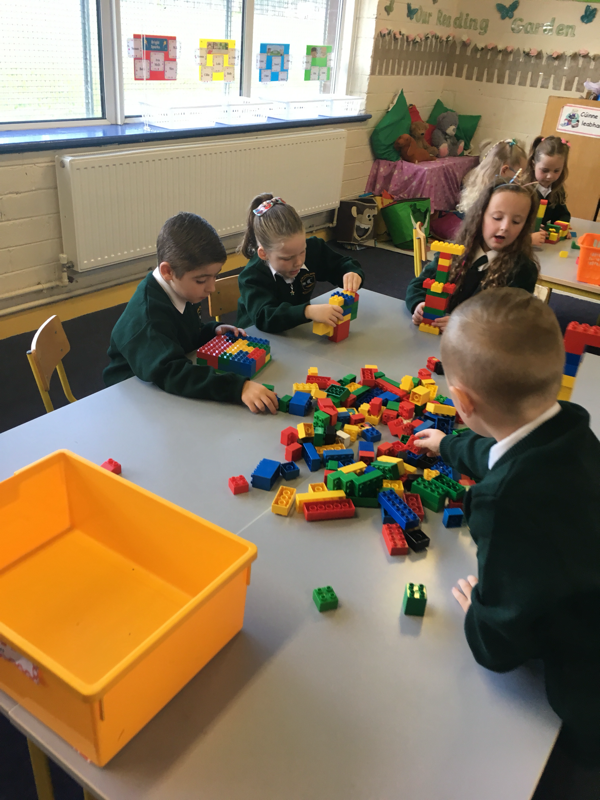 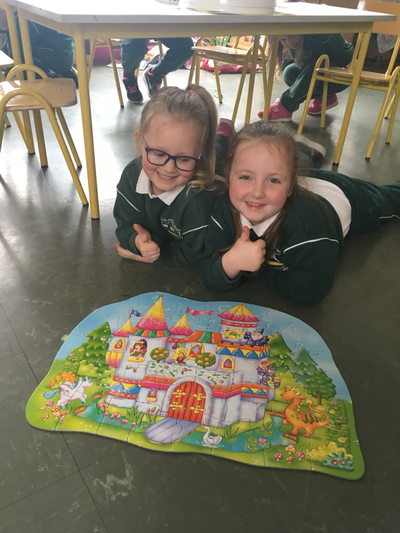 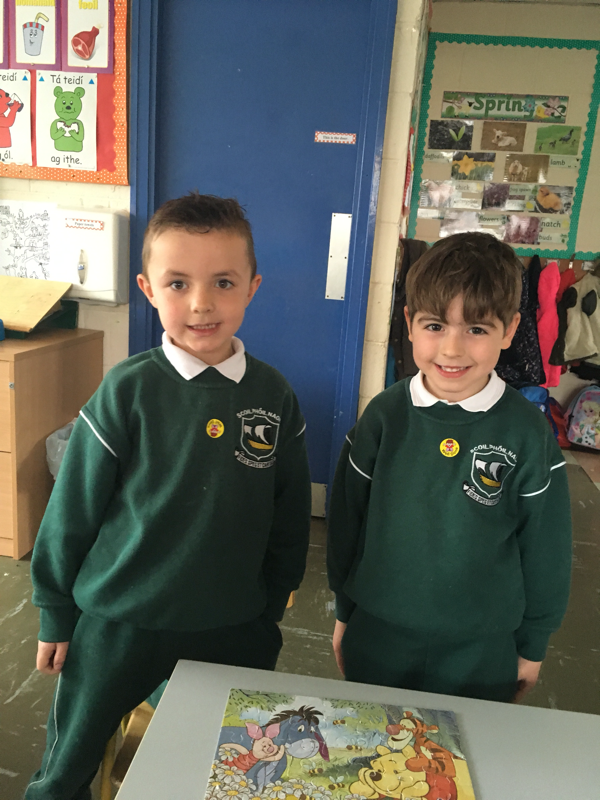 Well done to all the boys and girls of Room 10 for settling so well into Senior Infants. 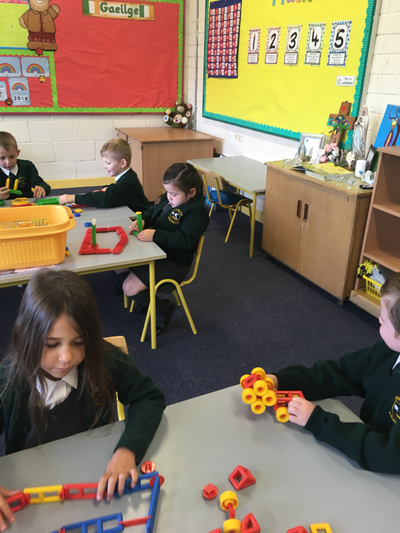 We really like our new classroom and enjoy playing on yard. 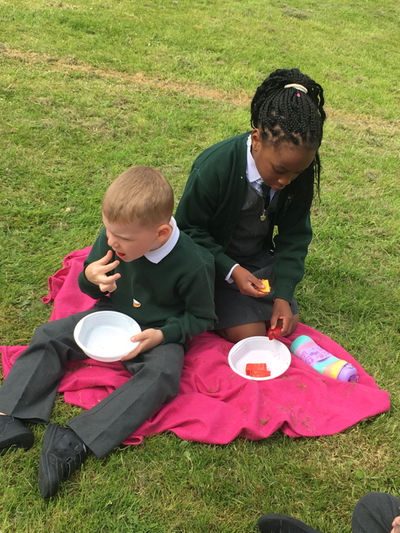 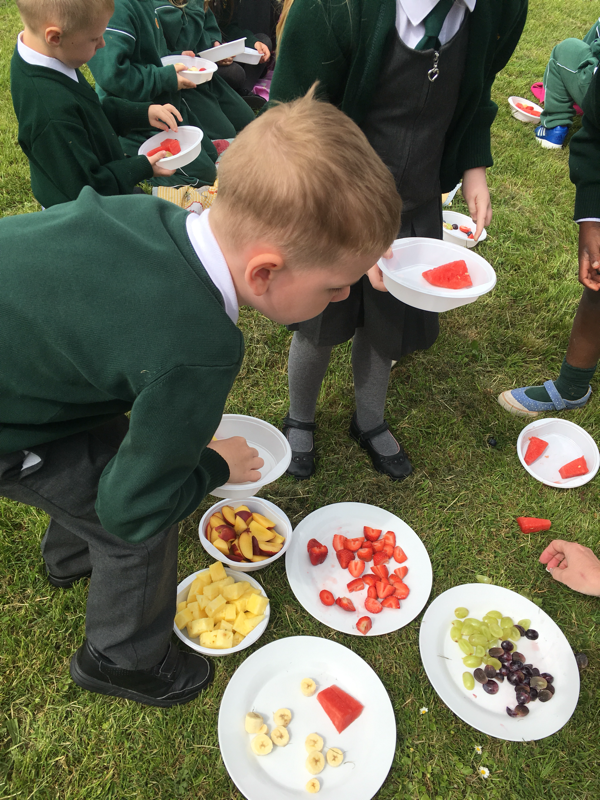 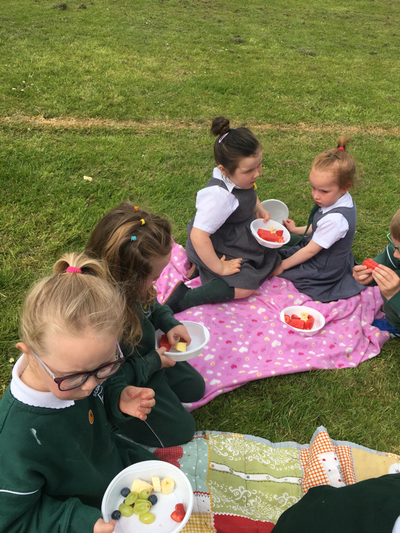 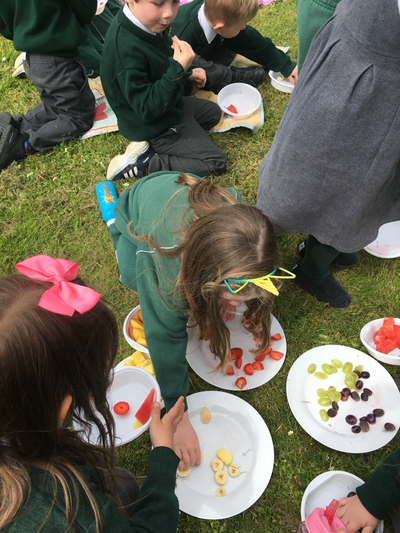 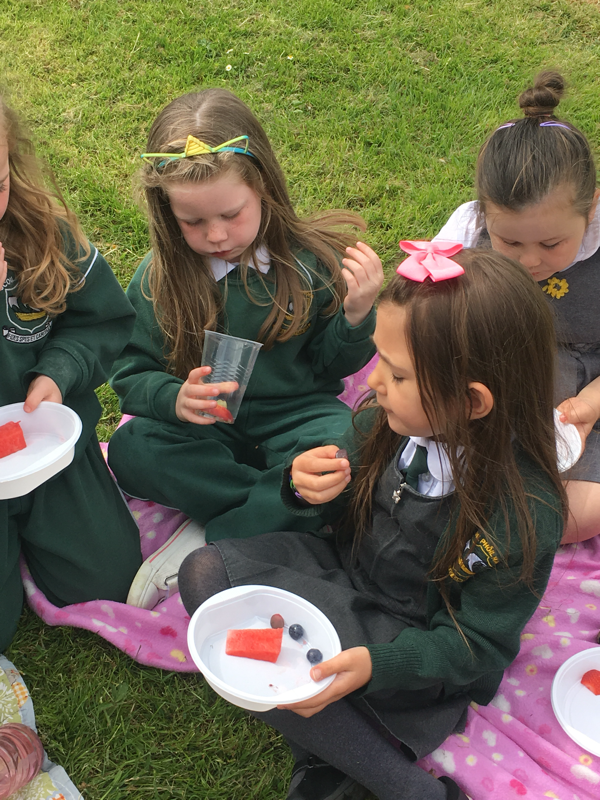 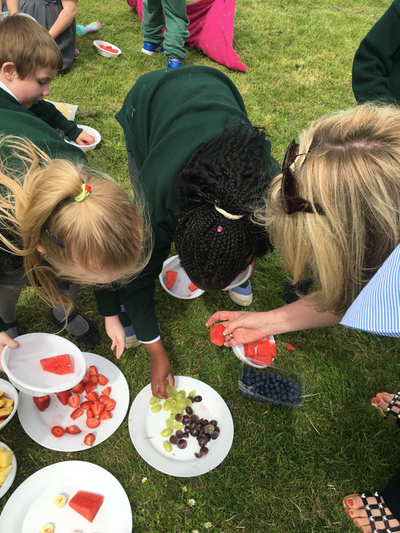 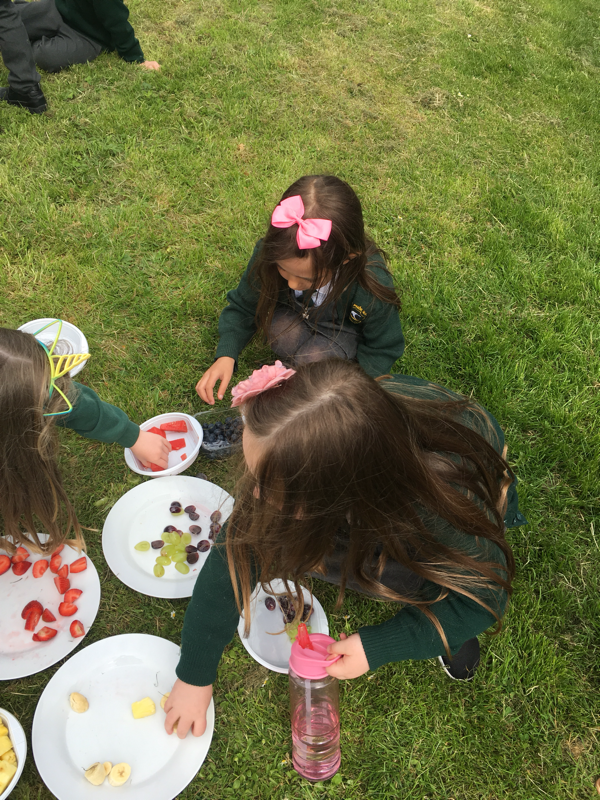 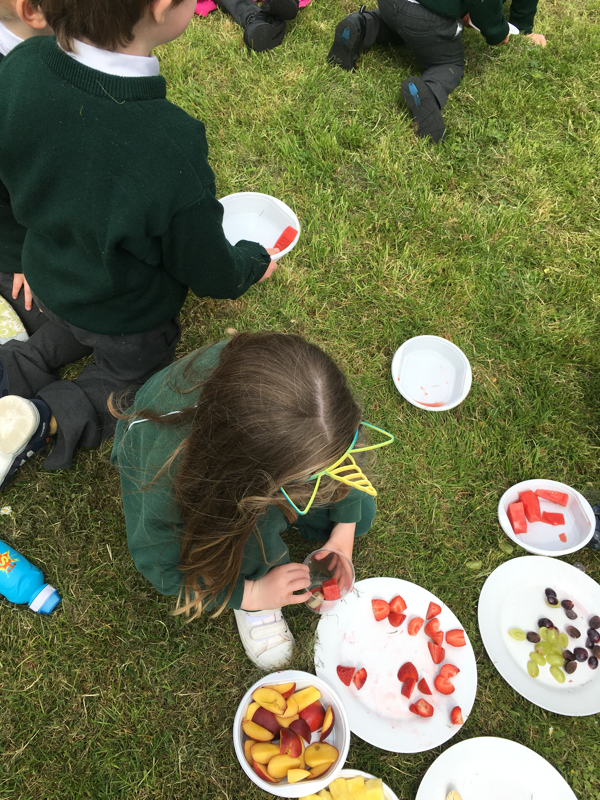 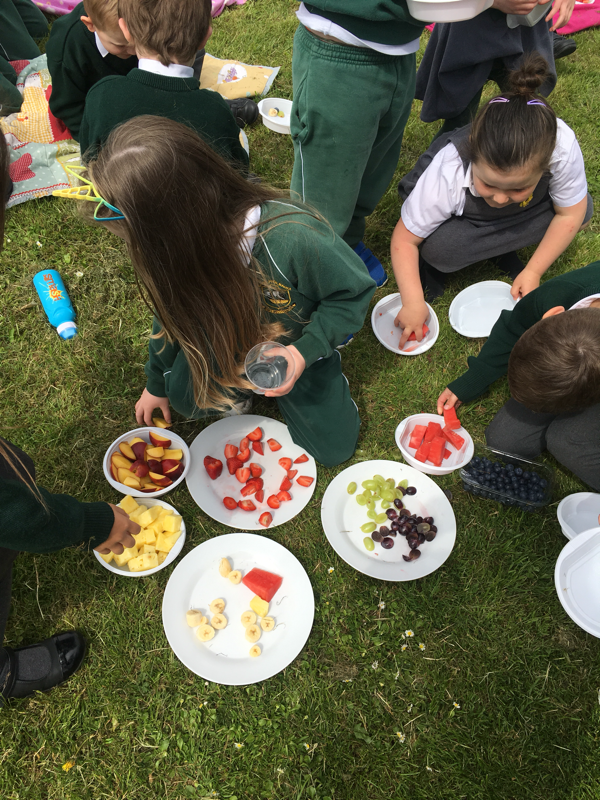 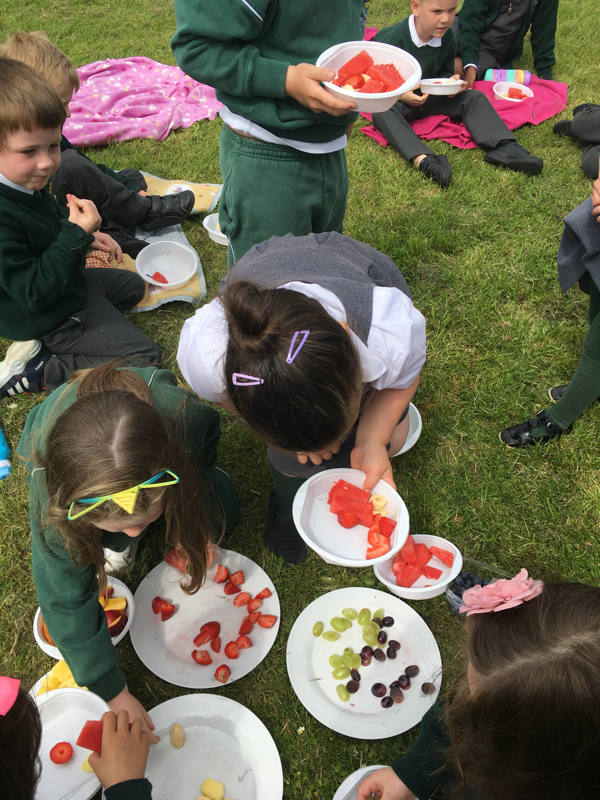 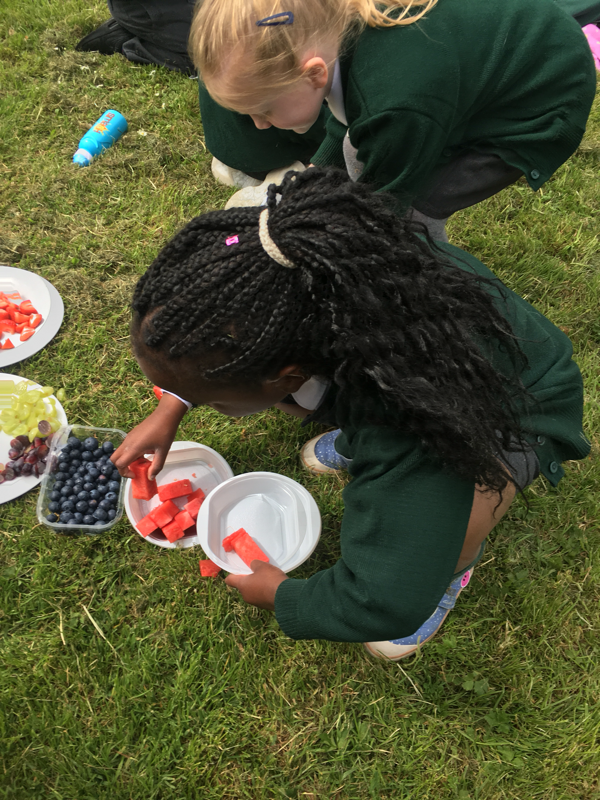 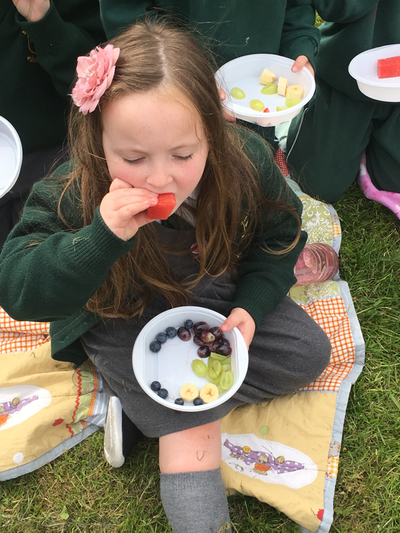 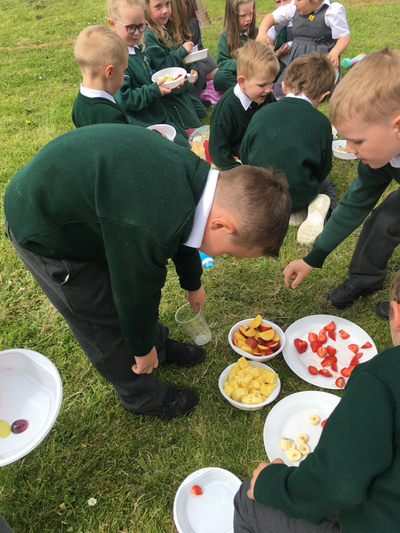 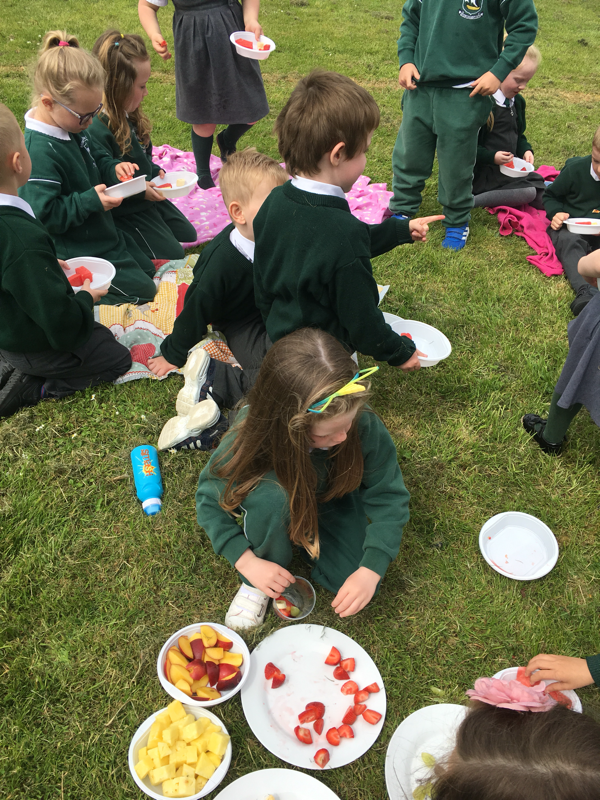 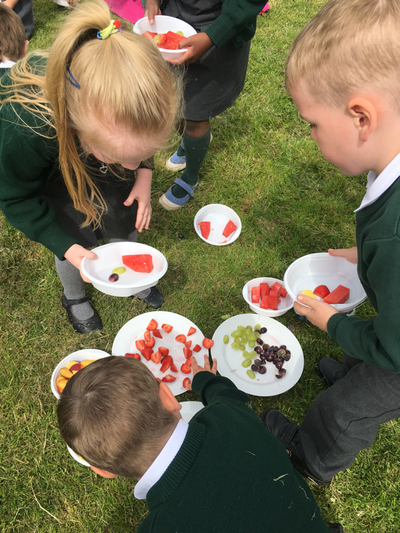 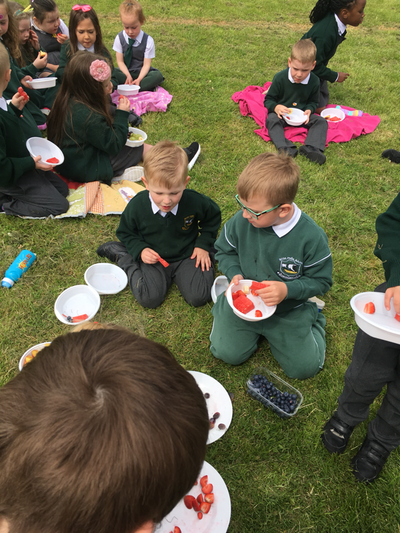 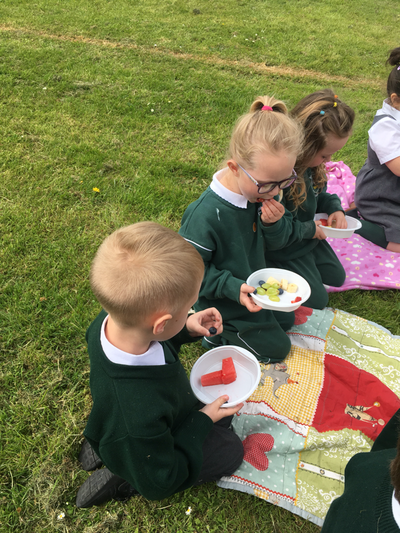 Today we had a fruit picnic outside in the sunshine!!! We tried strawberries, blueberries, pineapple, watermelon, bananas, grapes and nectarines!!! 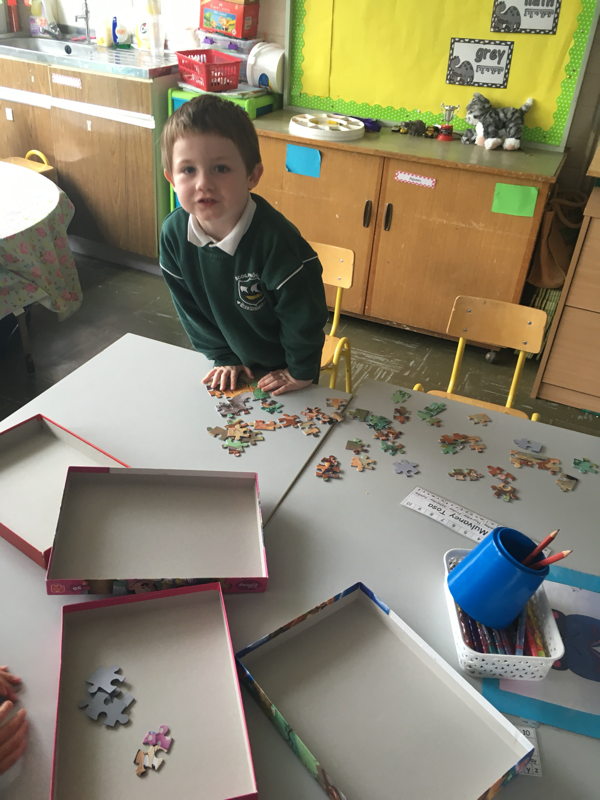 We love jigsaws in Room 1 and today we made jigsaws of 35, 40 and 45 pieces. 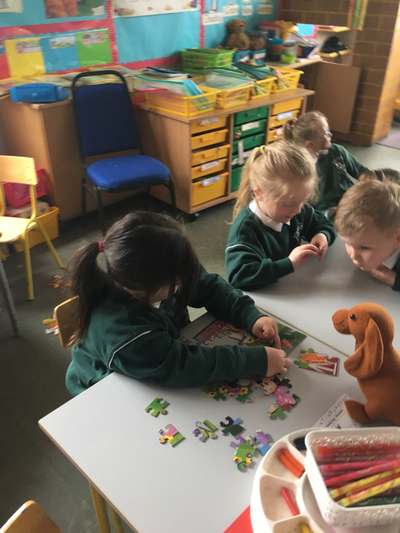 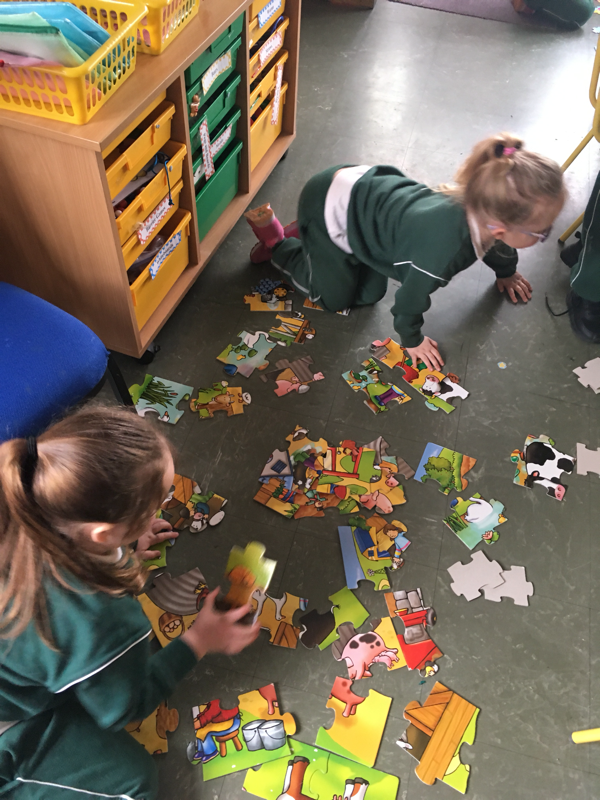 Have a look at us during jigsaw time! 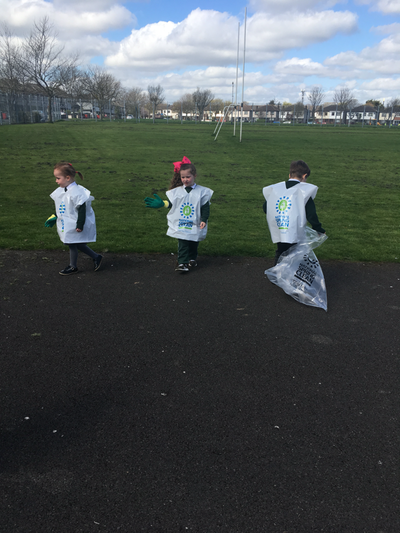 Today we talked about all the ways that we can keep our community clean - this included picking up litter. 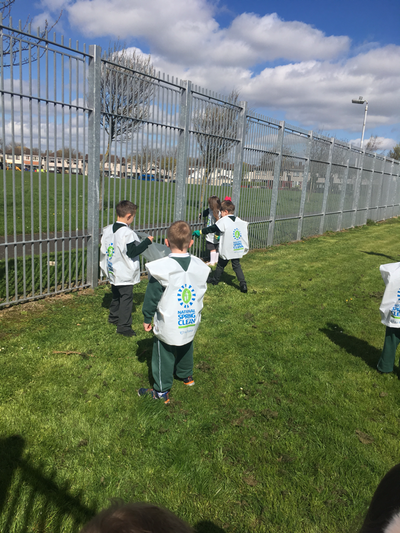 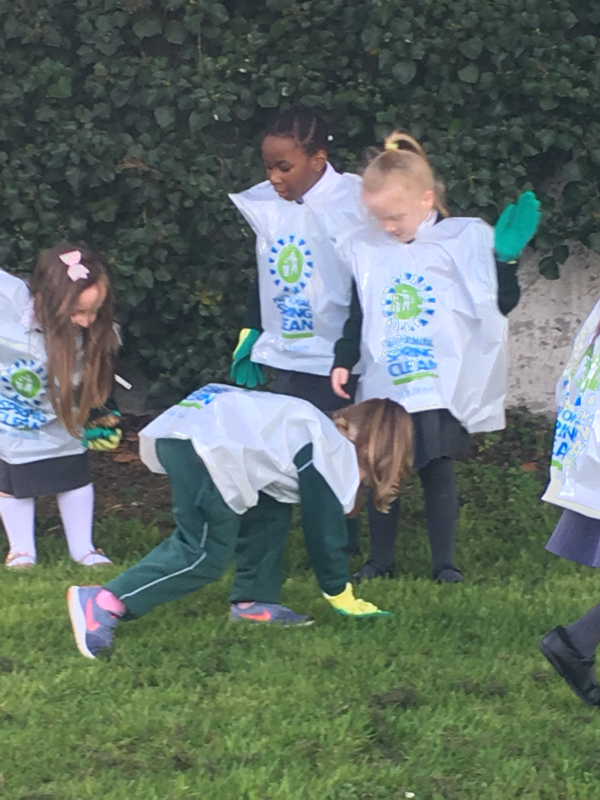 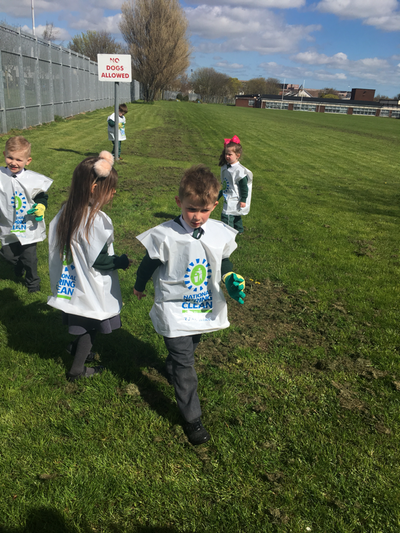 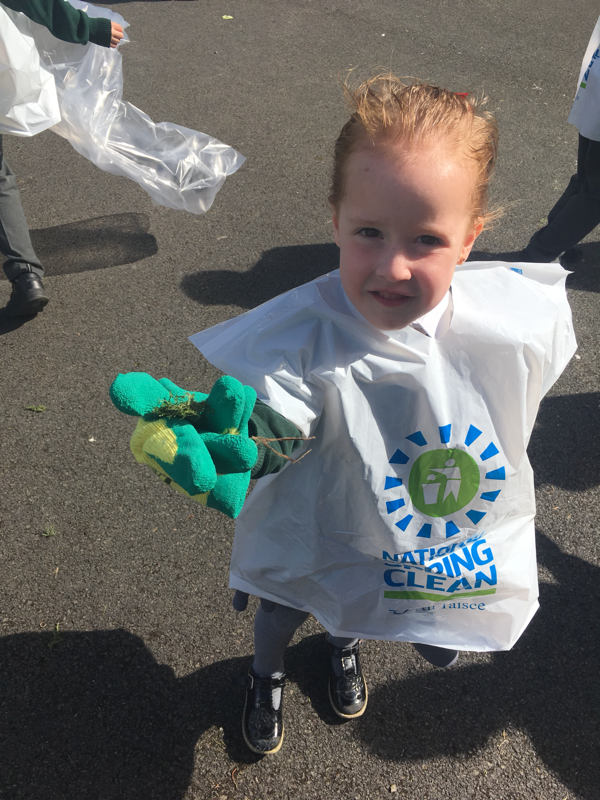 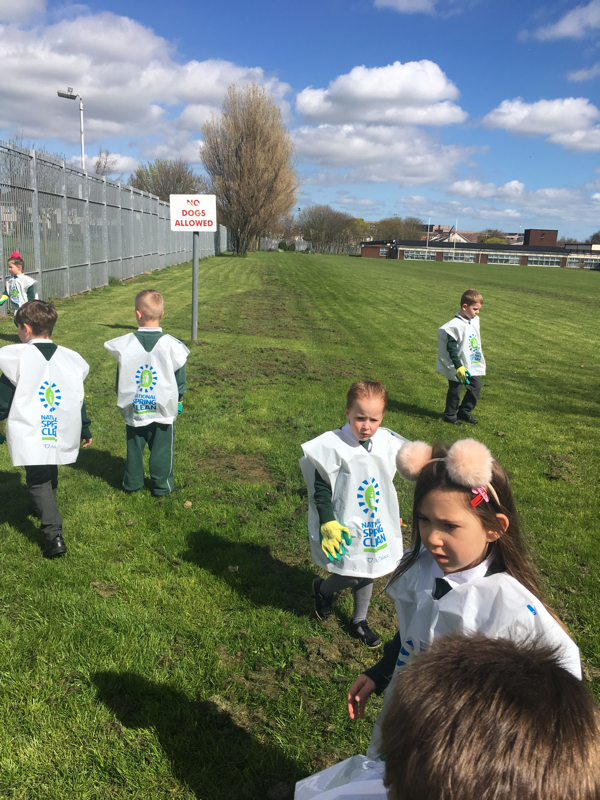 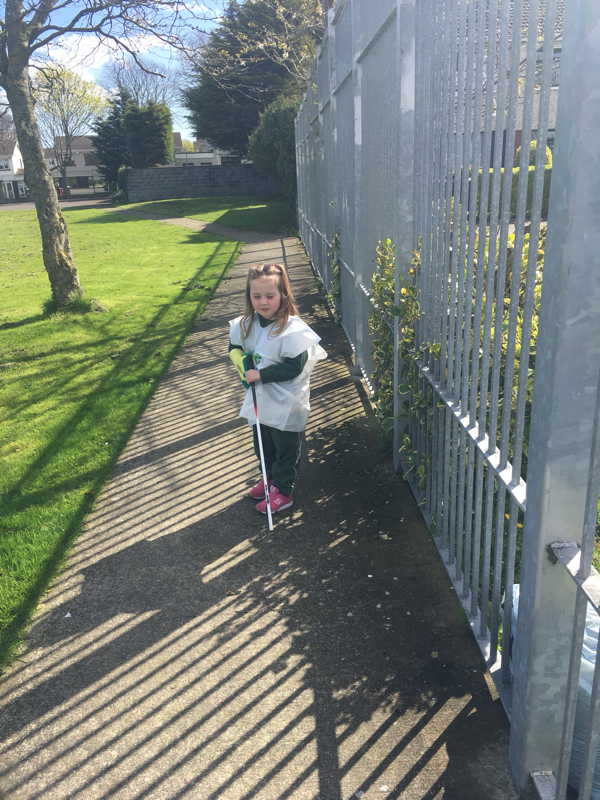 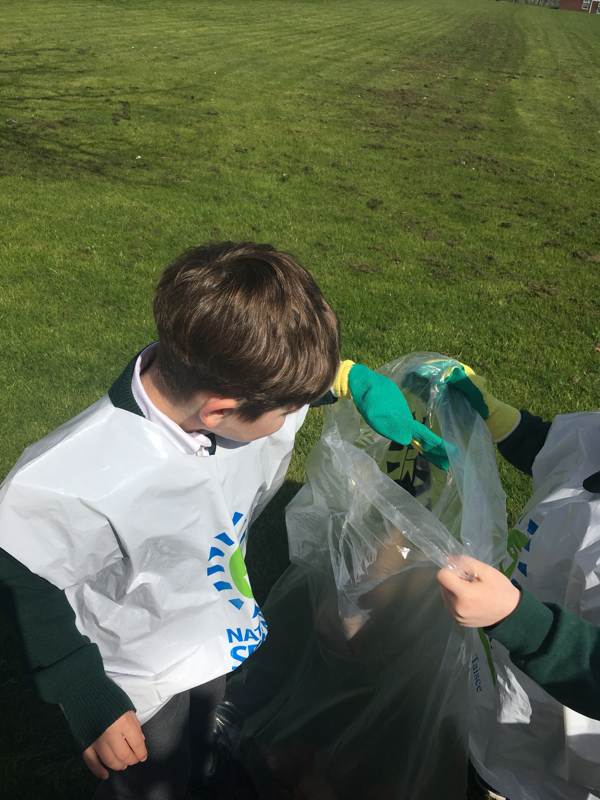 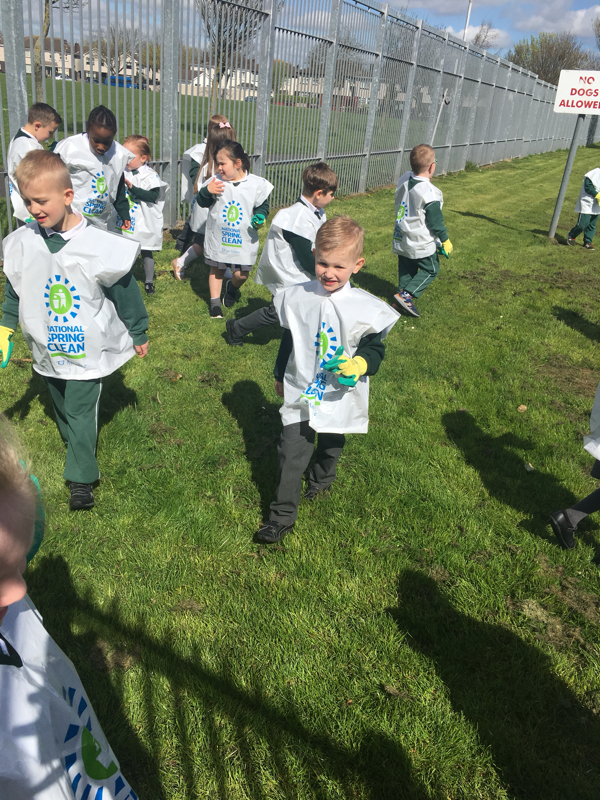 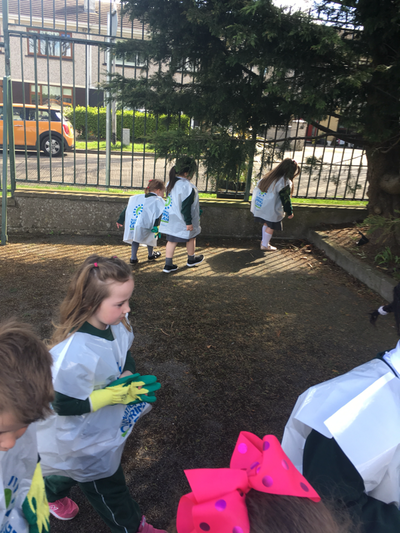 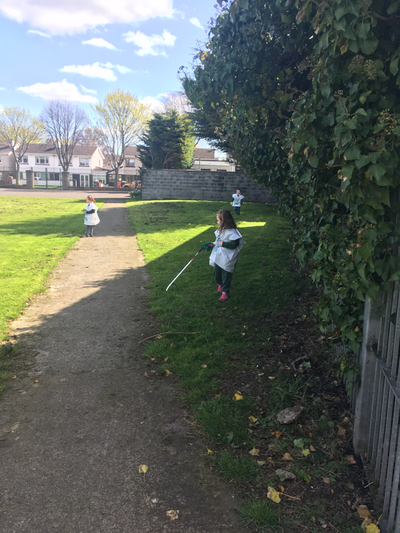 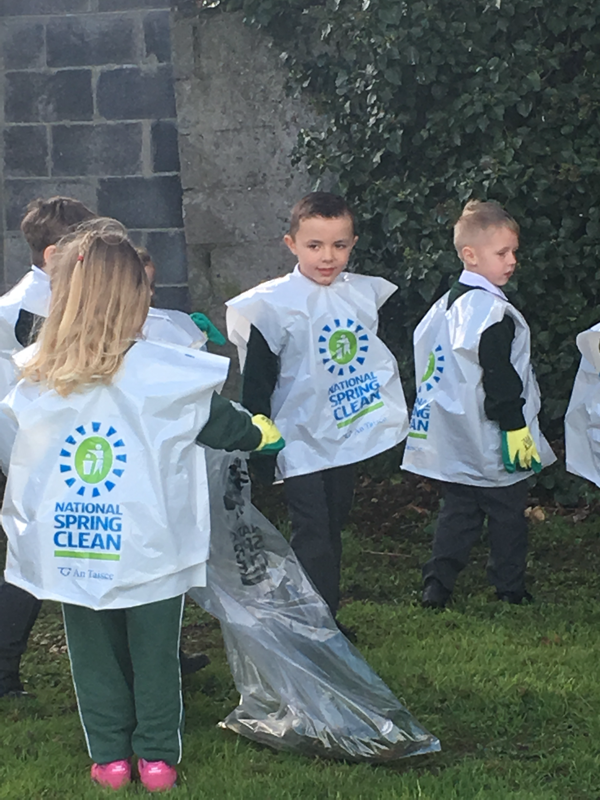 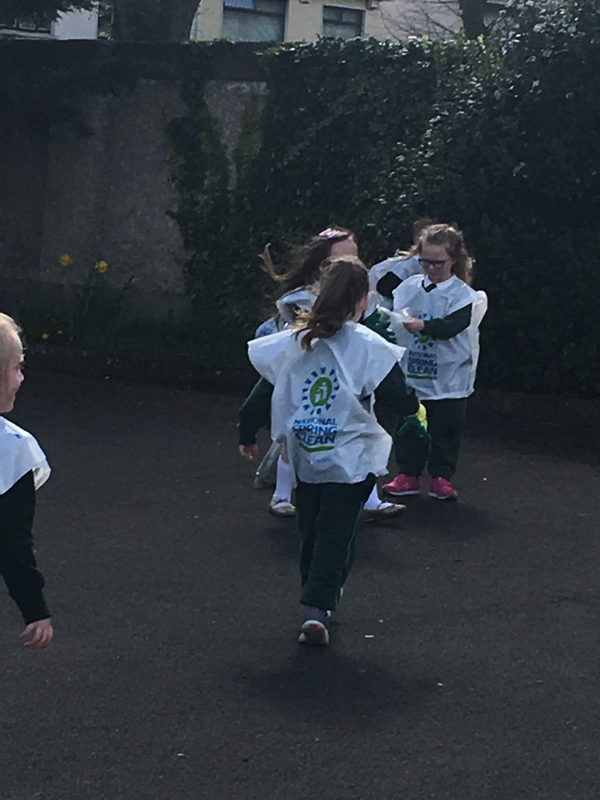 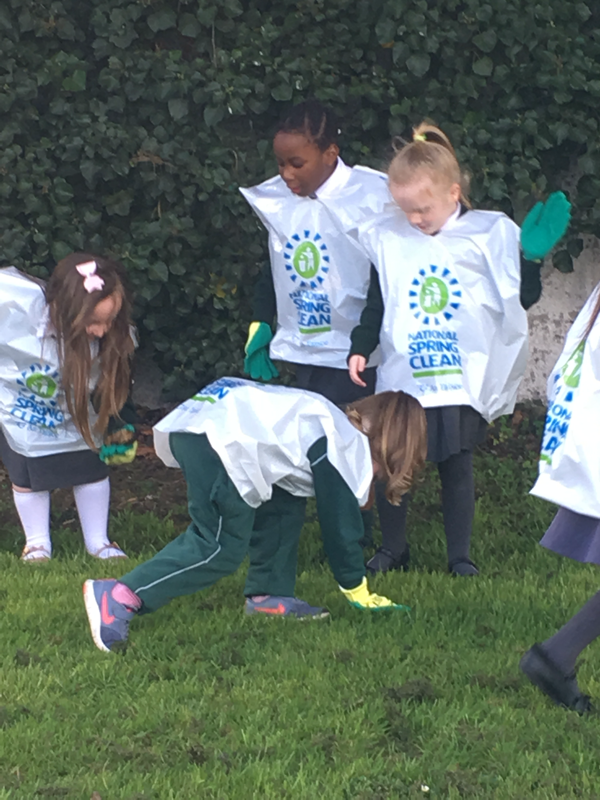 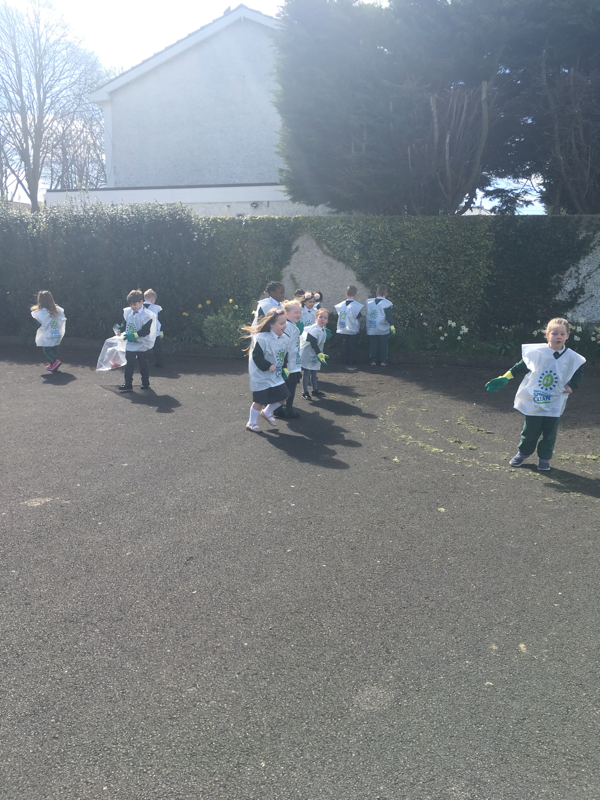 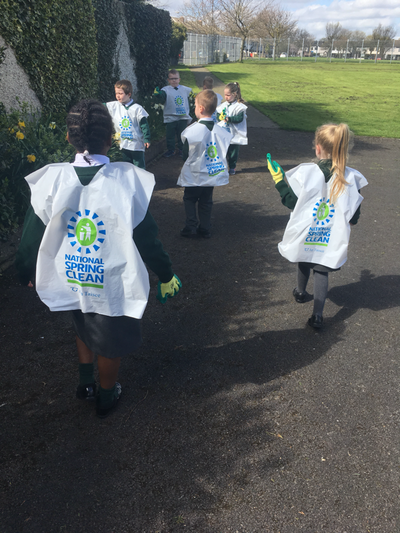 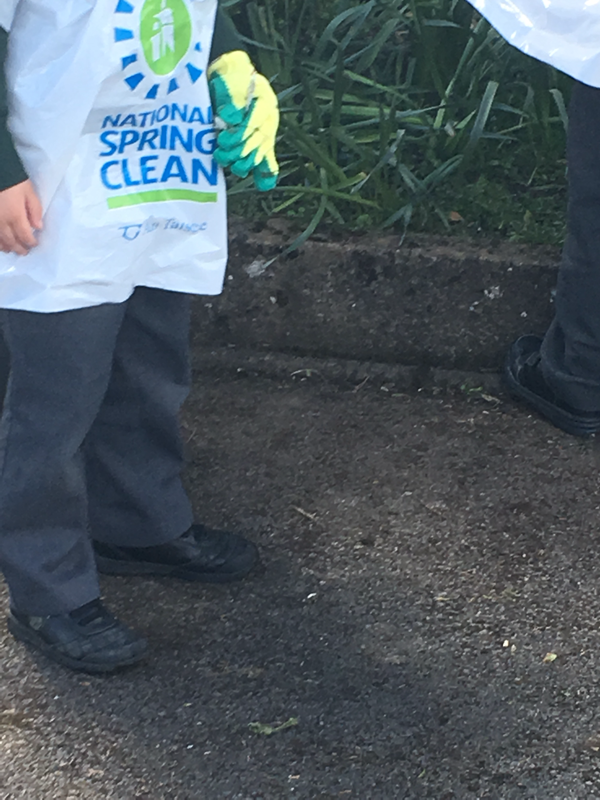 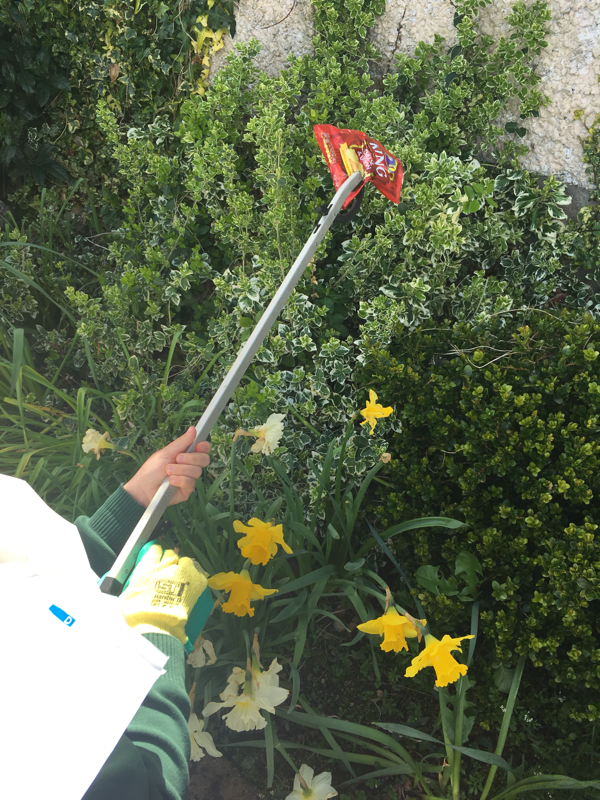 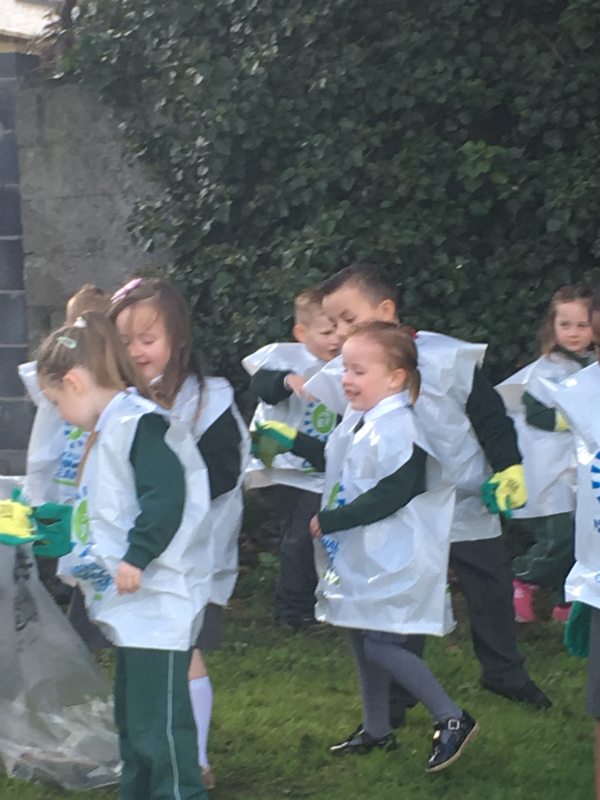 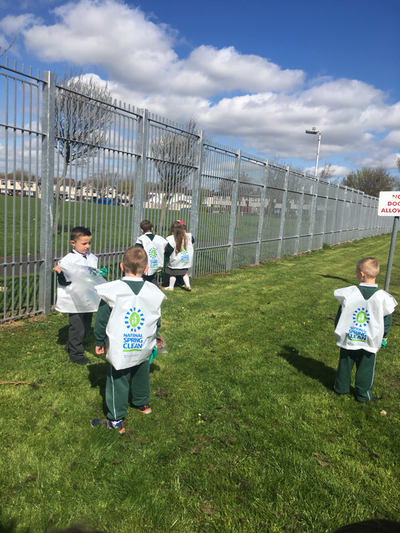 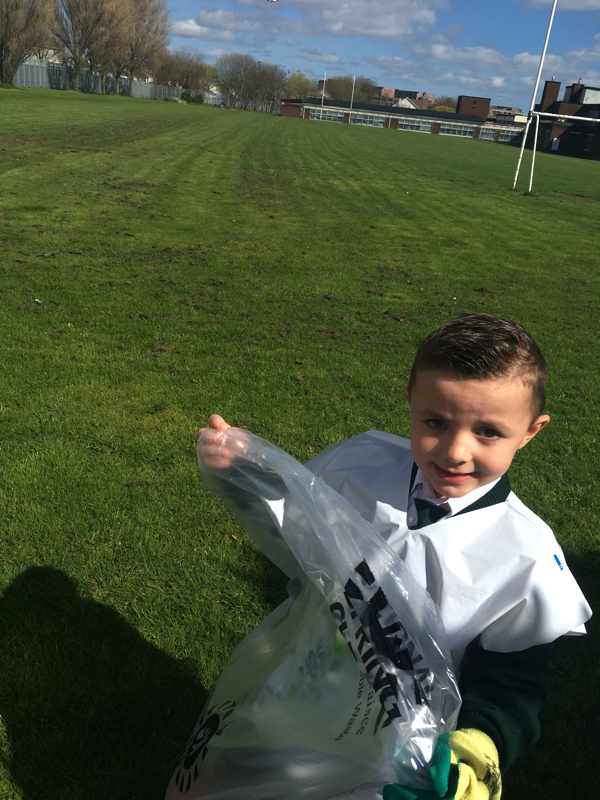 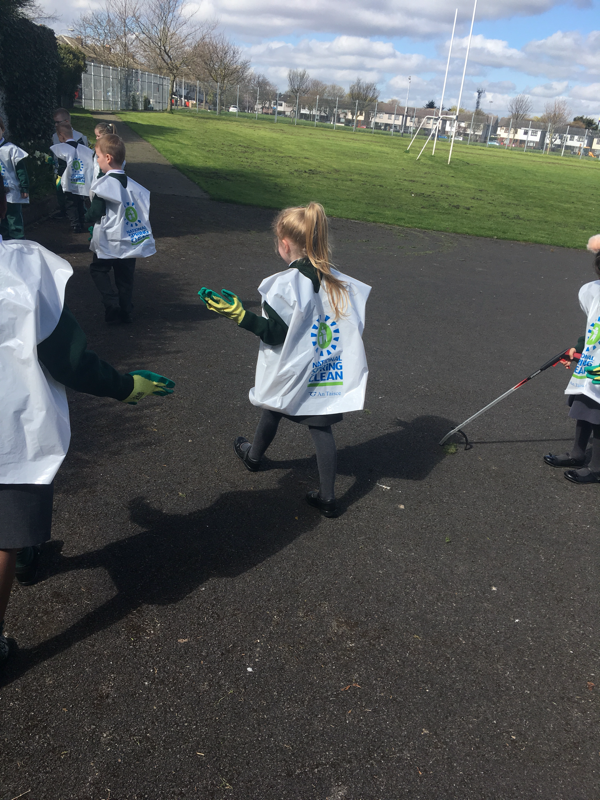 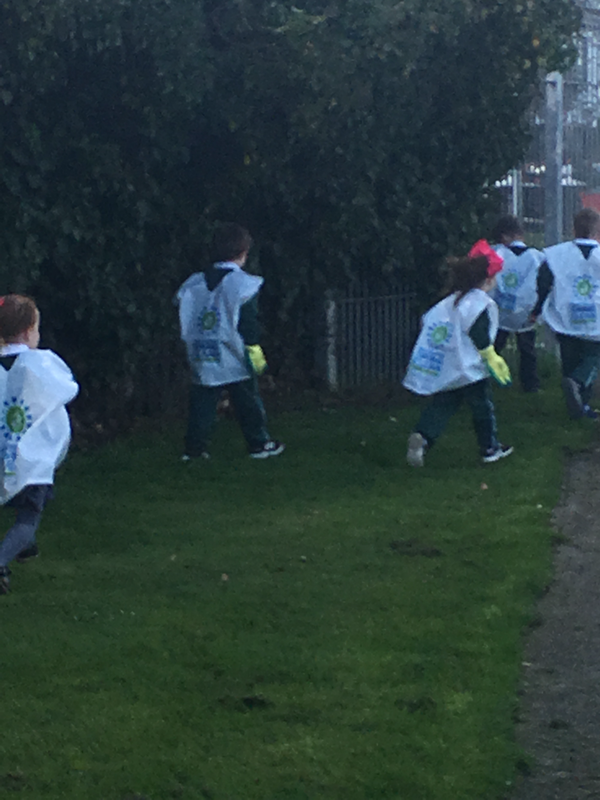 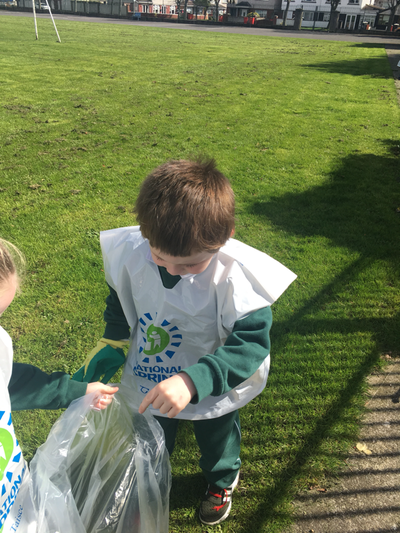 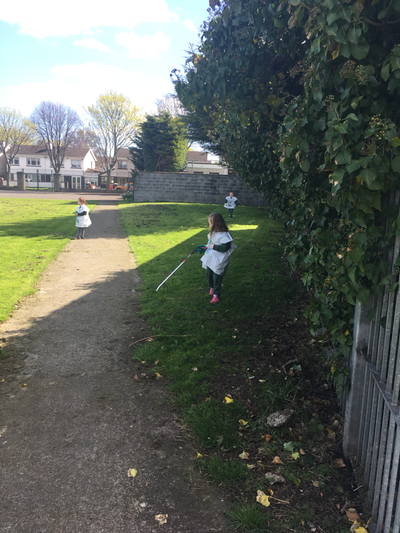 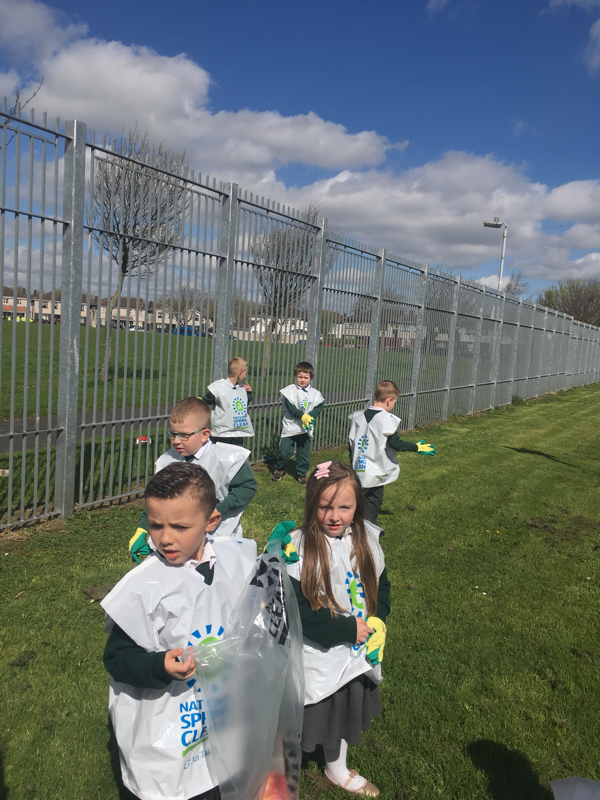 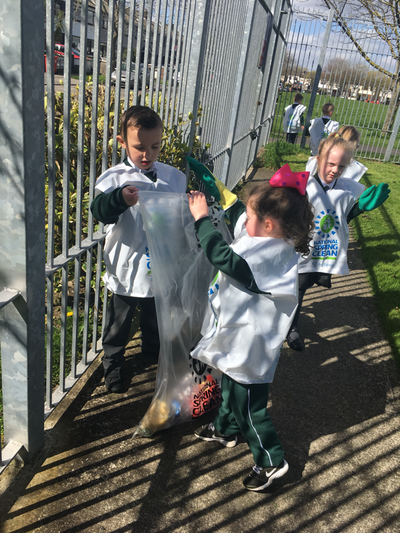 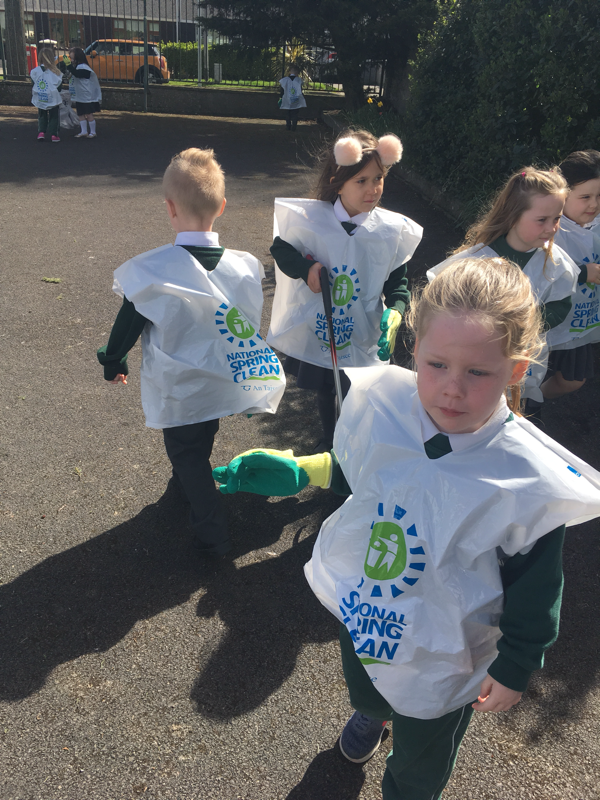 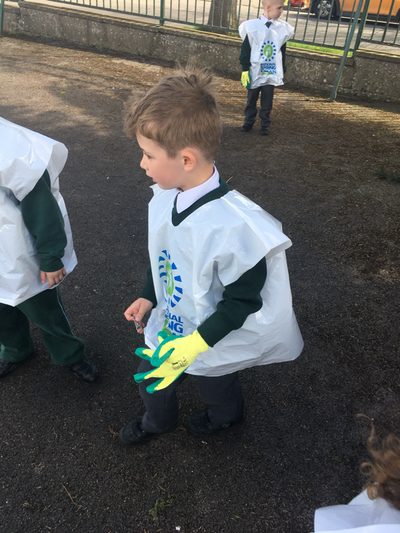 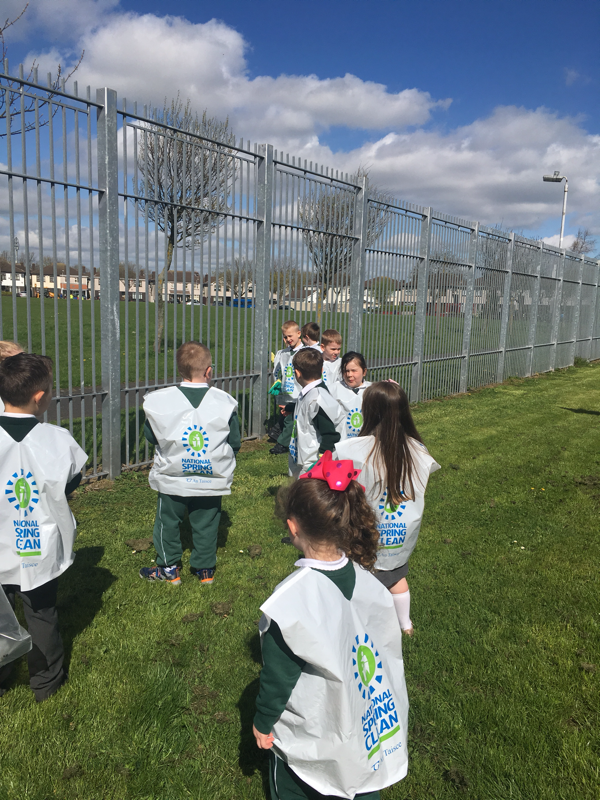 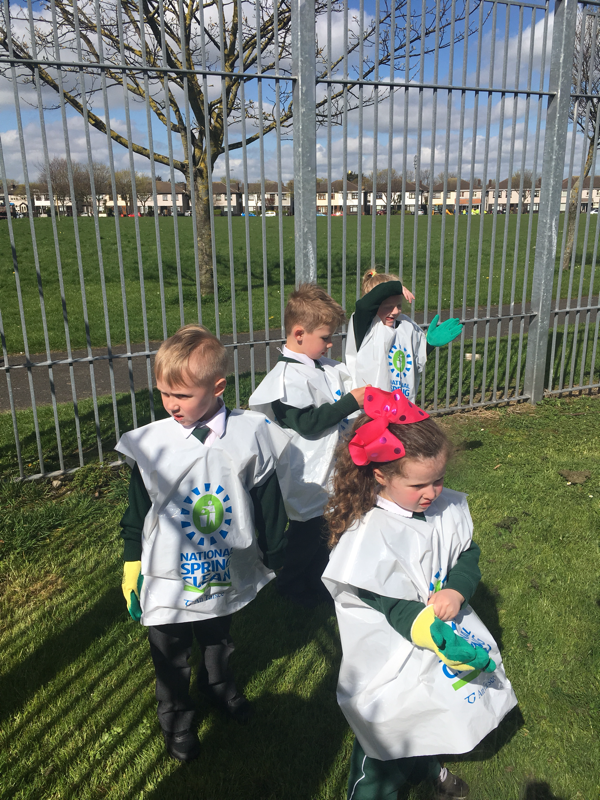 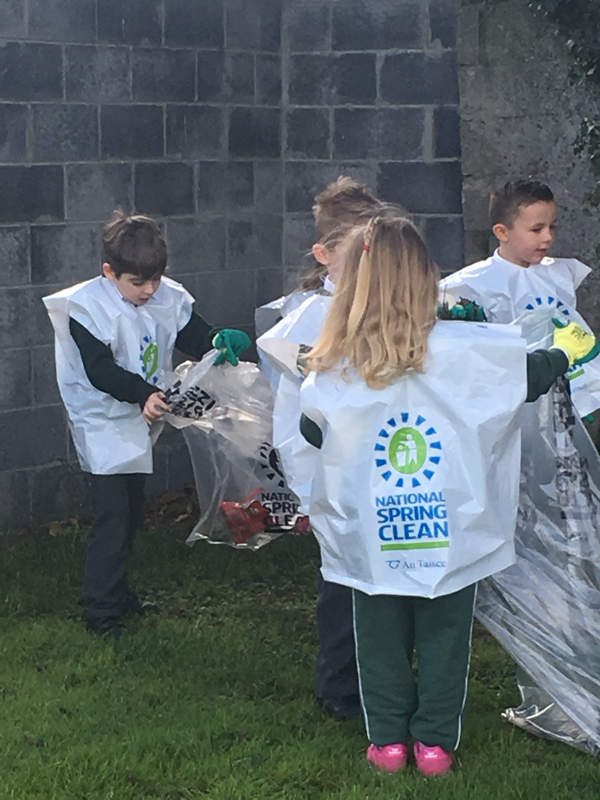 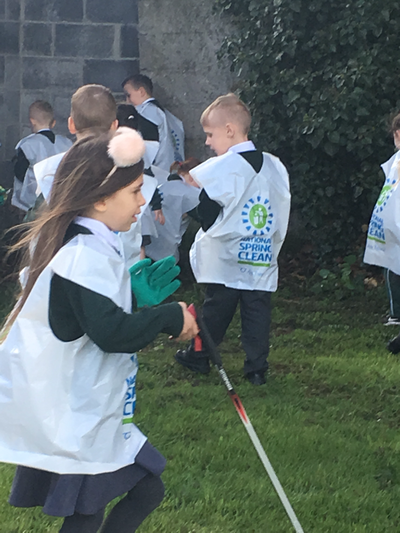 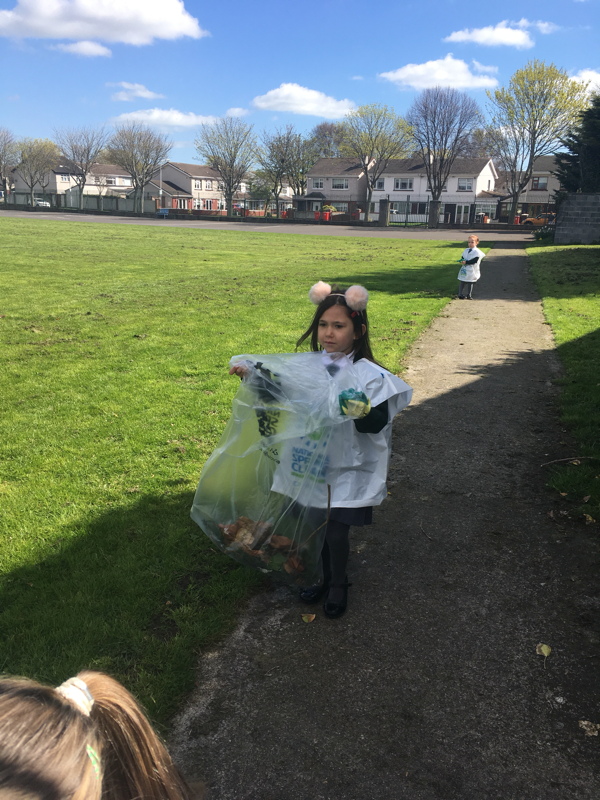 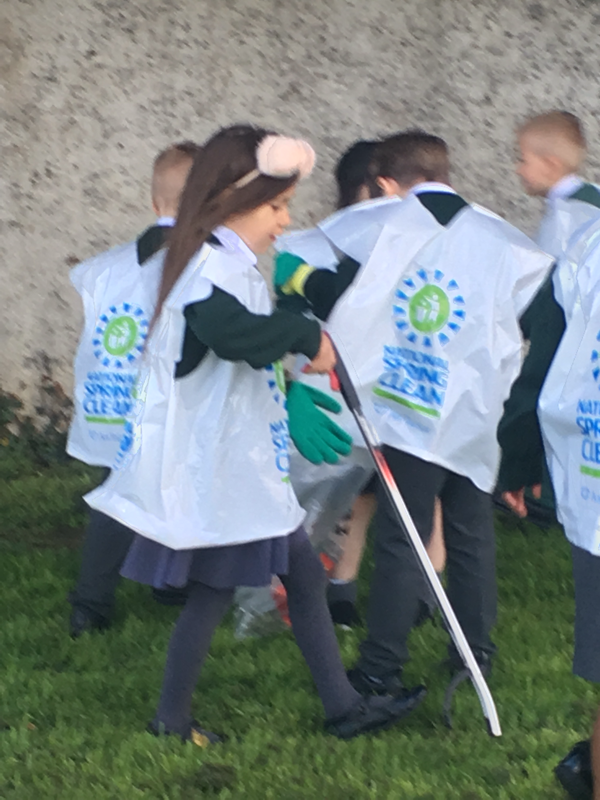 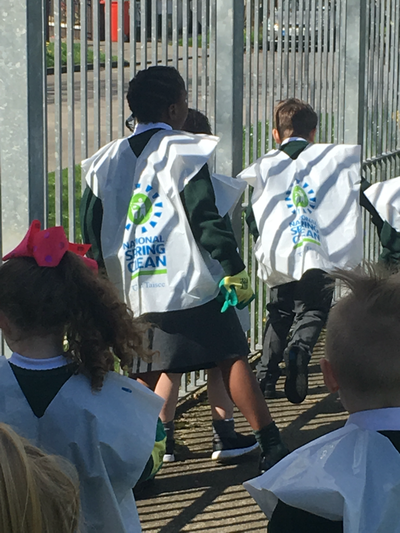 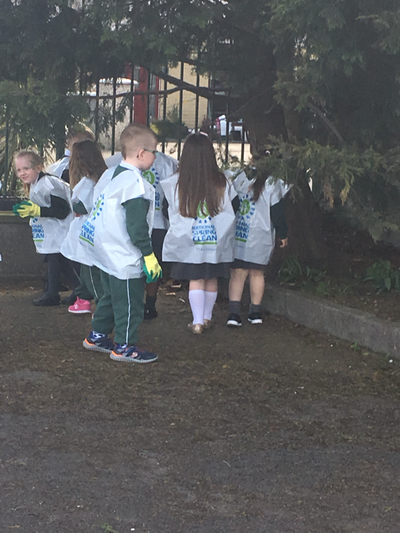 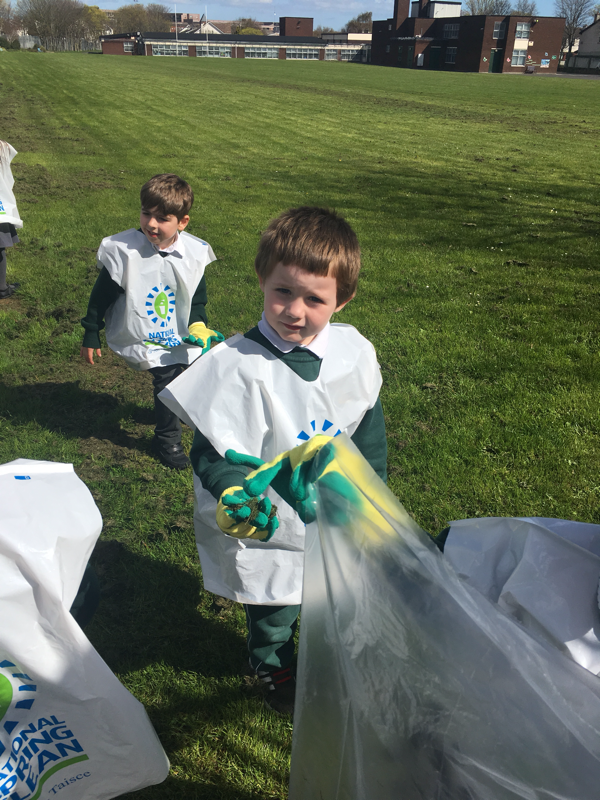 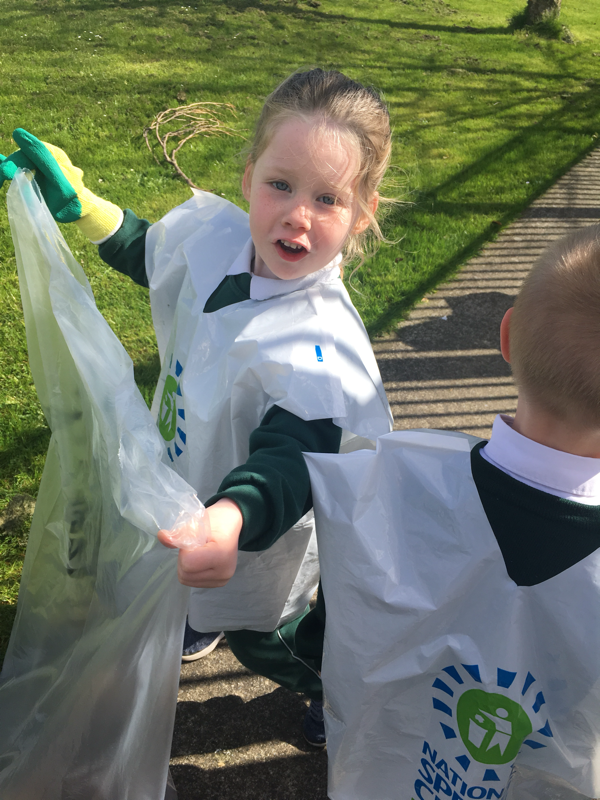 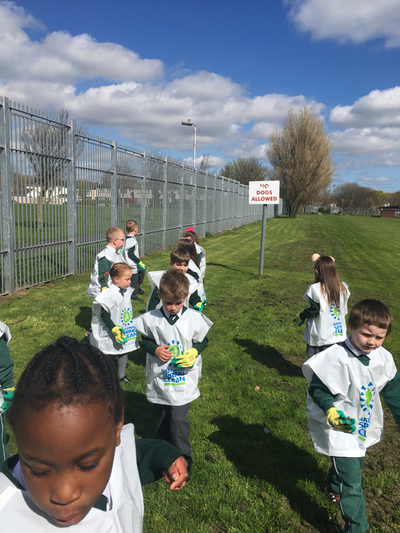 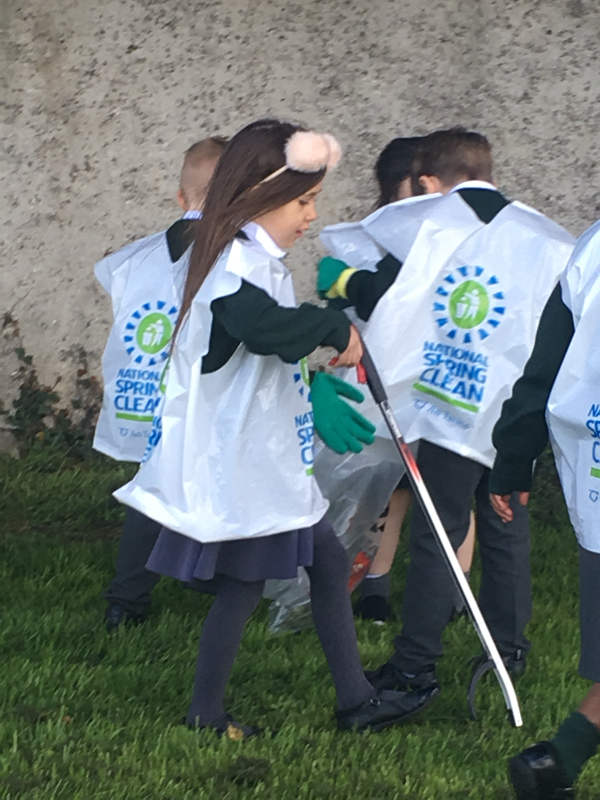 So we put one our Spring Clean bibs, gloves and took litter grabbers with us outside. 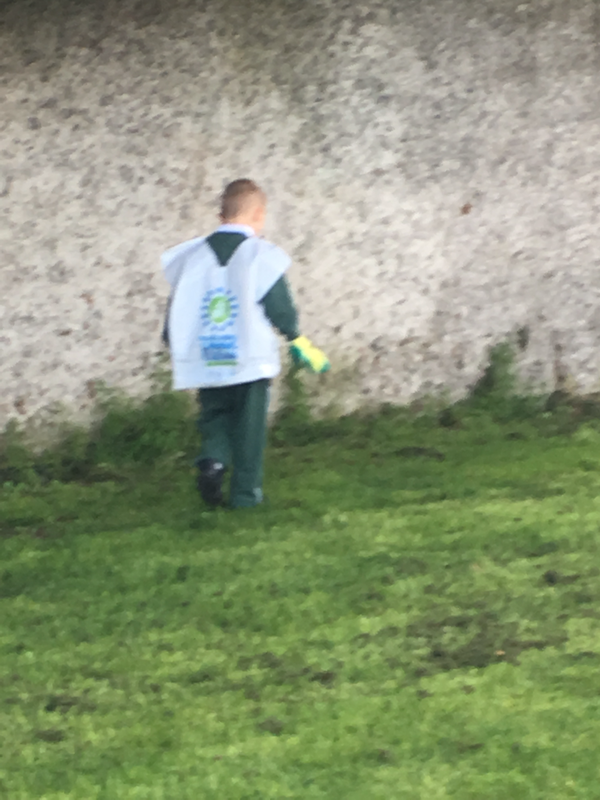 Robert keeps our school grounds very clean, we really had to search to find rubbish! 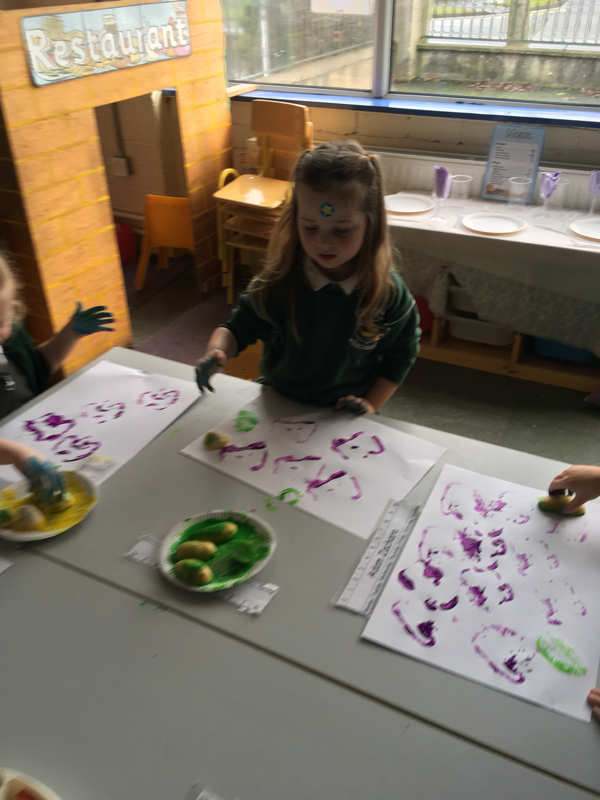 We had lots of fun looking though. 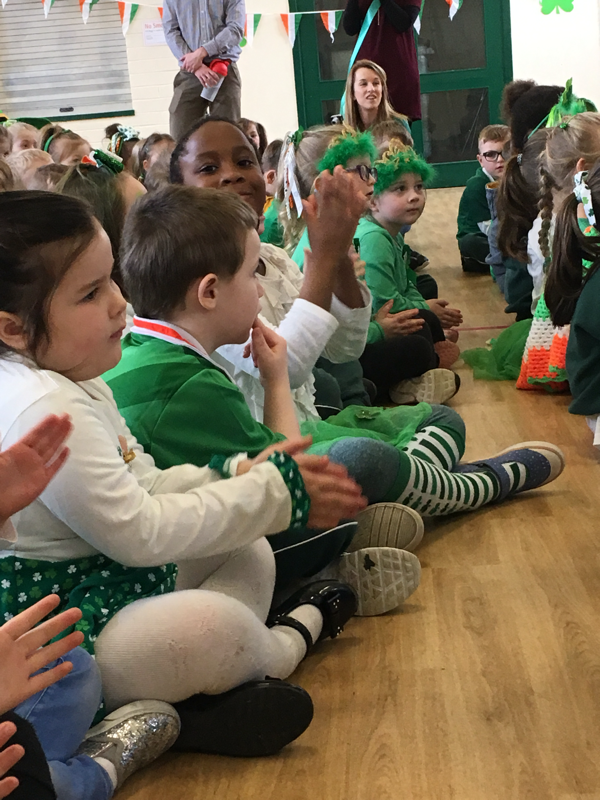 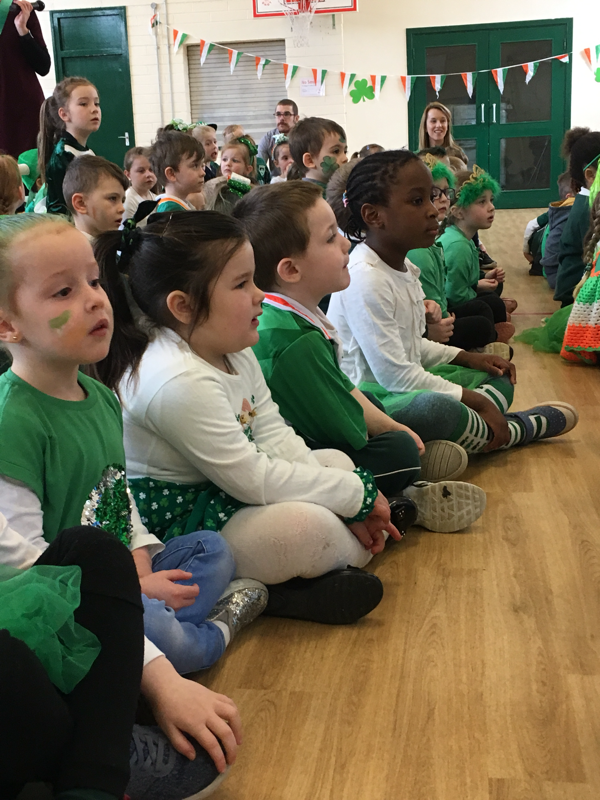 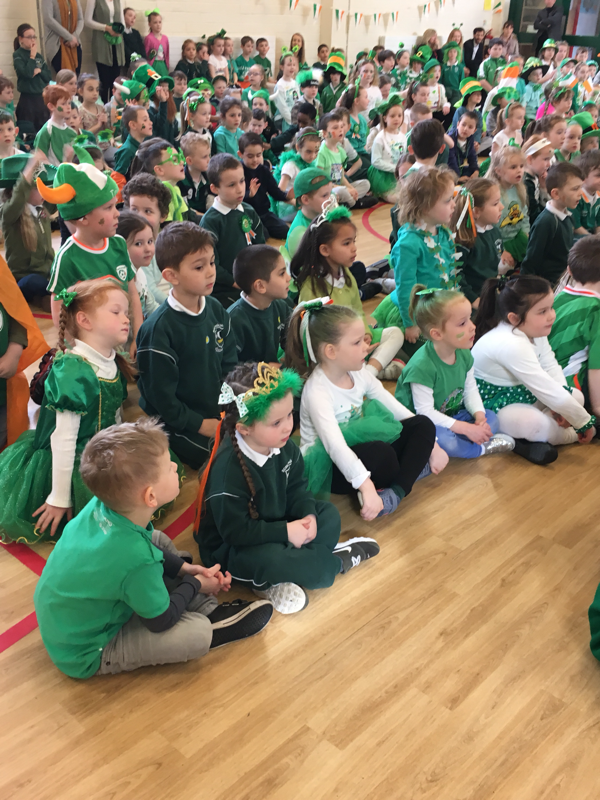 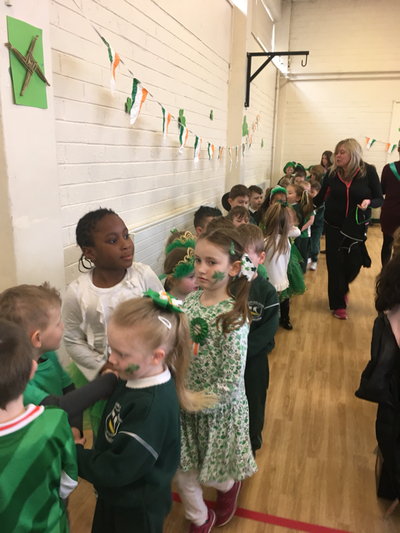 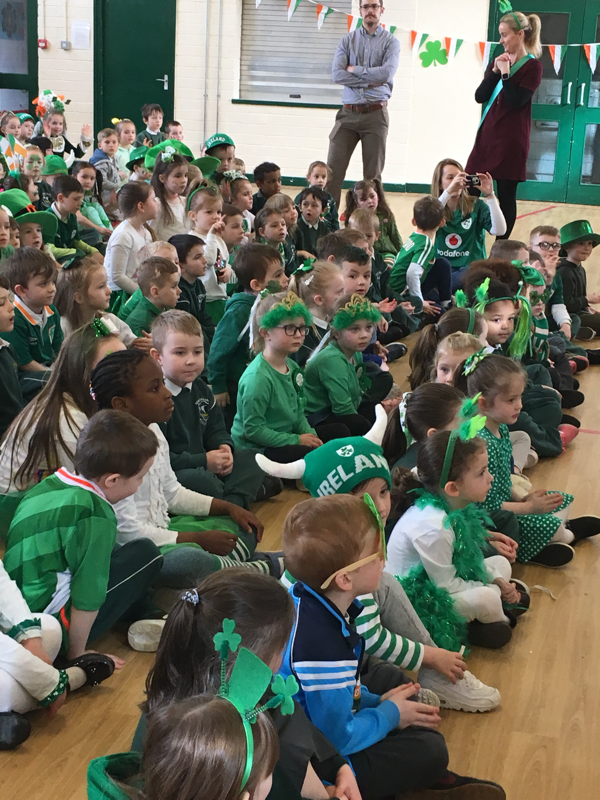 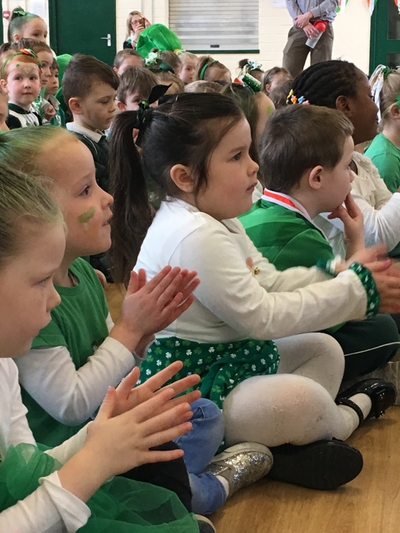 We had so much fun in school this week celebrating St.Patrick. 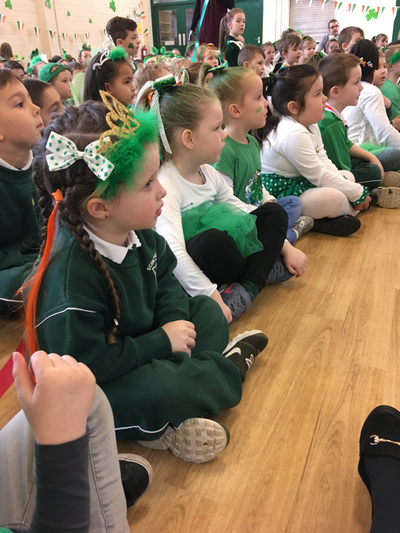 We learned about the story of St. Patrick and how he taught the people of Ireland about God. 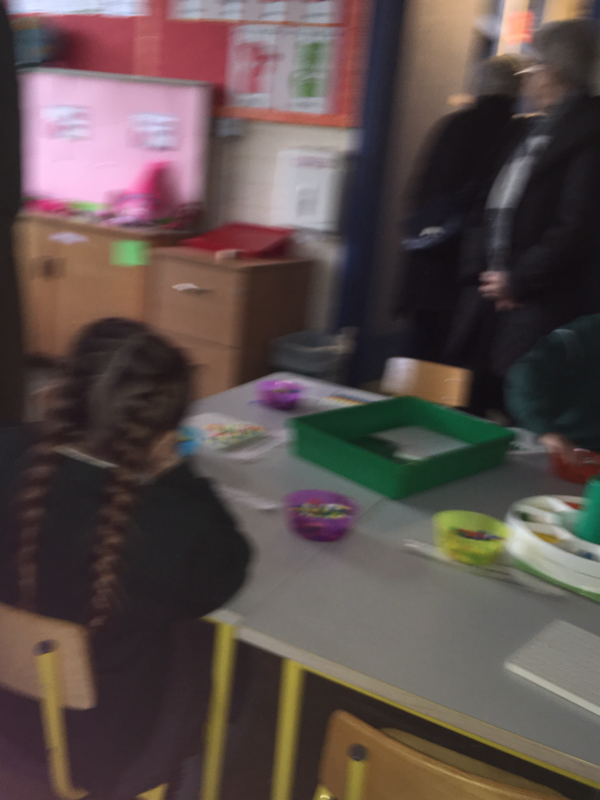 We made leprechaun masks also. 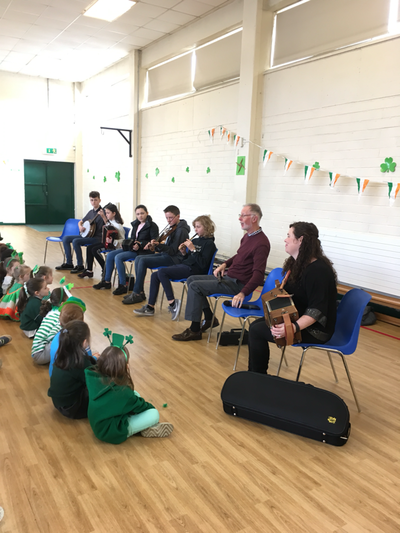 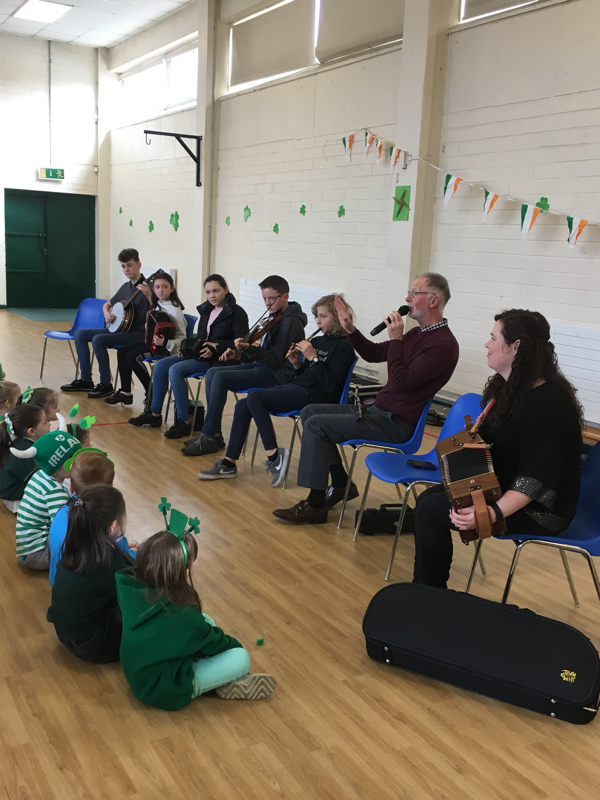 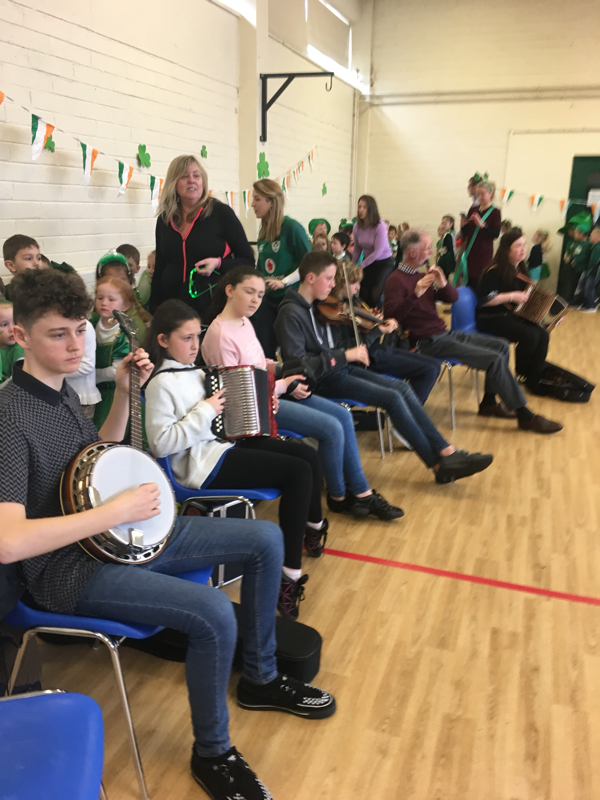 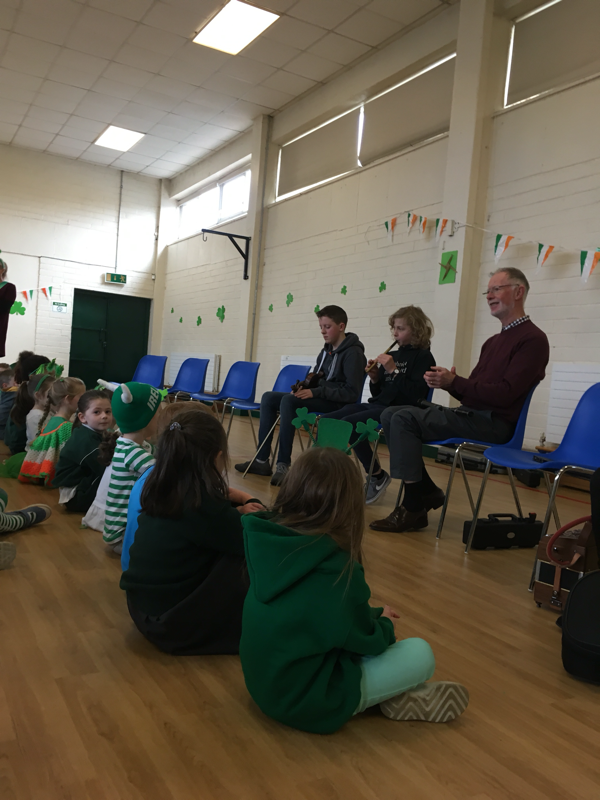 In the hall, musicians from Ceoltas Ceoltóirí na hEireann joined ya to play traditional Irish music. 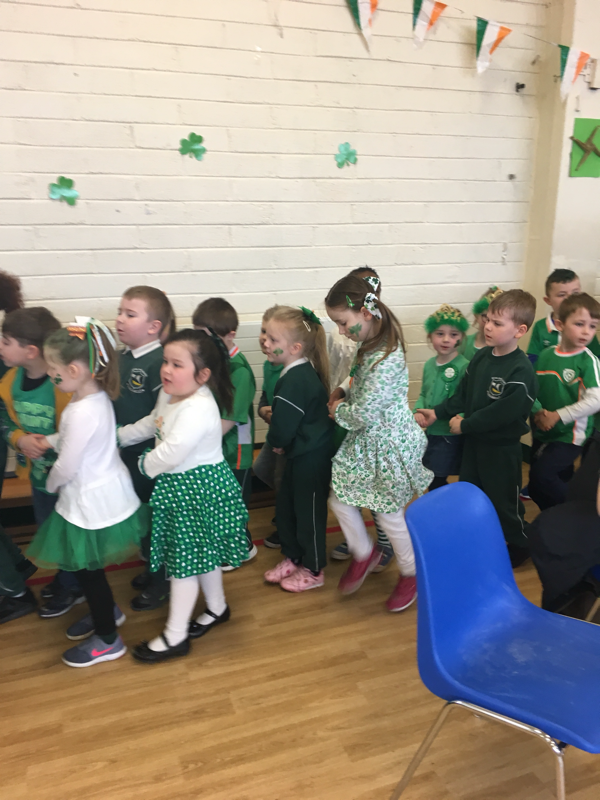 Over the past few weeks we’ve learned the dance Shoe the Donkey which we performed. 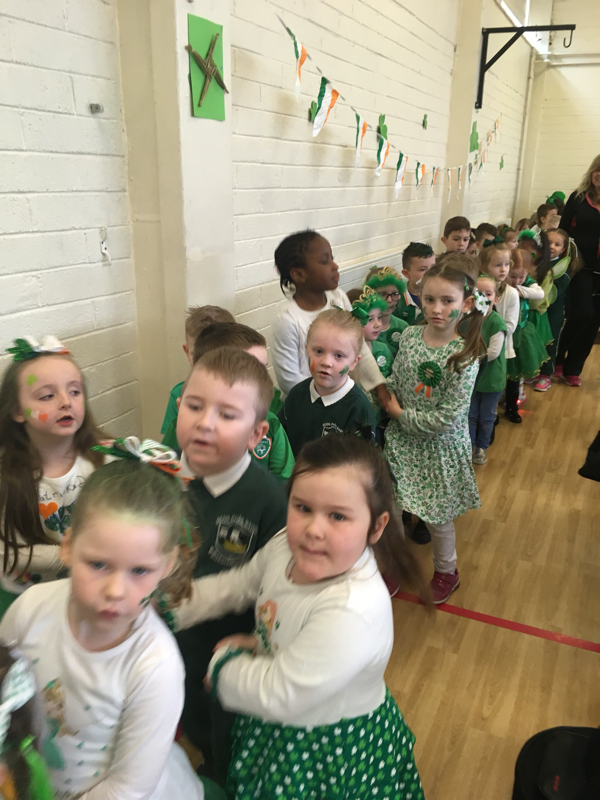 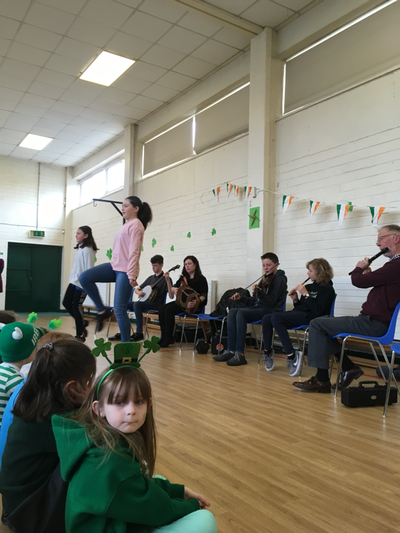 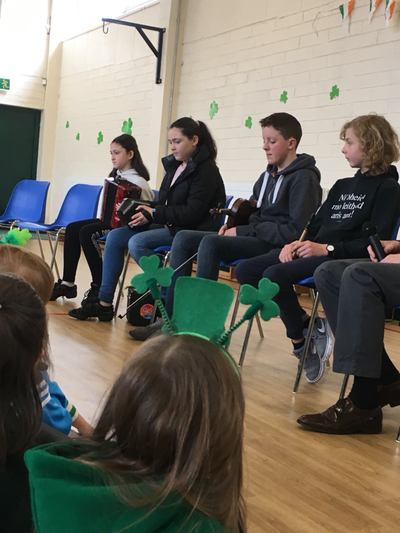 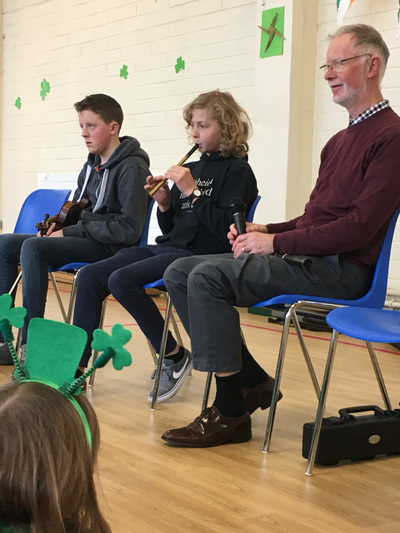 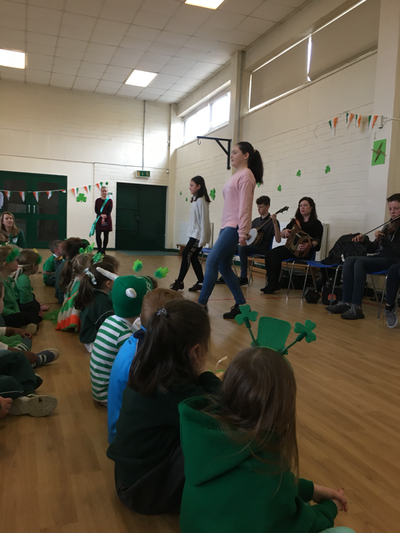 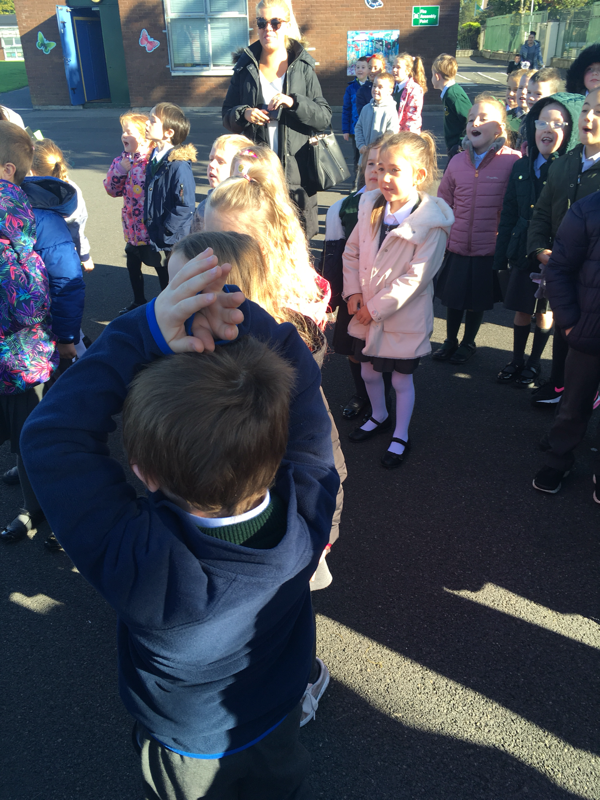 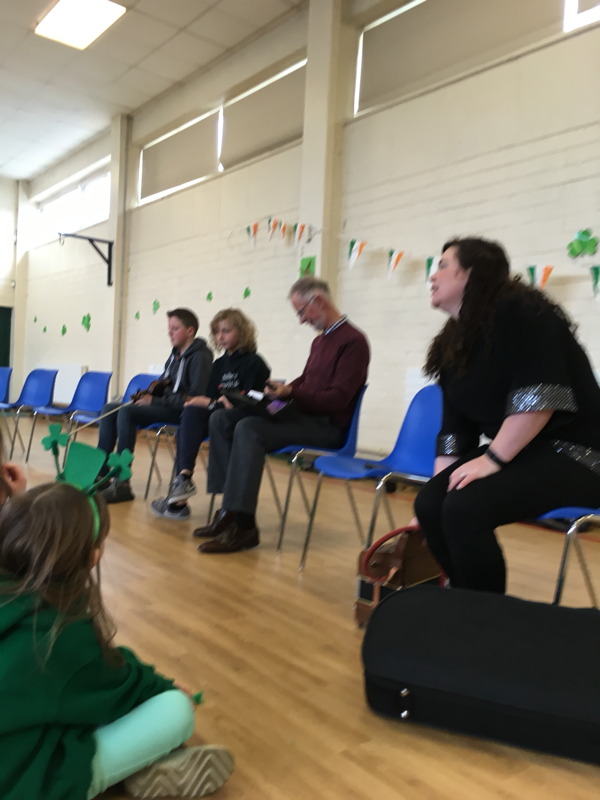 Later in the day, we sang the song Bosca Lóin to the whole school. 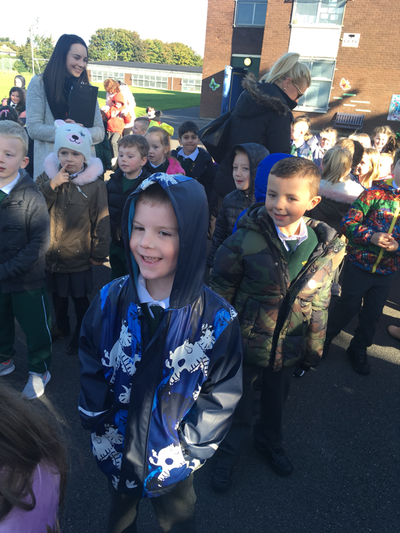 We had to cancel our sponsored walk on Thursday as it was raining but we were delighted to go on Friday. A big thank to all our grown ups for having us dressed up for three days!!!! 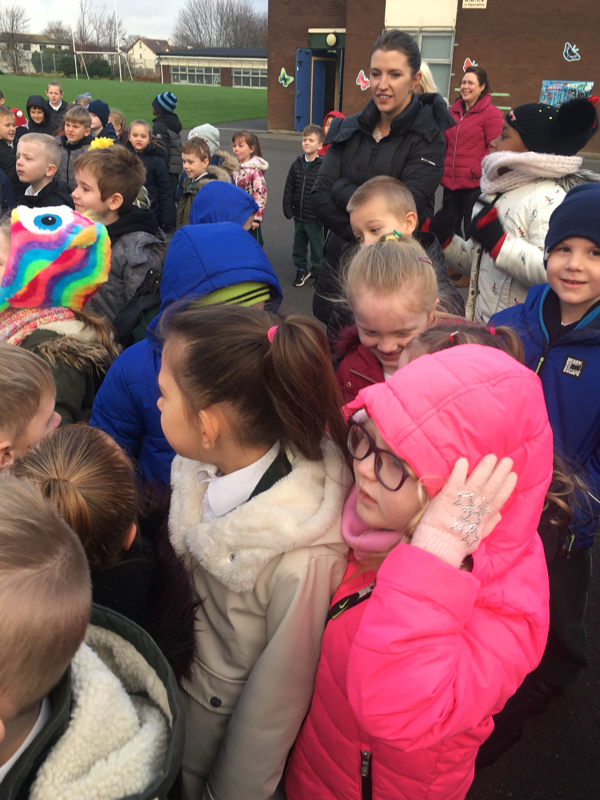 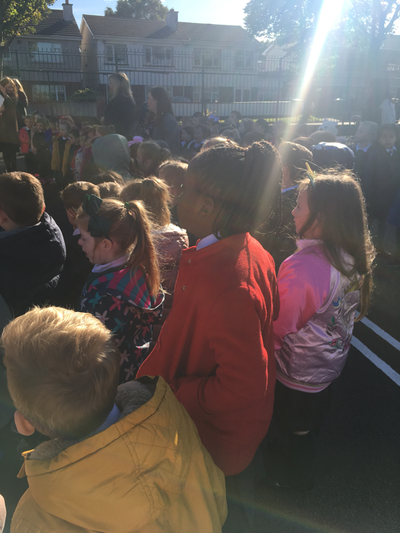 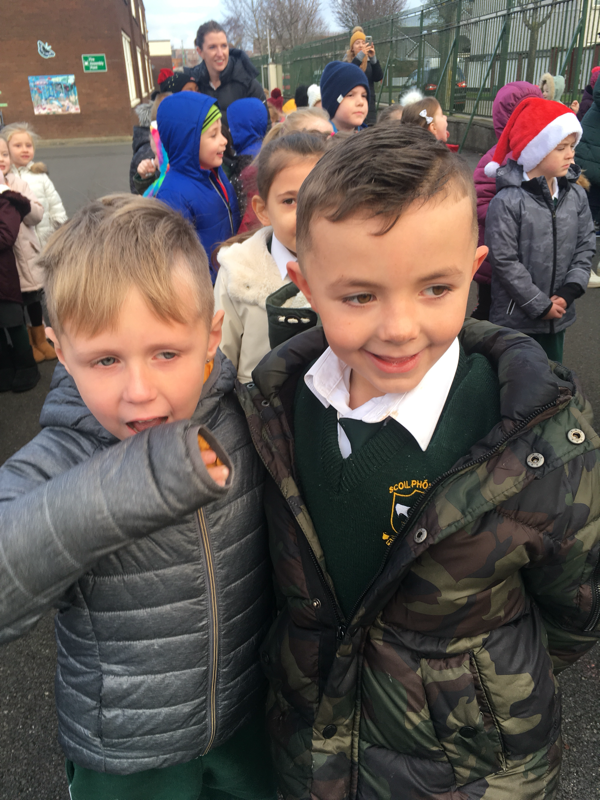 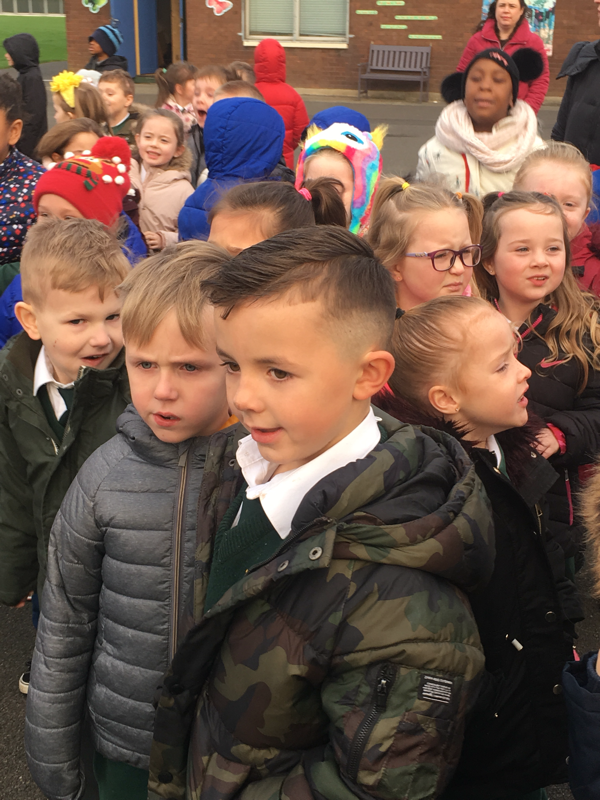 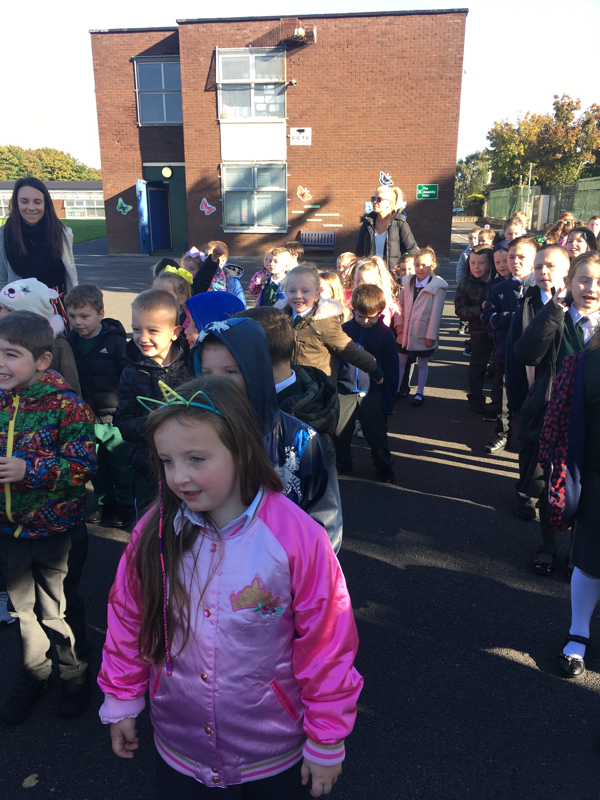 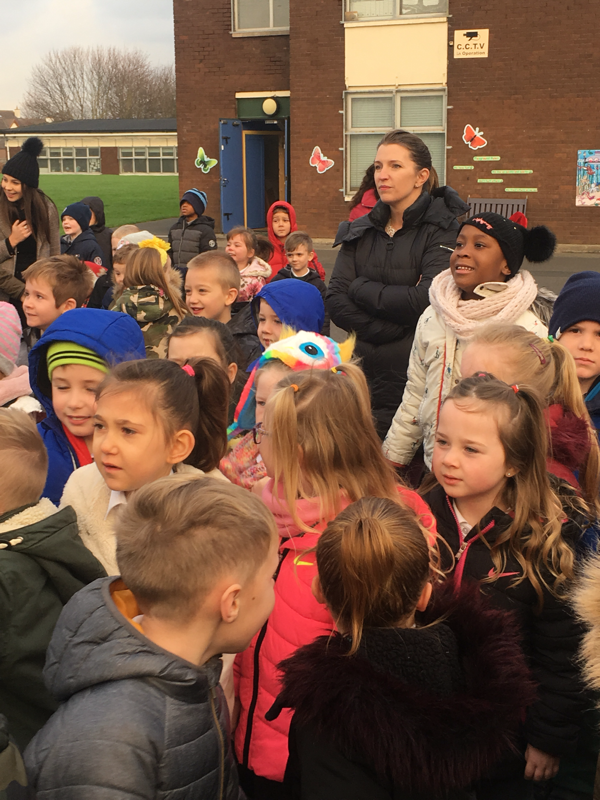 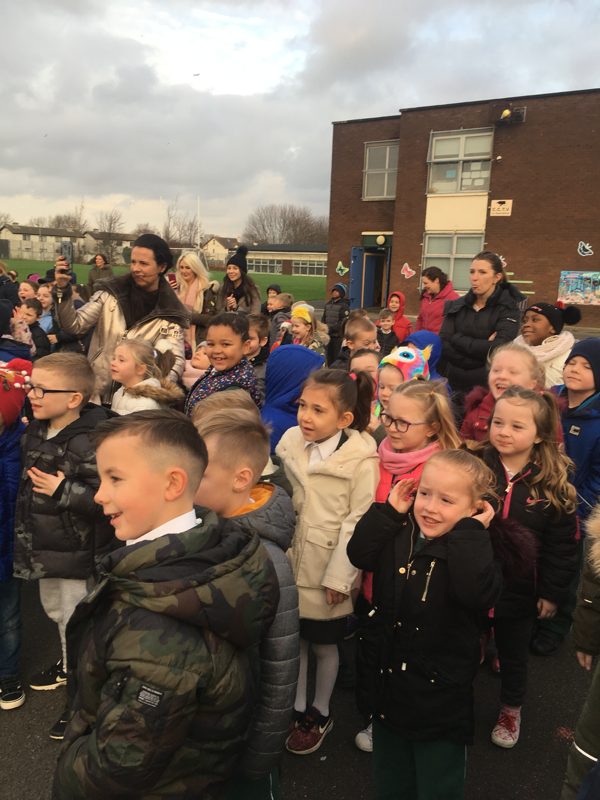 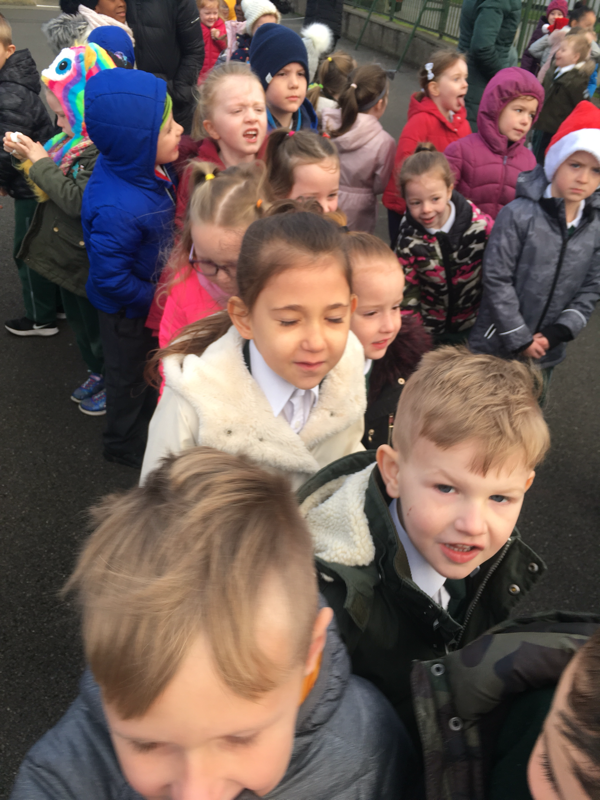 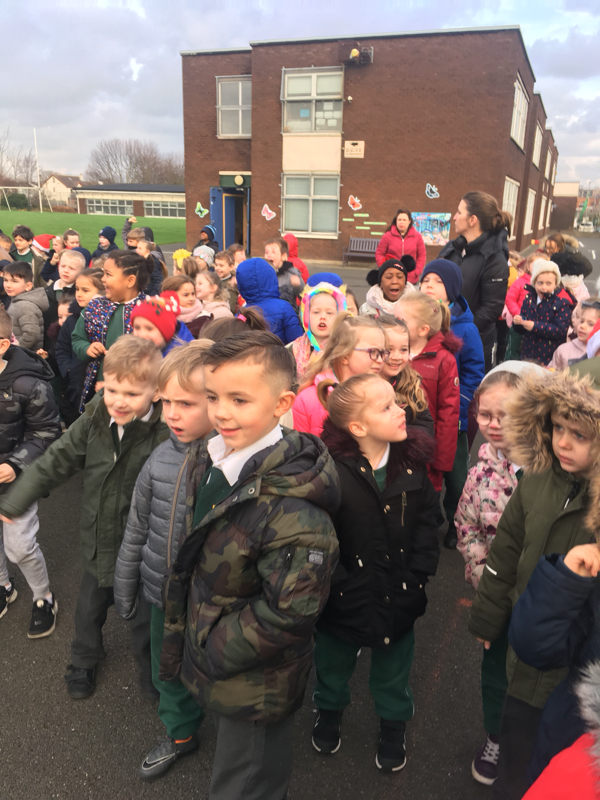 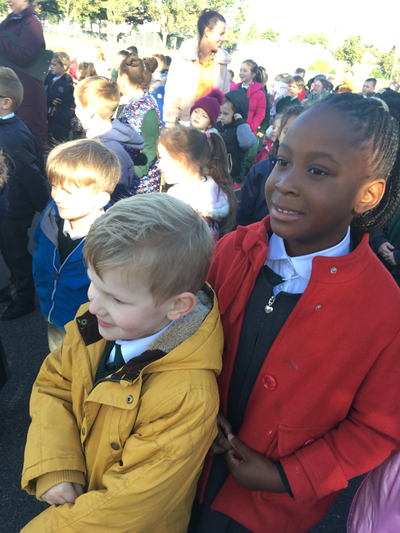 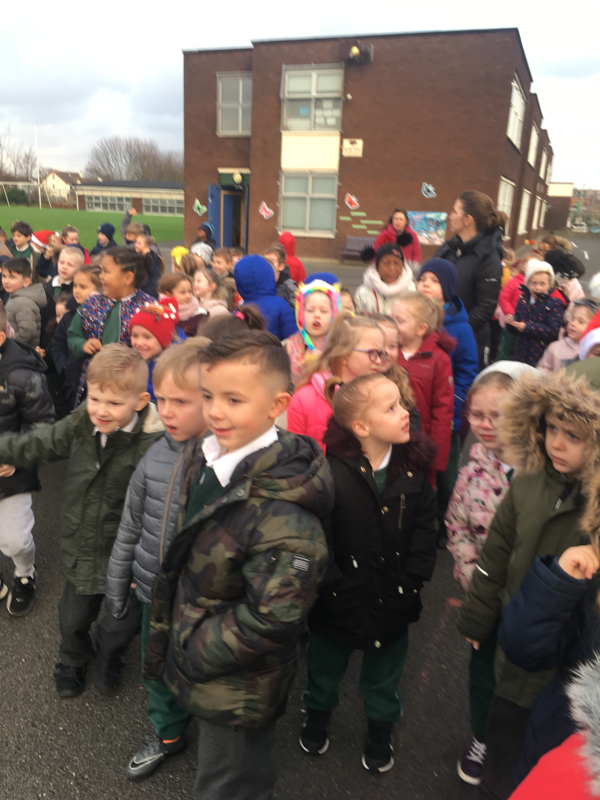 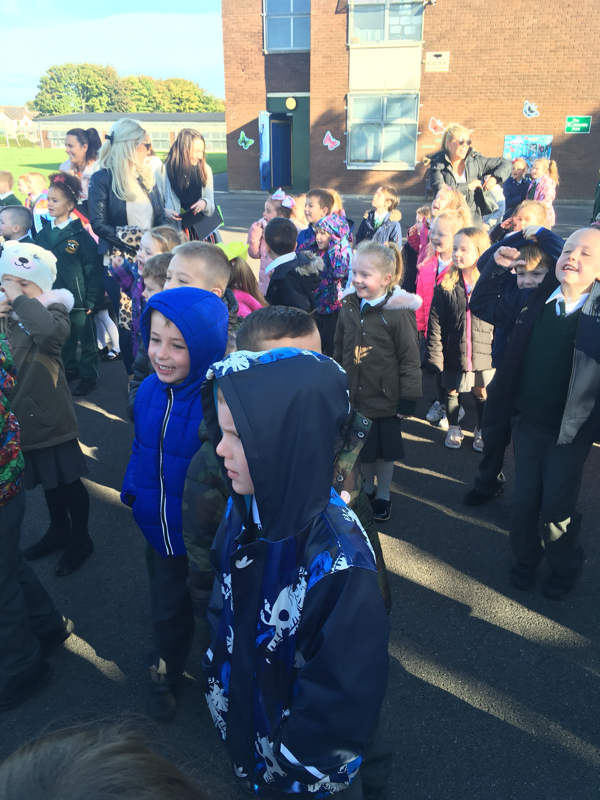 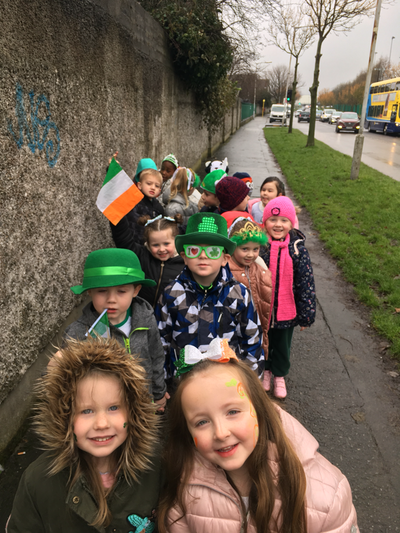 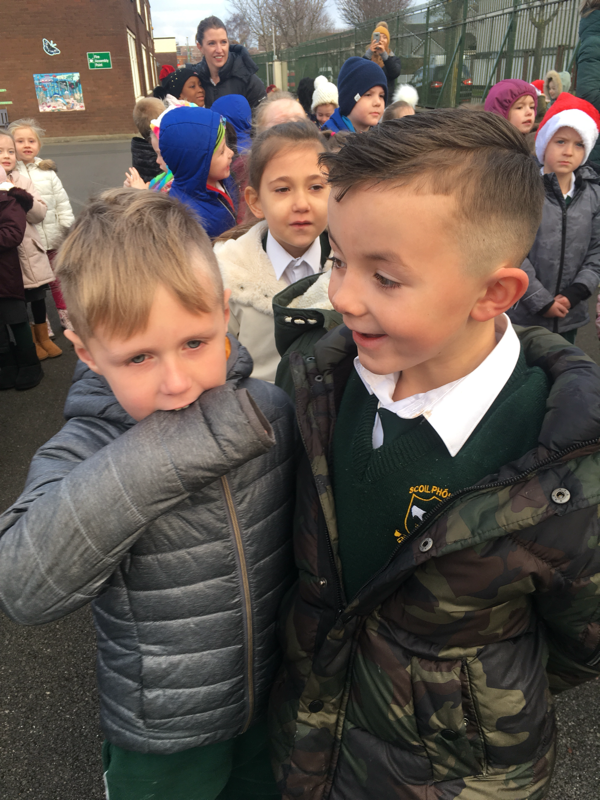 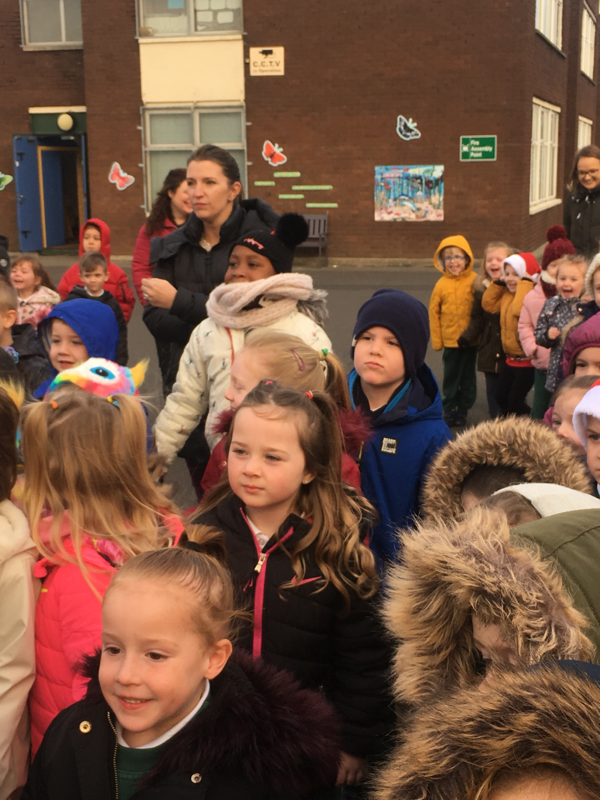 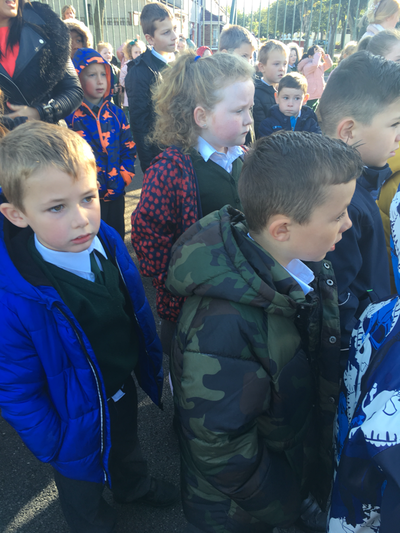 Thank you also to those who contributed to our sponsored walk, the money is really appreciated and goes towards the development of our school. 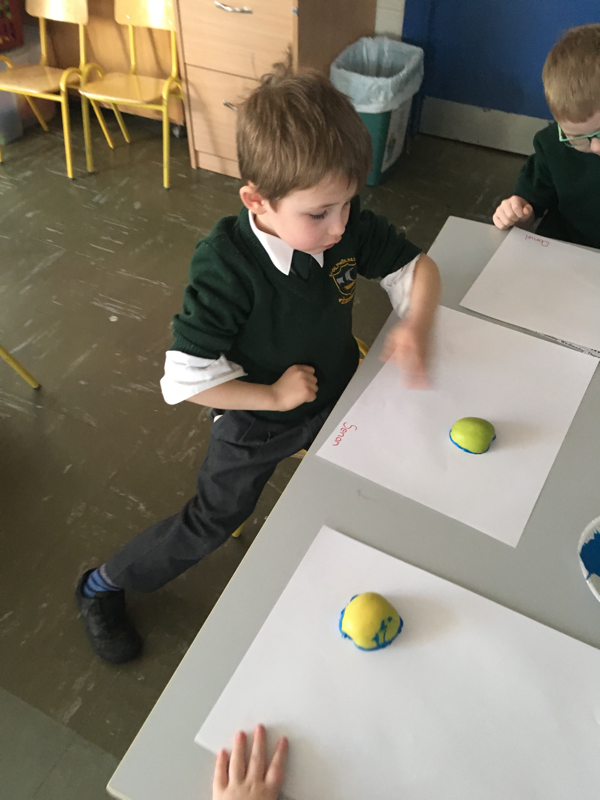 As part of Science for the month of February we will be using and investigating with magnets. 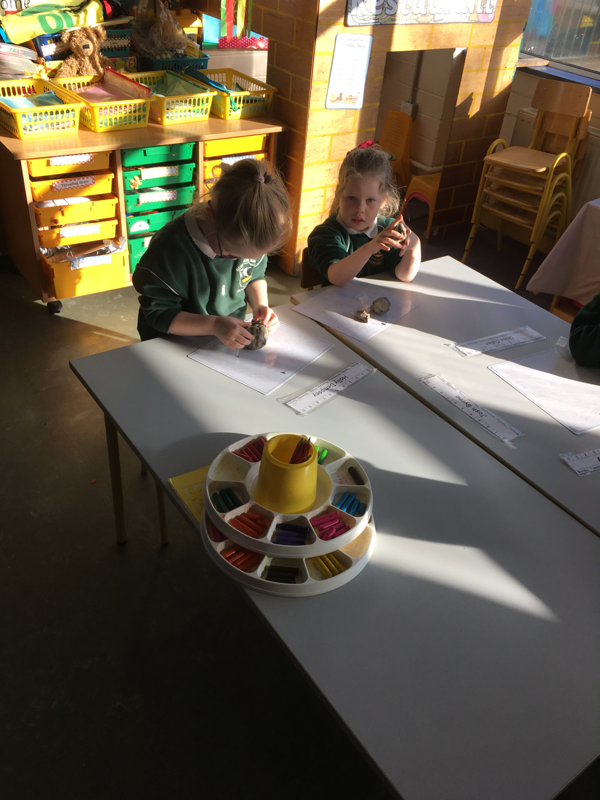 On Friday, we used the magnets in our classroom and on the corridor to find out which objects the magnets were attracted to. 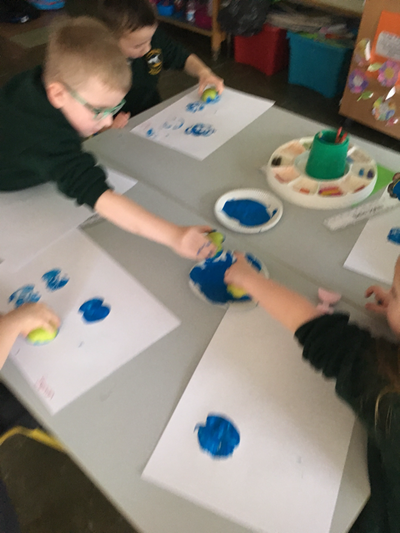 We are busy today making a surprise with clay for Valentines Day!! 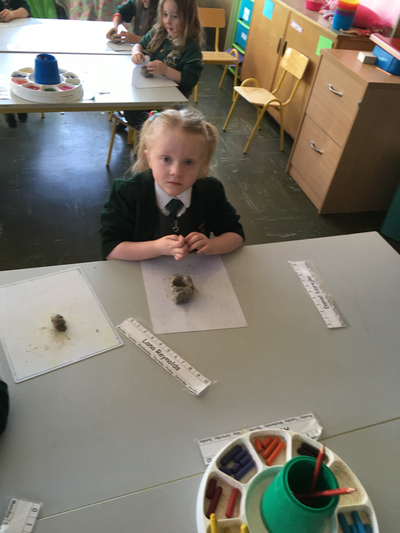 It was hard work using the clay but lots of fun! 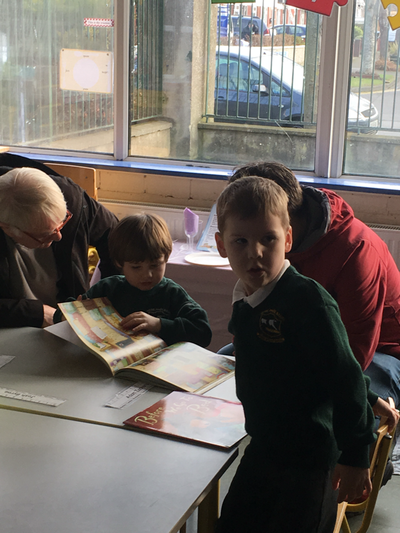 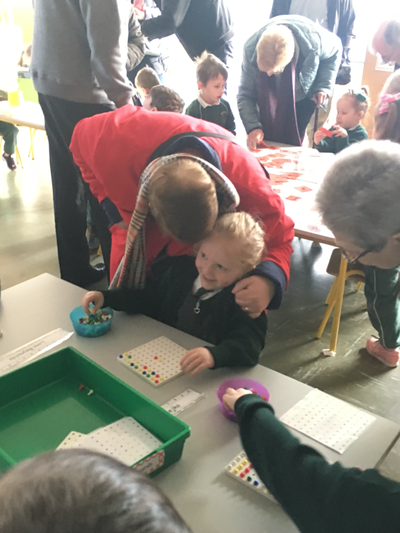 Our School celebrated the very special occasion of Grandparents Day as part of Catholic Schools Week. 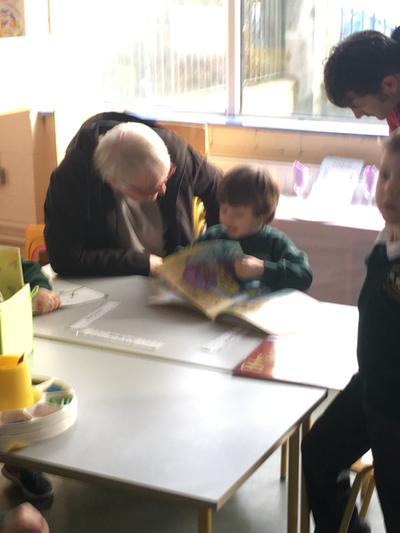 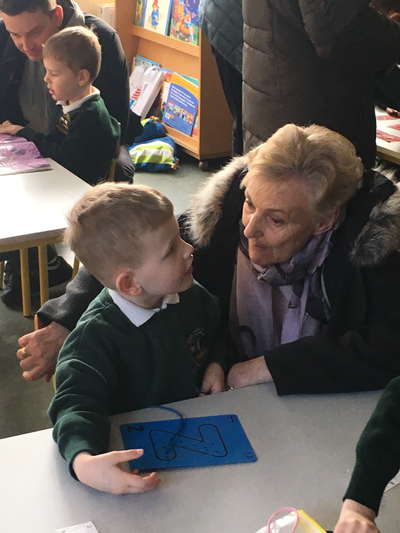 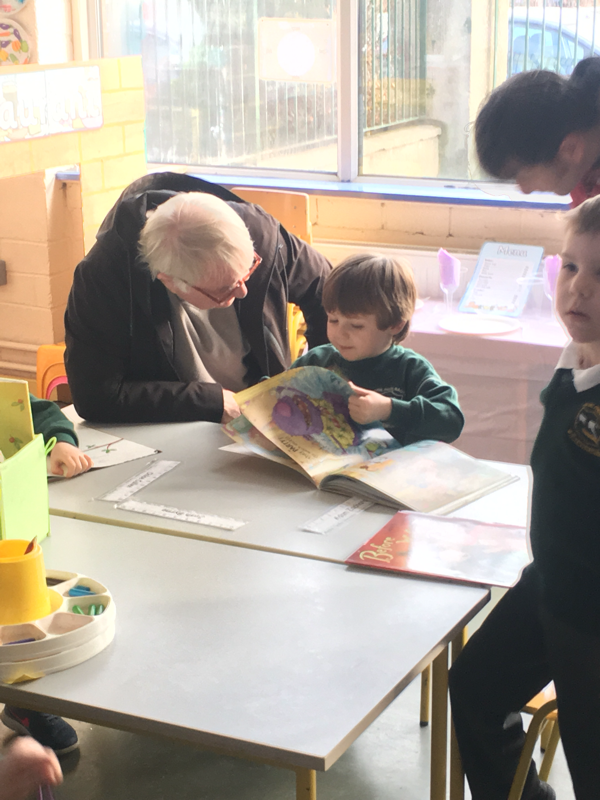 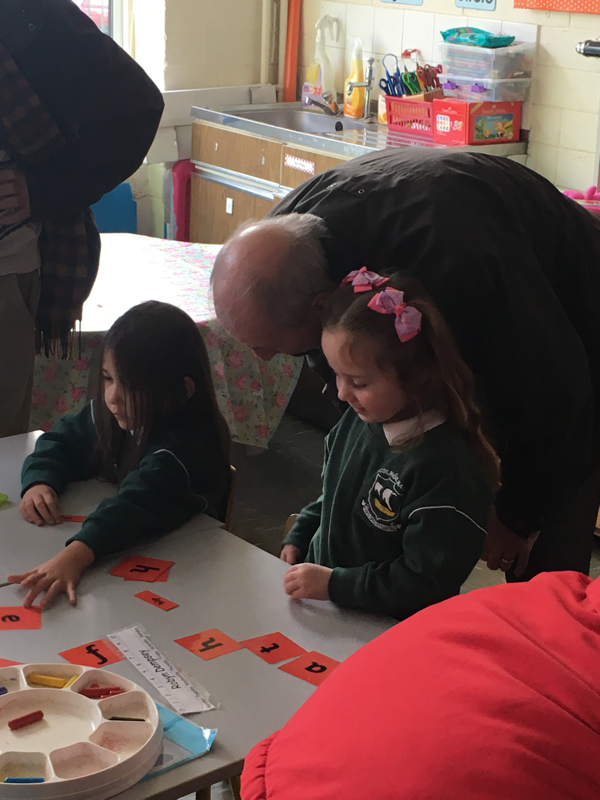 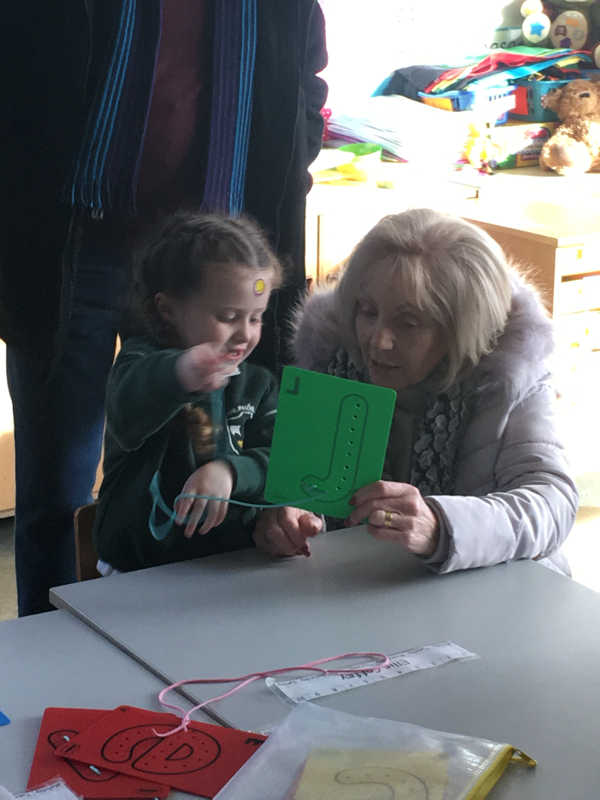 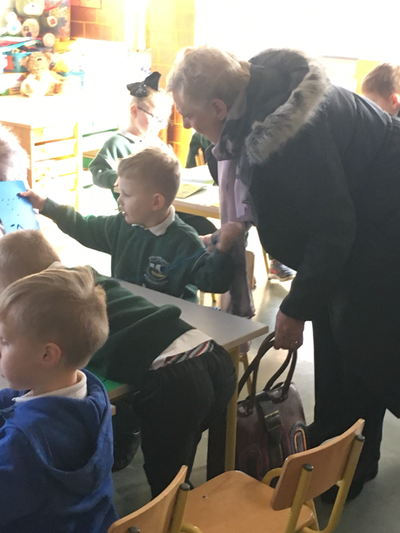 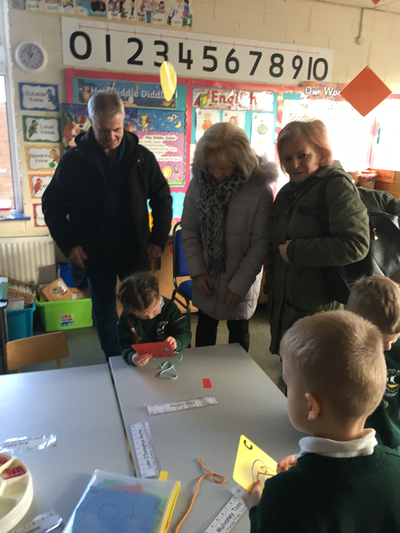 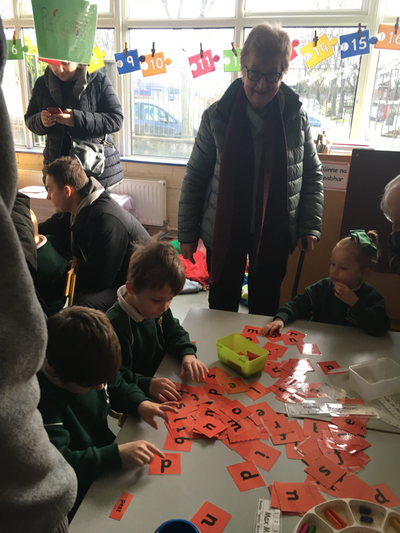 Grandparents play an important role in the lives of our children in school and this is a special way for us to thank them for everything they do. This week we listened to the story of Goldilocks and the Three Bears! We love singing our song about her. 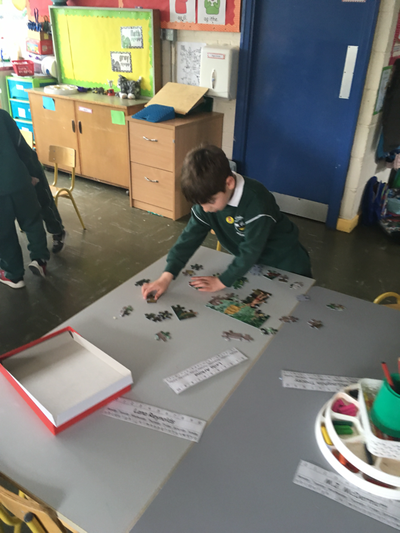 We practiced sequencing and retelling the story. 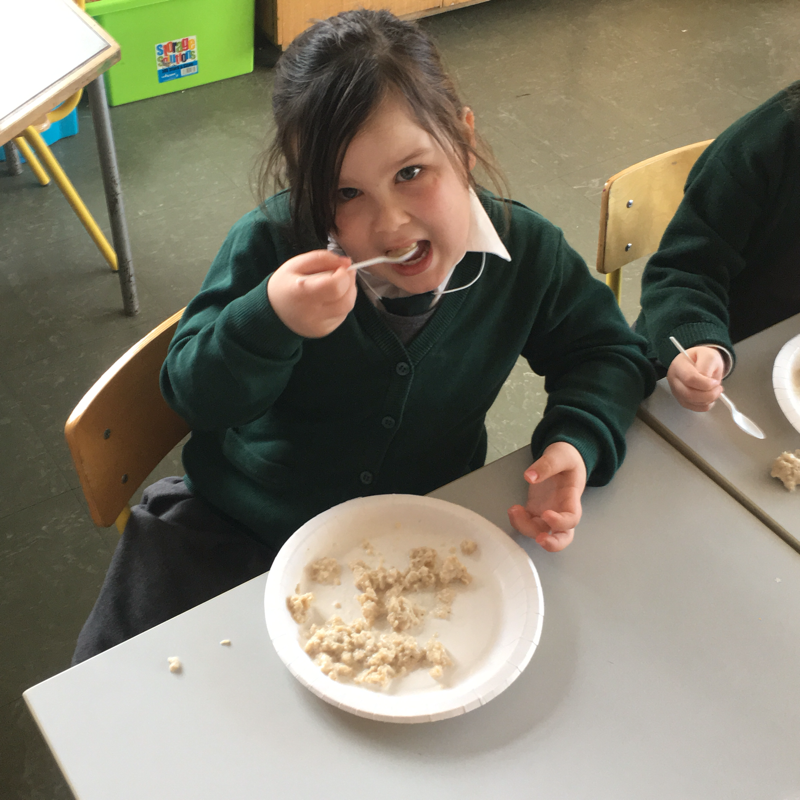 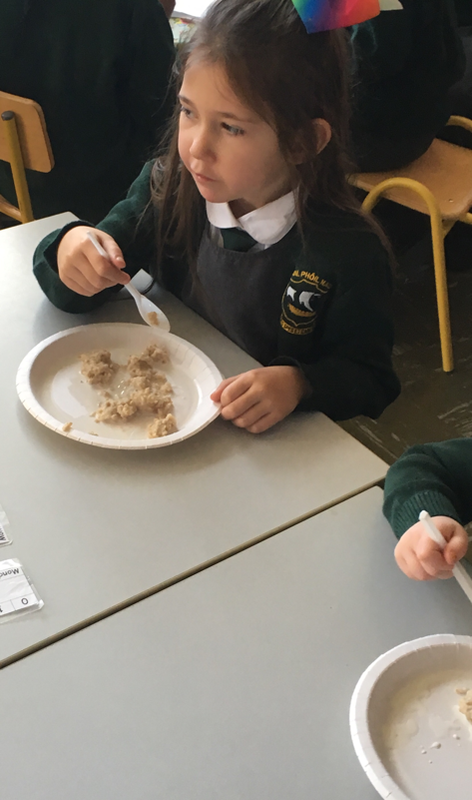 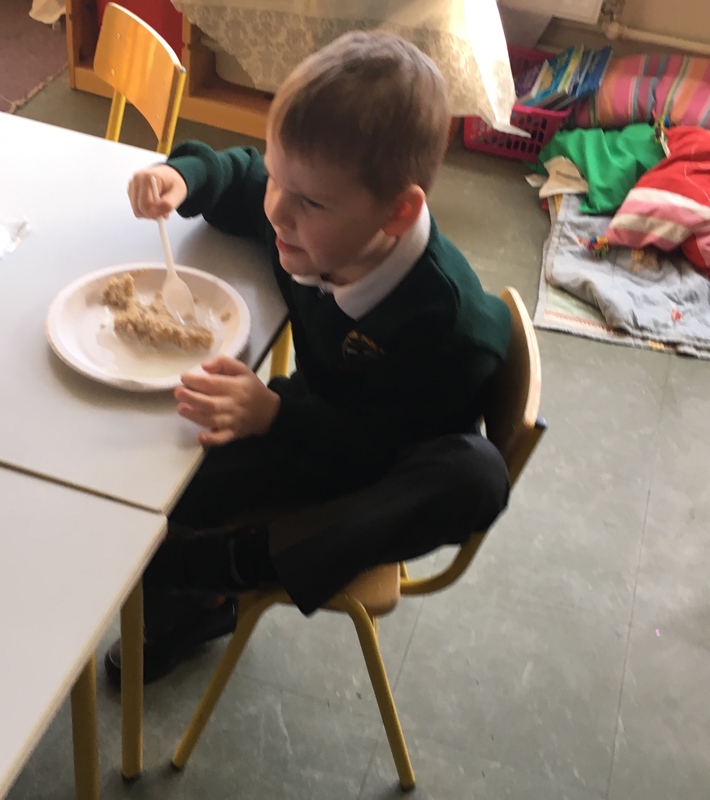 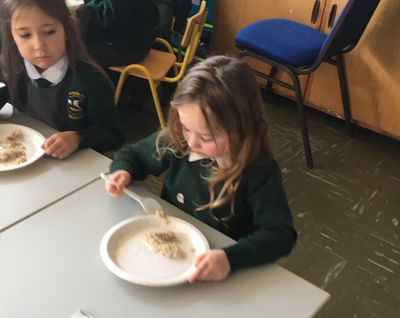 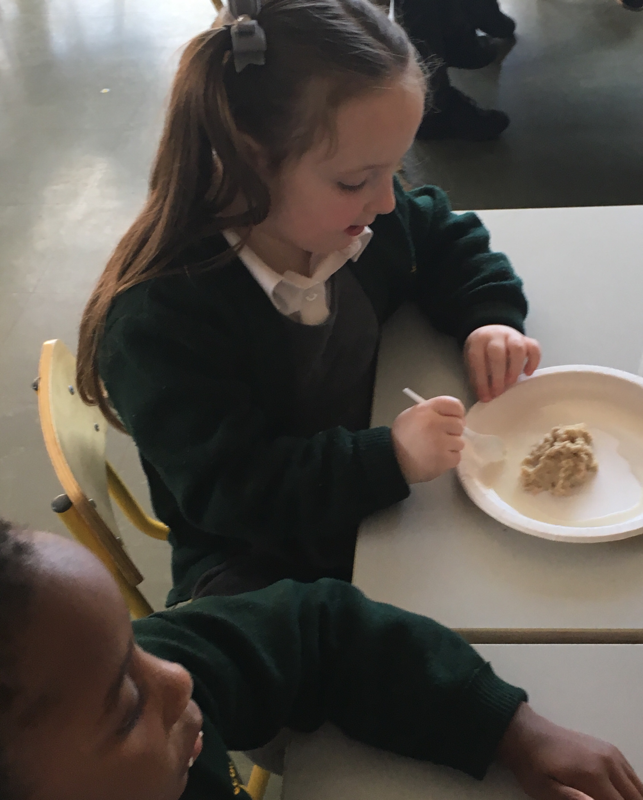 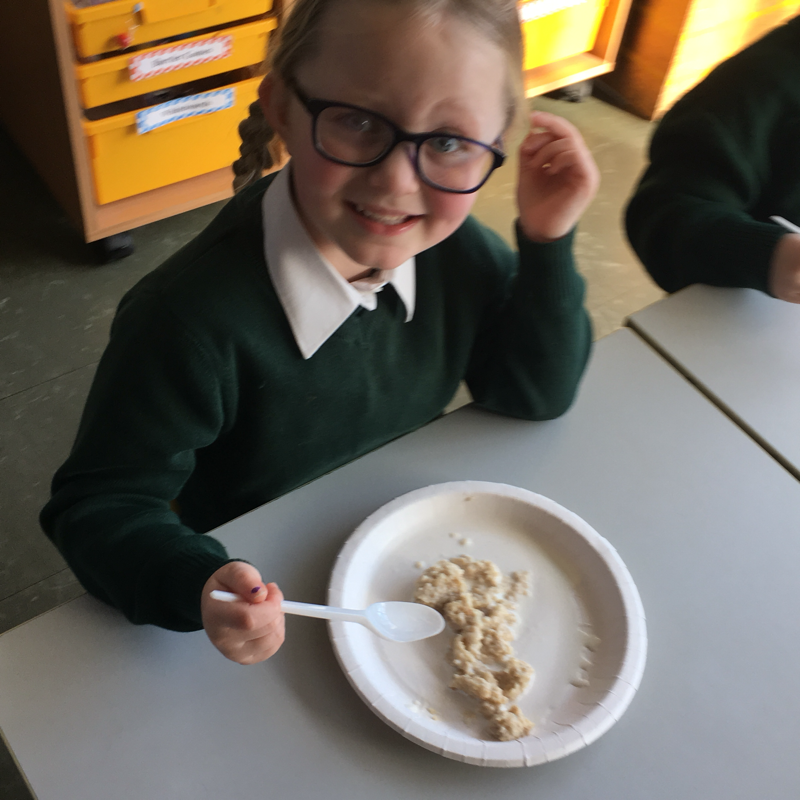 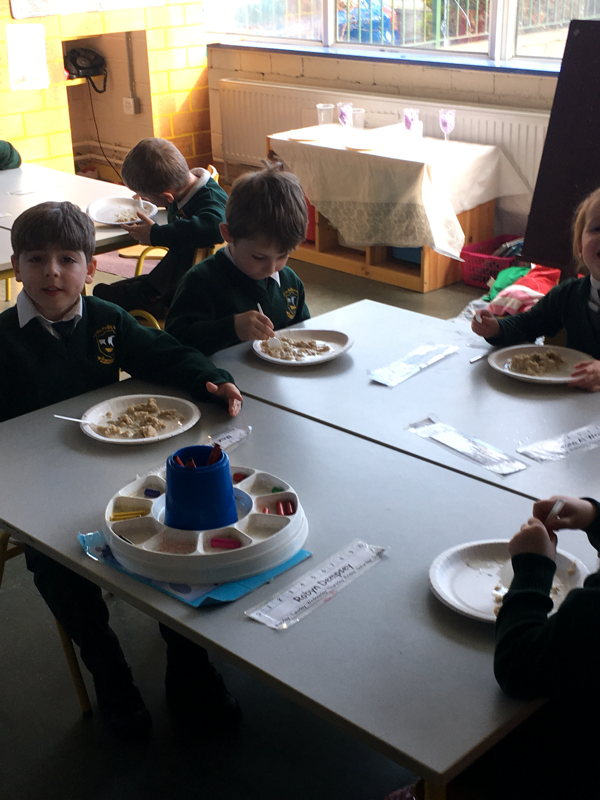 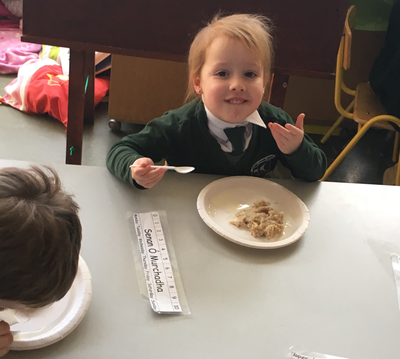 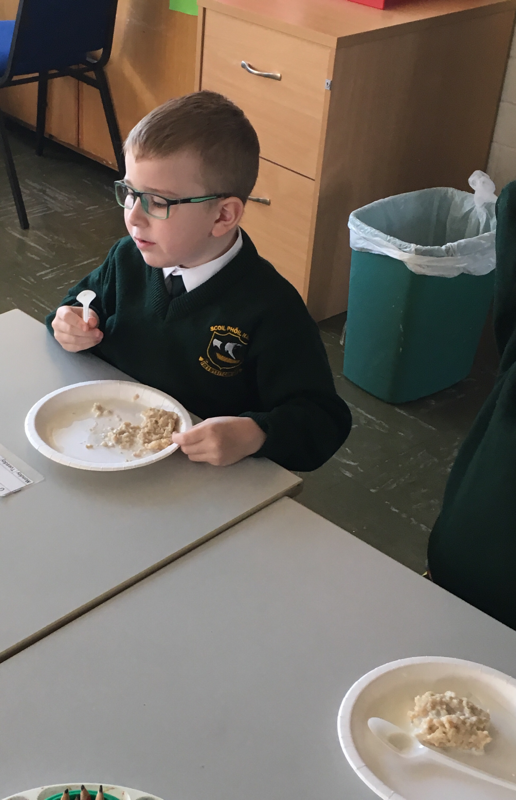 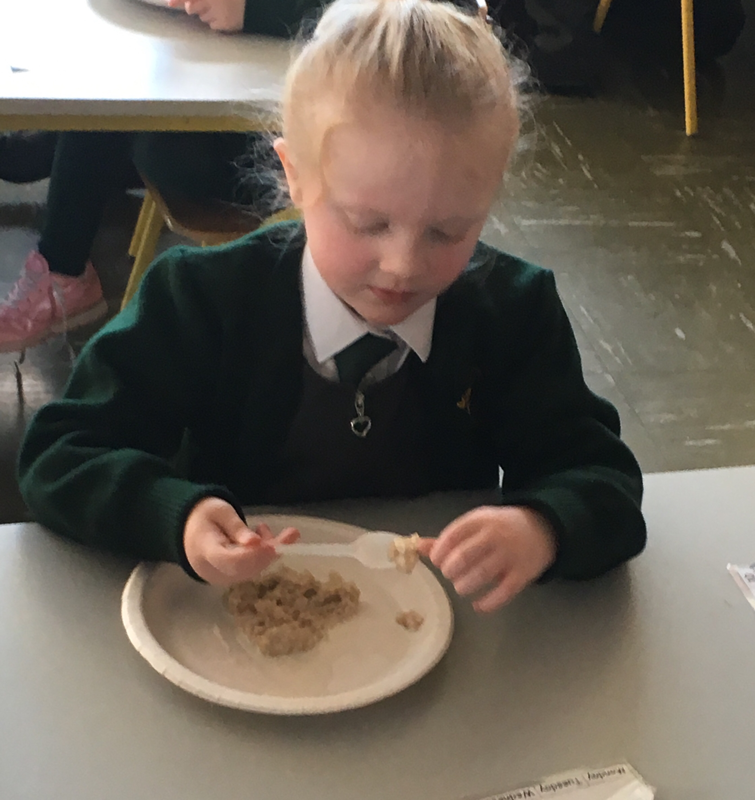 Today, we were like Goldilocks and made some porridge!! 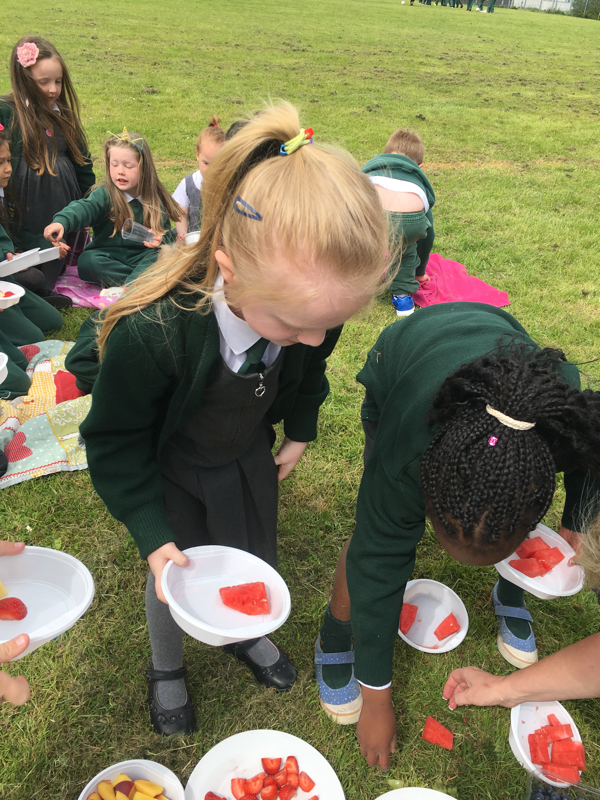 We waited until it was “just right” to taste!! 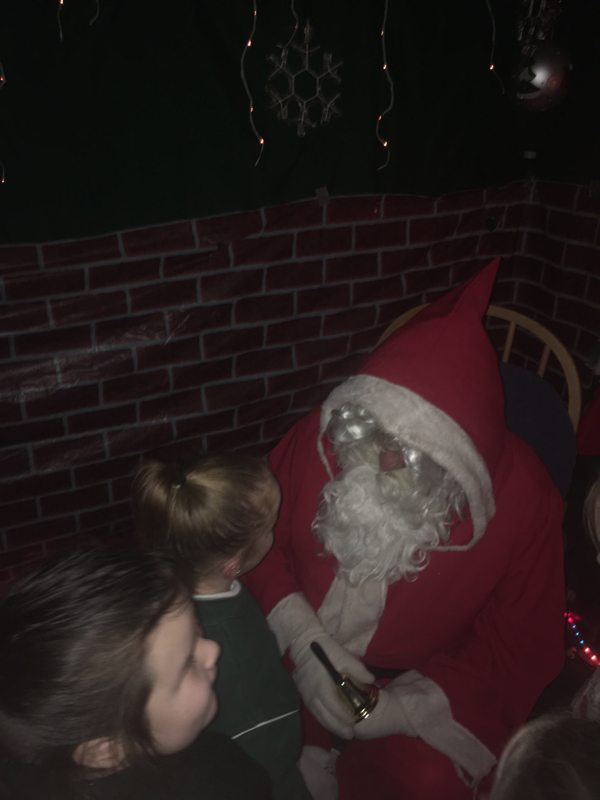 ​Sone of us loved it whilst others weren’t quite so sure!!!! 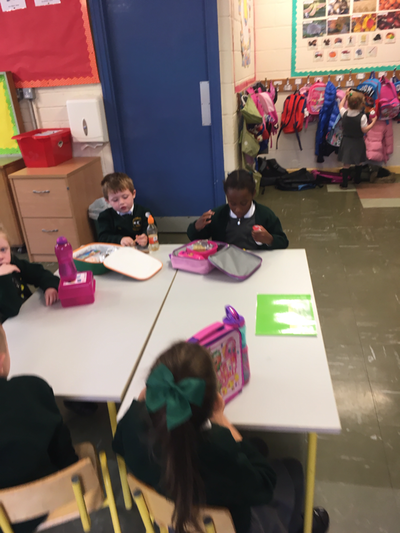 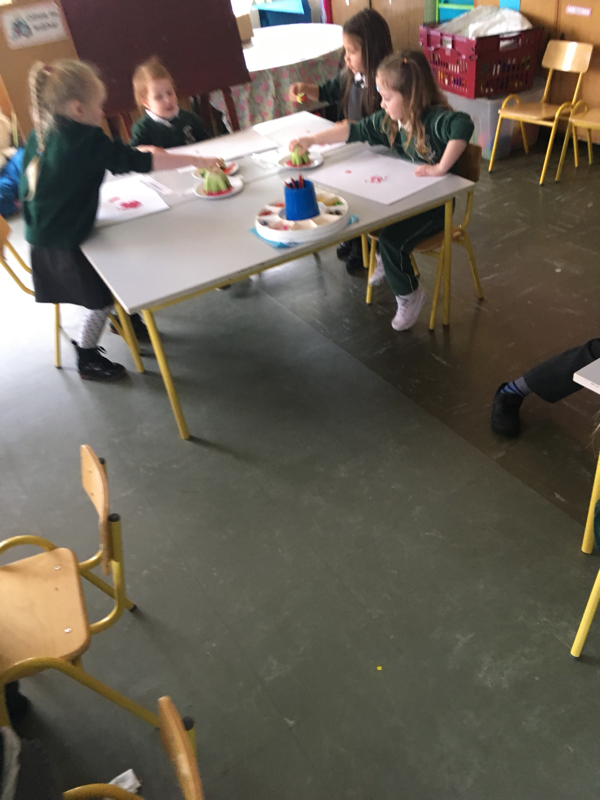 Our current topic in Aistear is the restaurant. We discussed, what we see in a restaurant, who works in a restaurant and what each of them do. 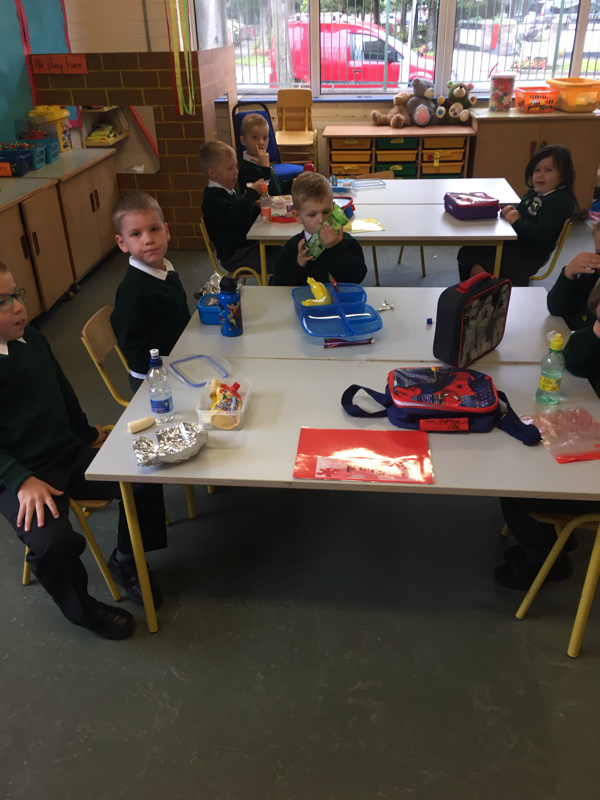 We learned and are practicing using lots of language for a restaurant; table settings, good manners, how to order food, etc. 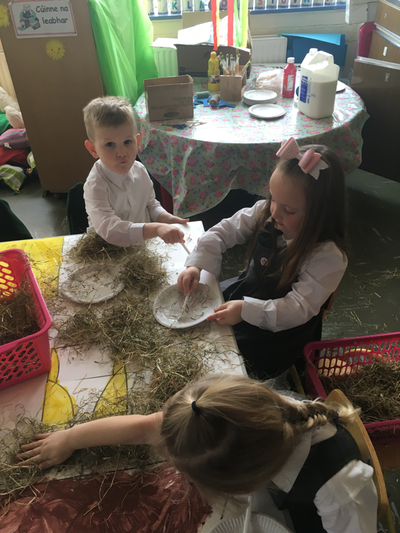 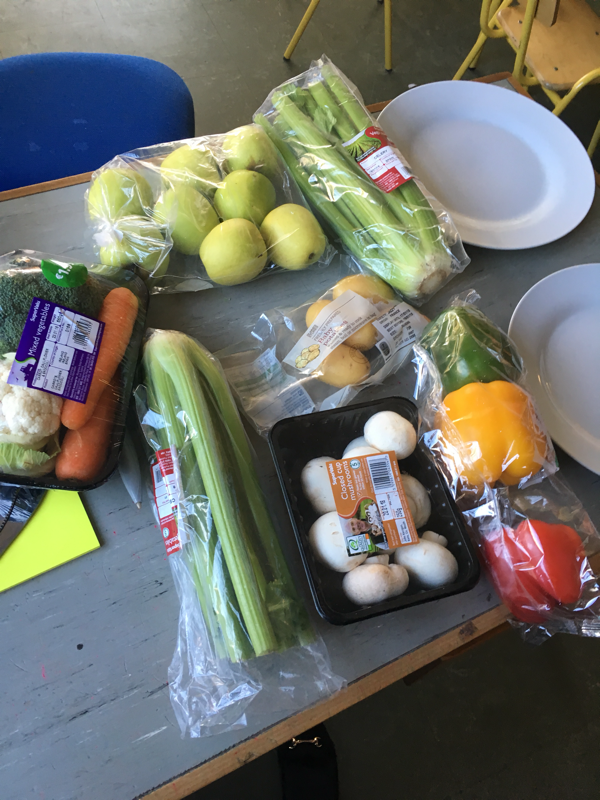 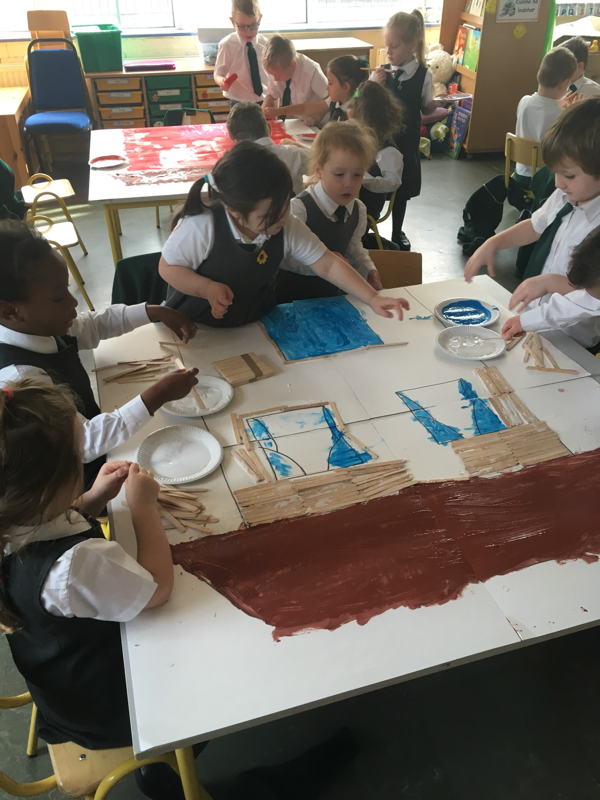 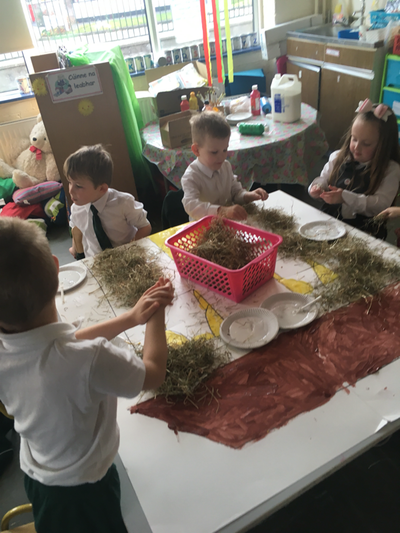 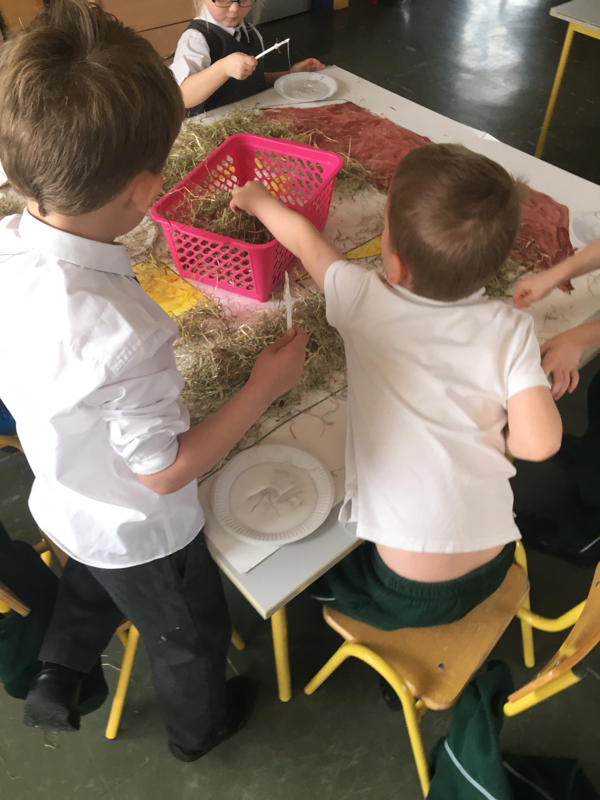 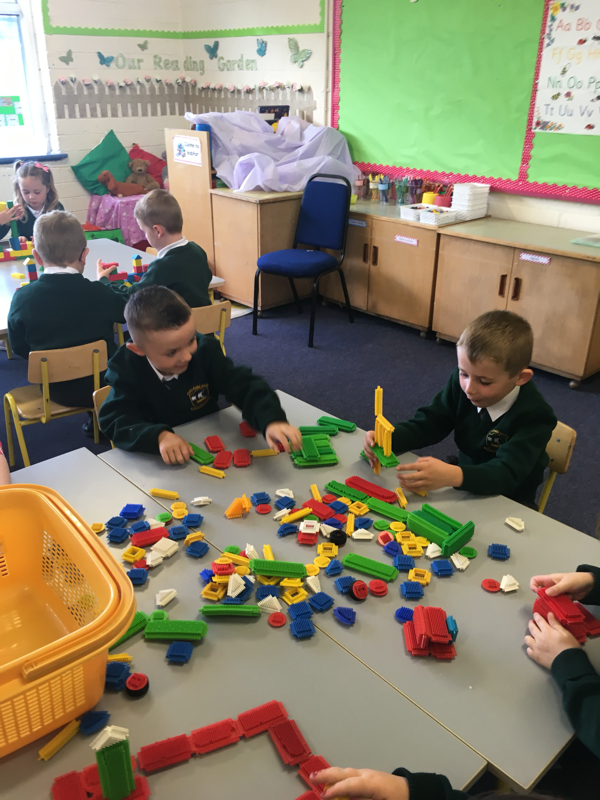 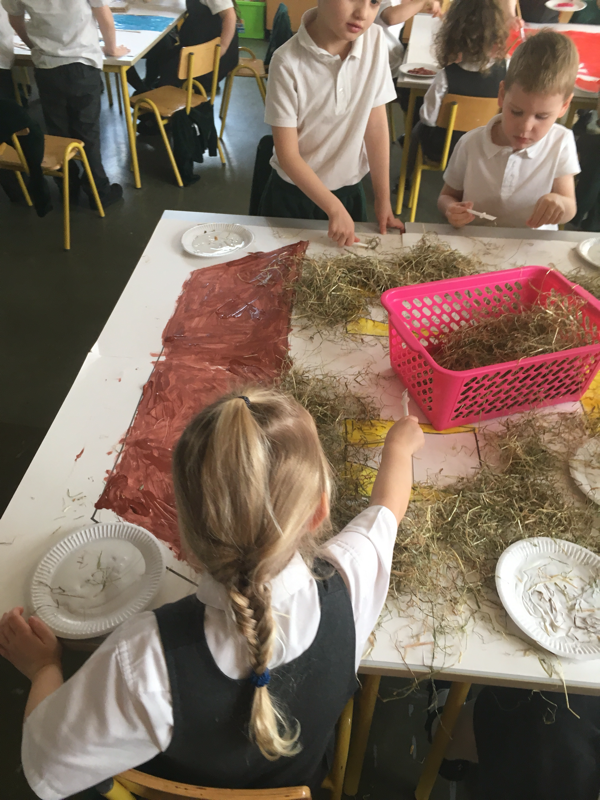 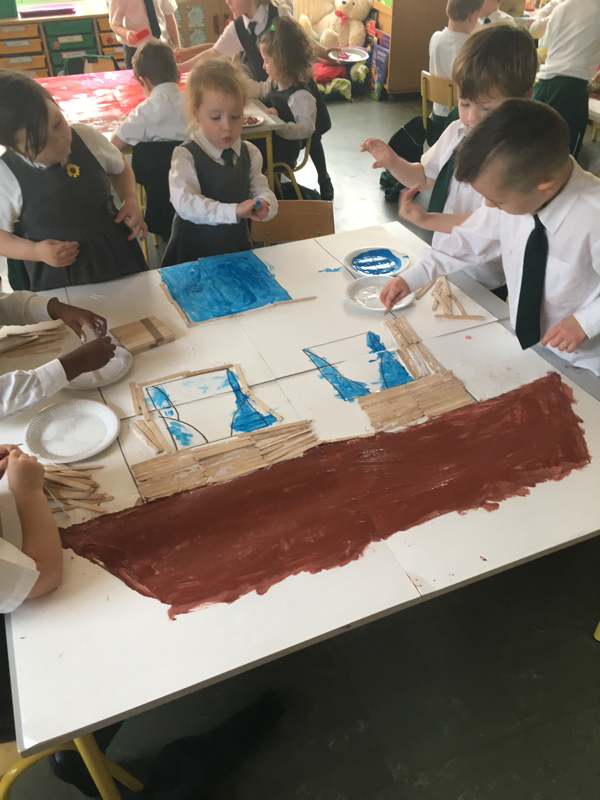 We are using the junk art box to make a creative plate of food, a co-operative game based on food, the big blocks for building our very own restaurant and we also have a turn playing and using all we have learned in our restaurant in the classroom! 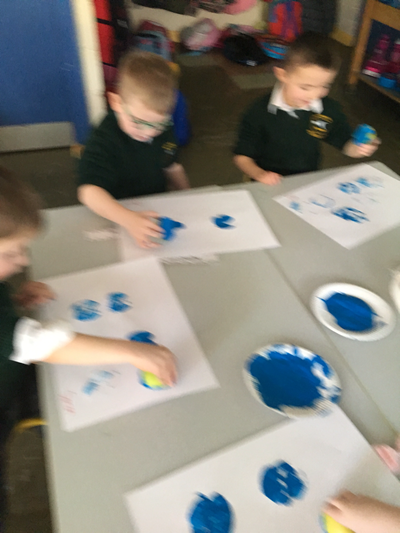 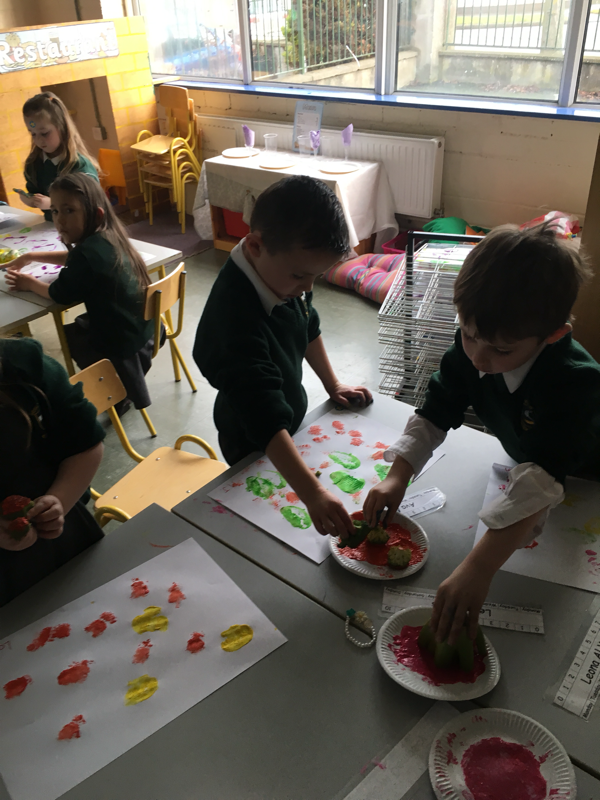 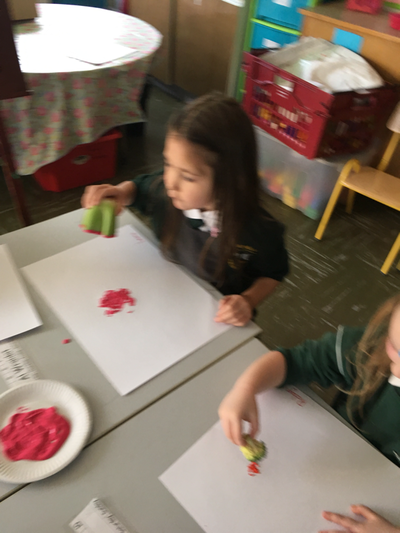 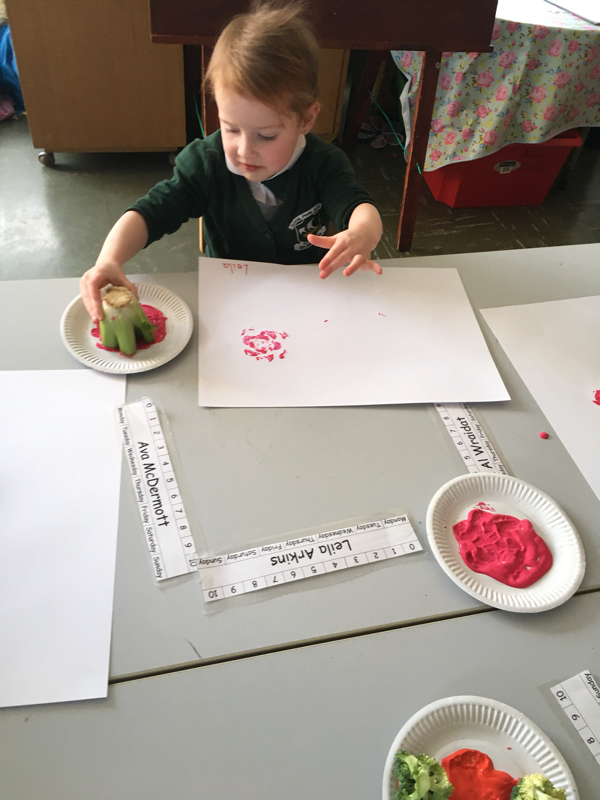 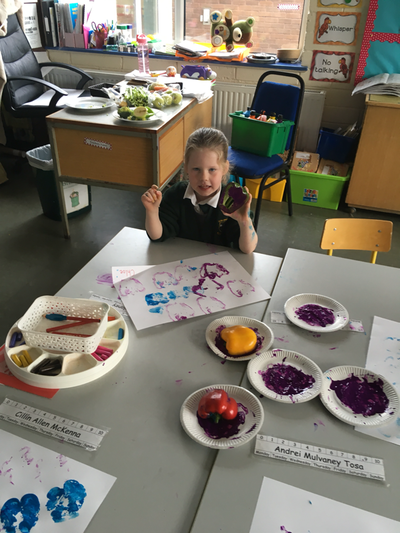 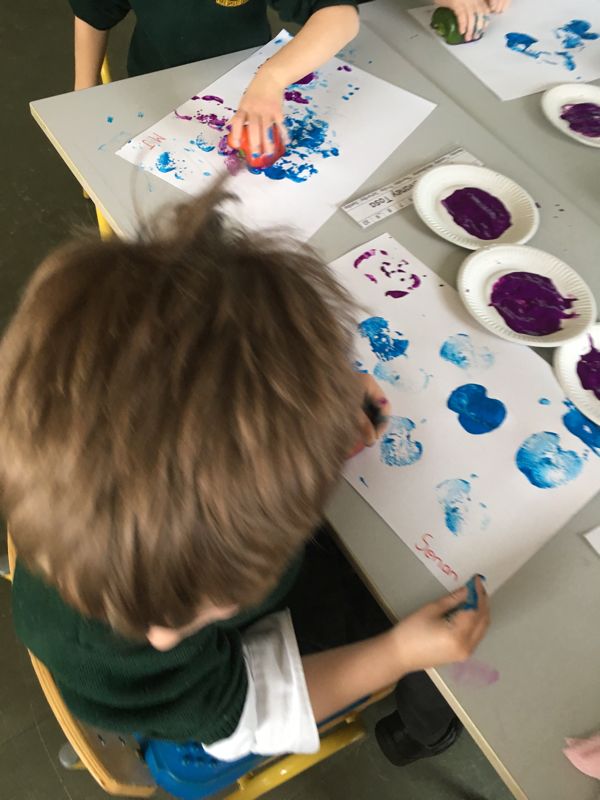 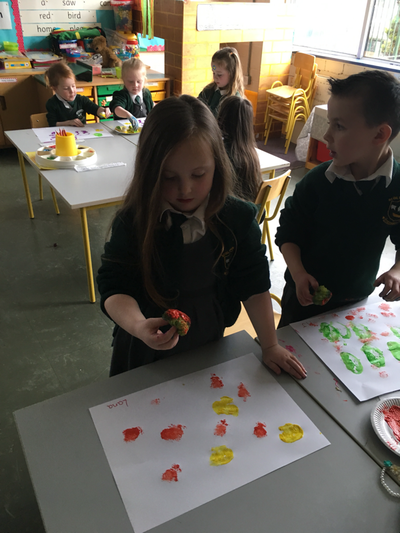 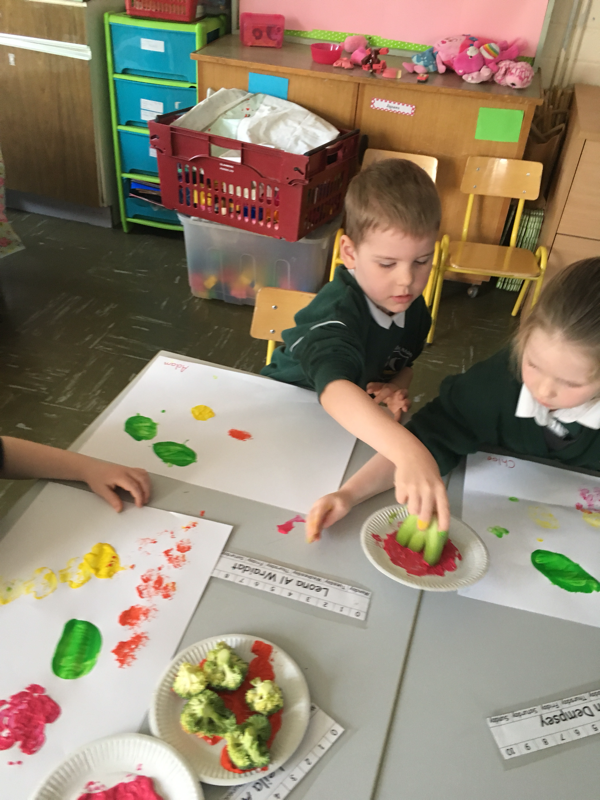 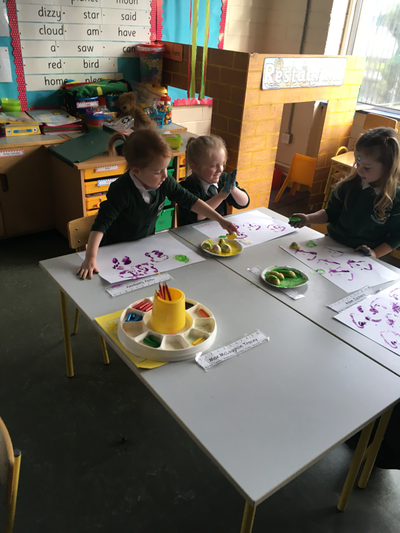 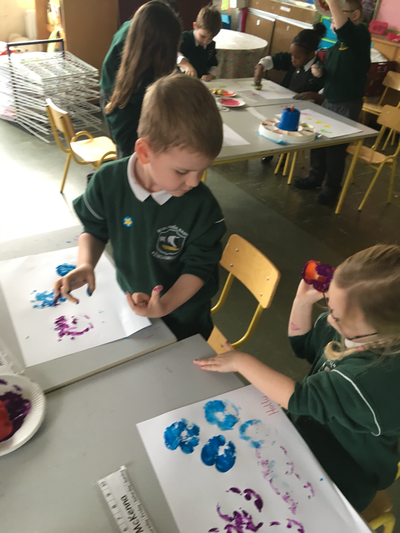 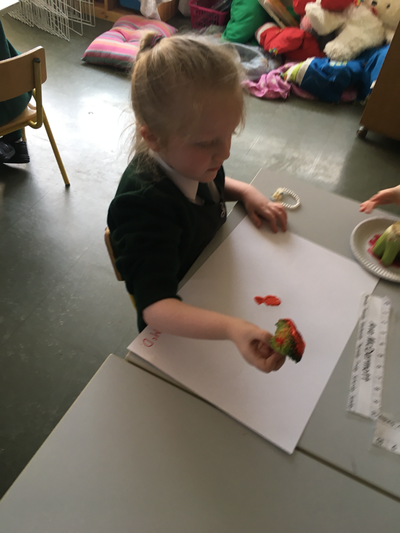 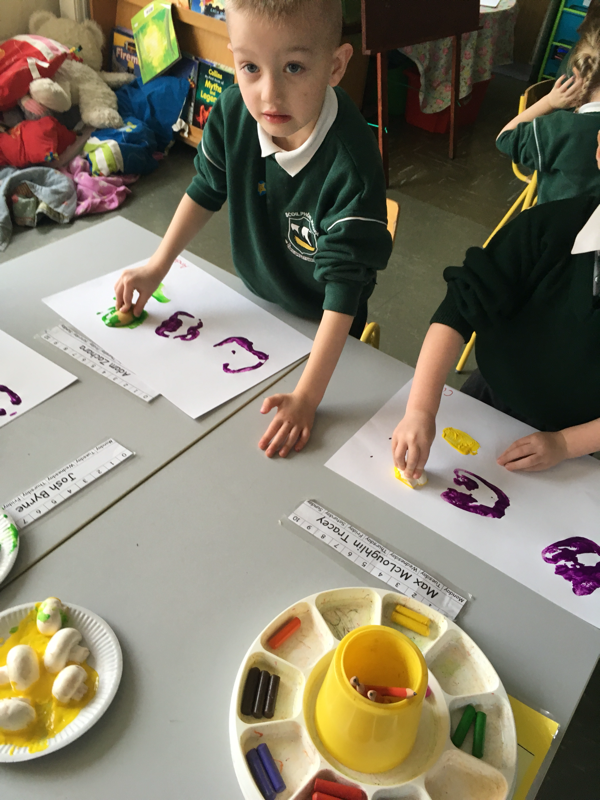 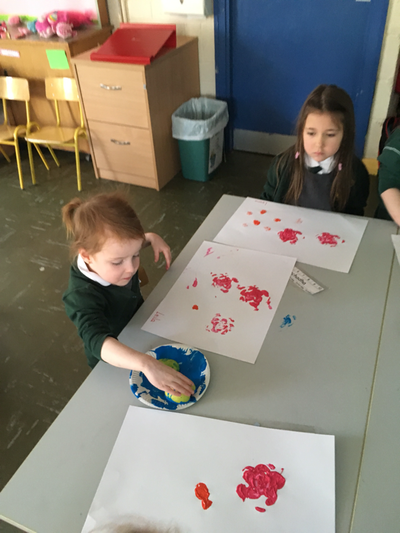 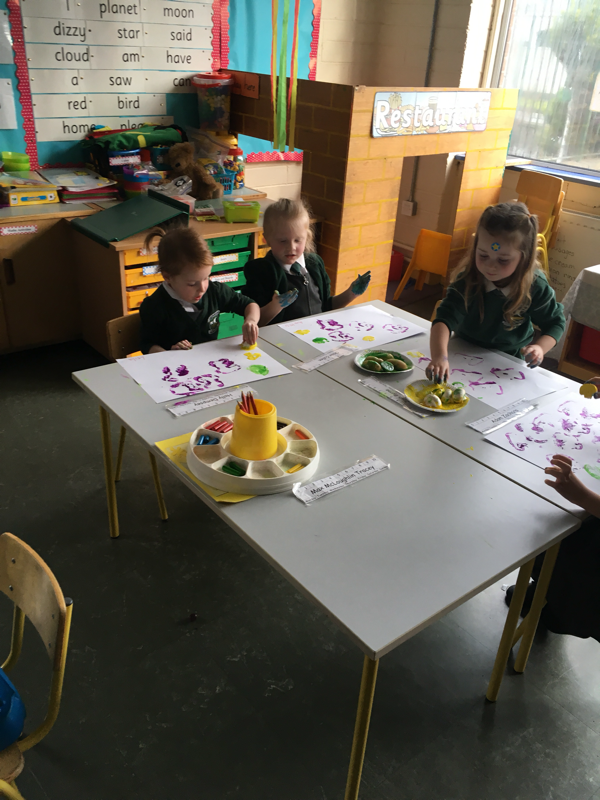 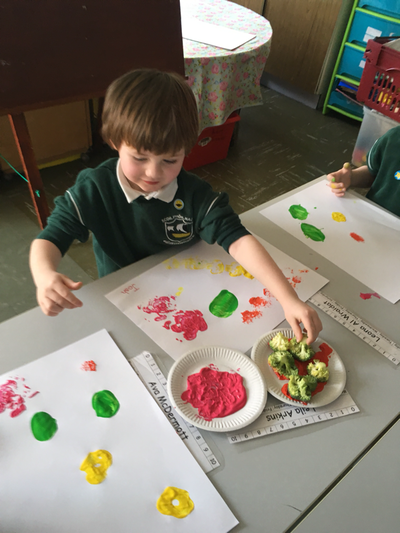 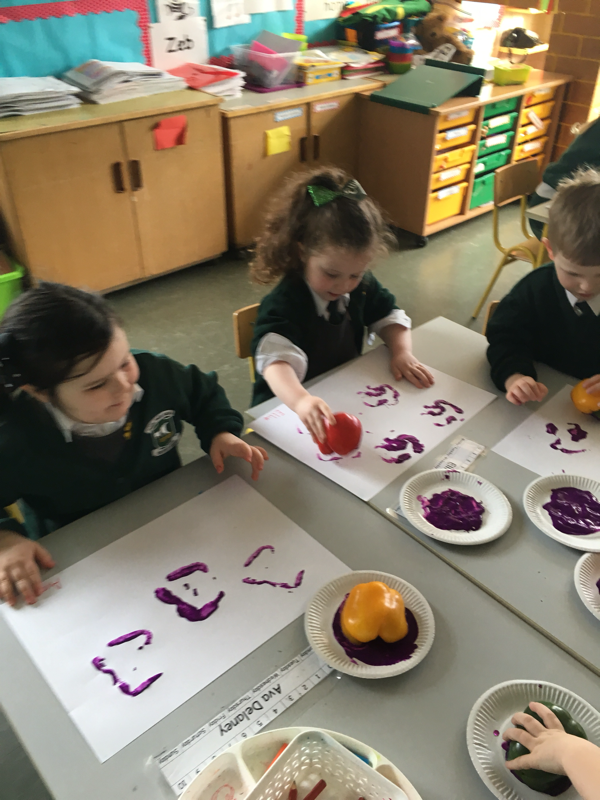 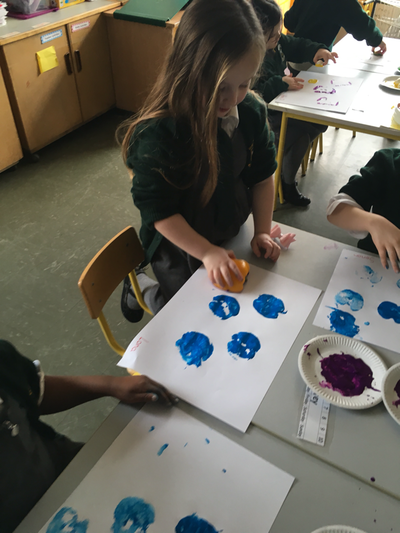 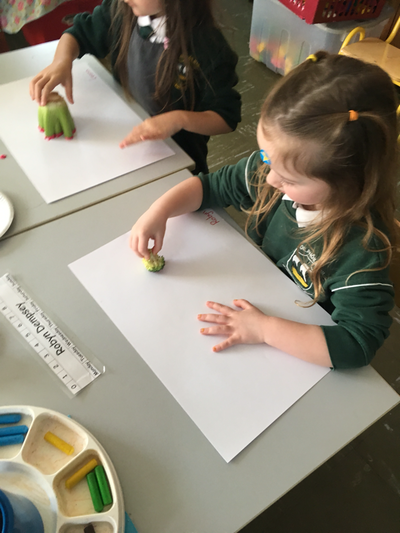 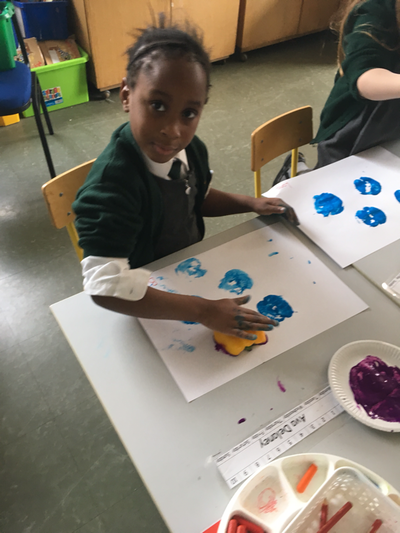 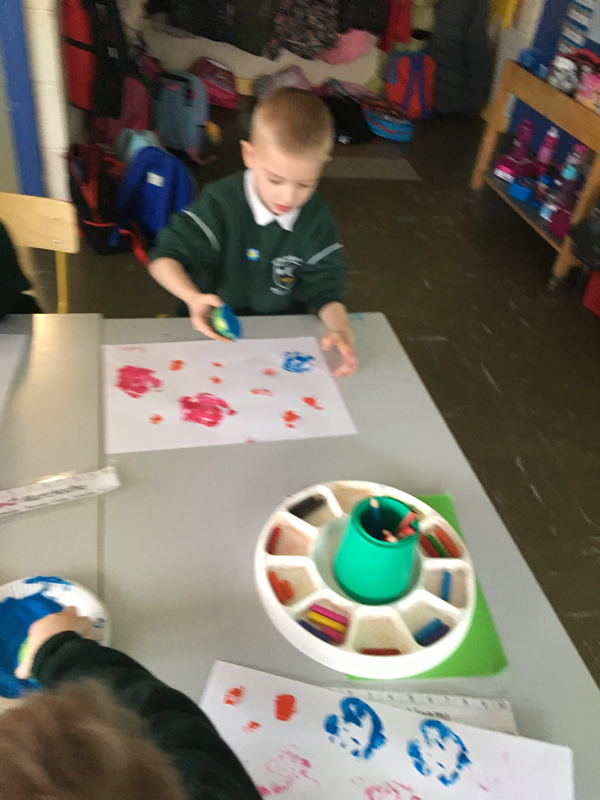 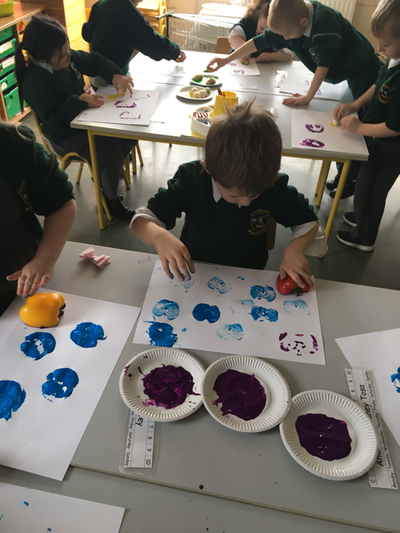 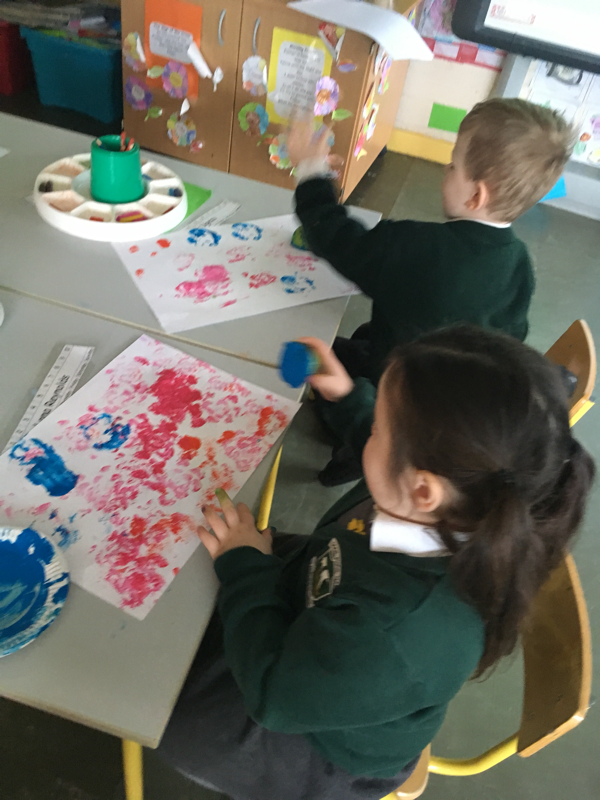 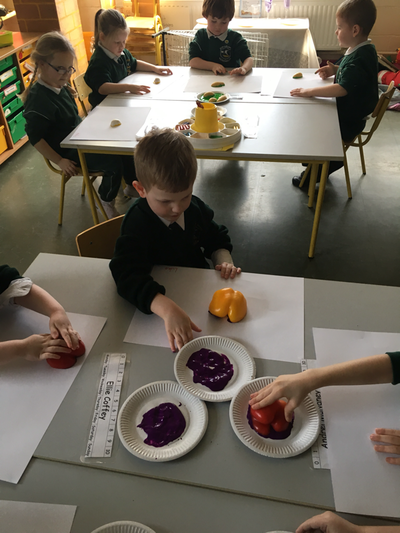 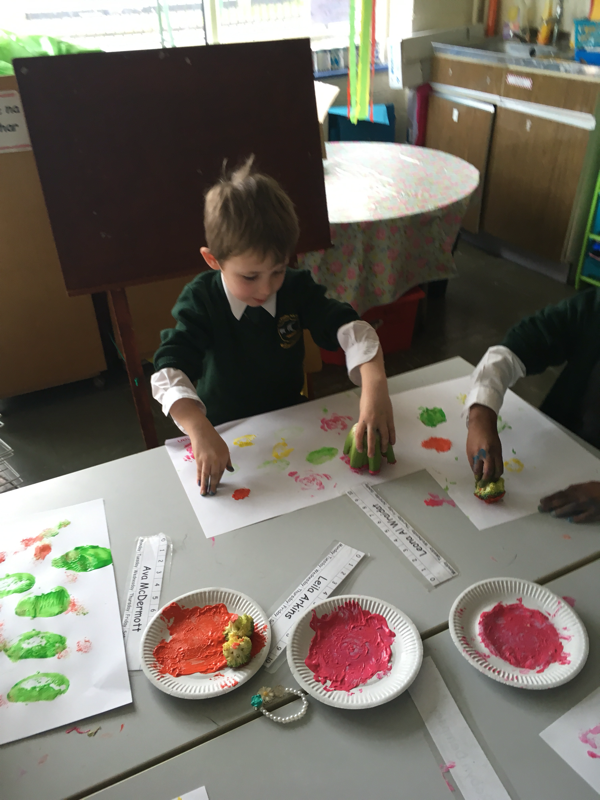 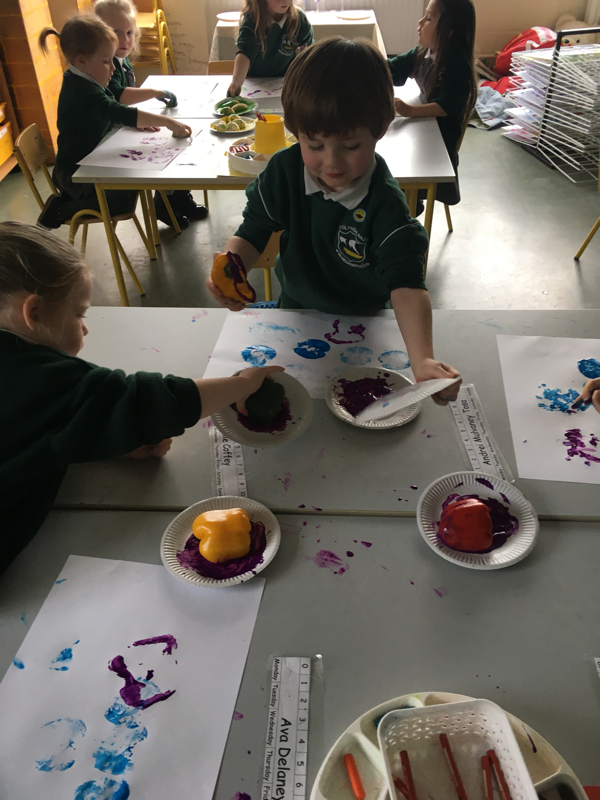 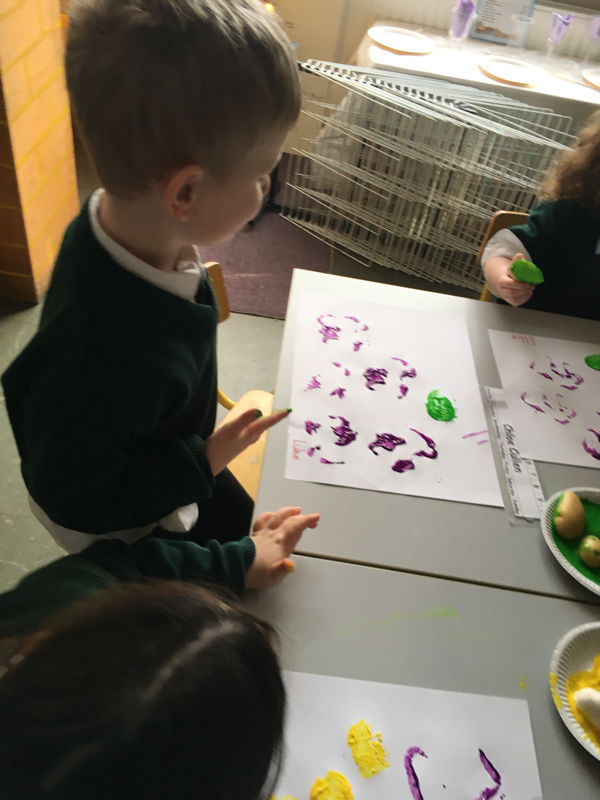 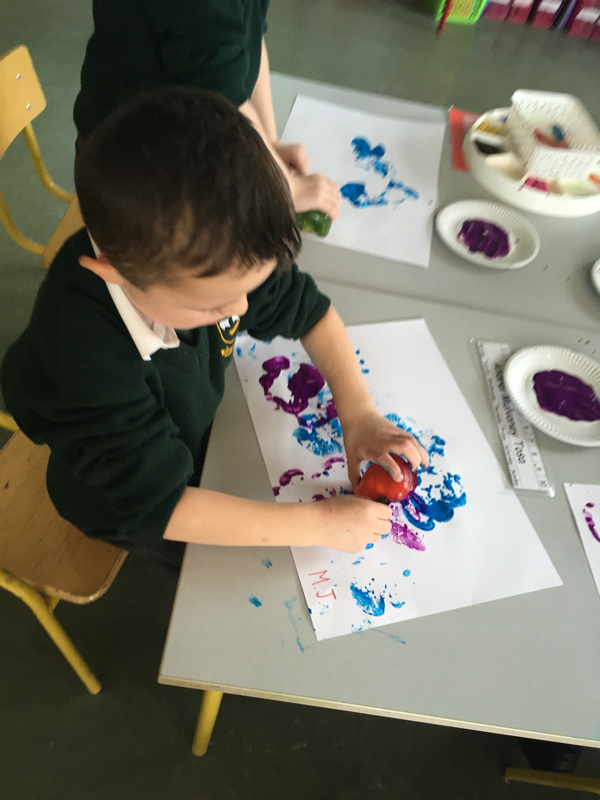 We had lots of fun today making prints with fruit and vegetables. We used apples, potatoes, broccoli, mushrooms, peppers and celery to make prints. 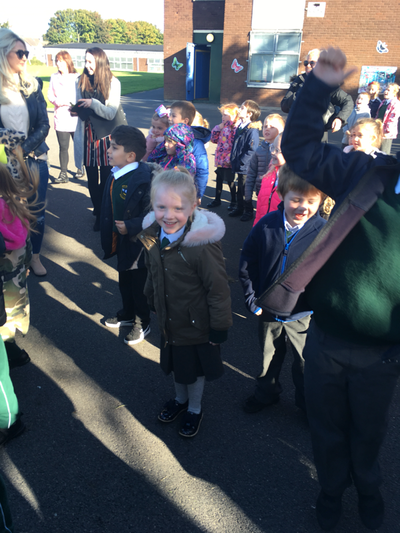 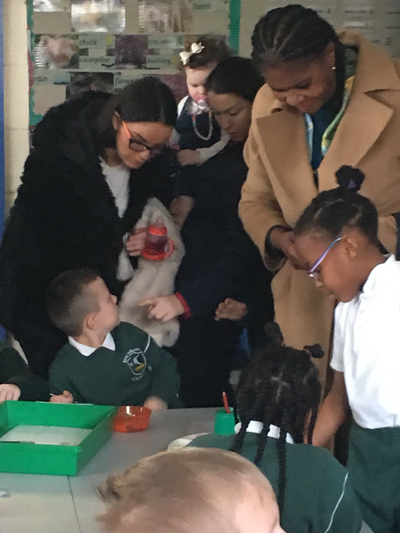 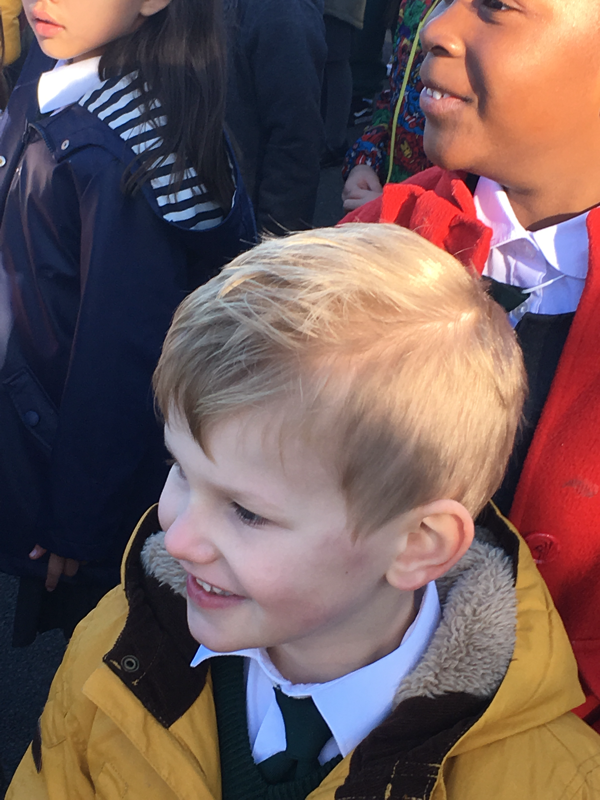 We had a wonderful day in school today. In the morning, we wrapped ourselves up in our coats and hats and went out to yard. 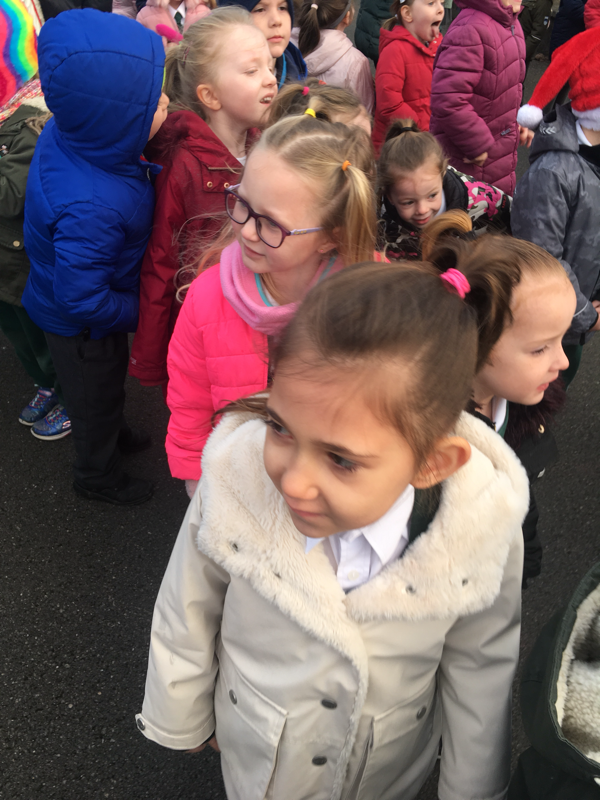 We waited patiently and were so surprised to see Santa arrive by fire engine. 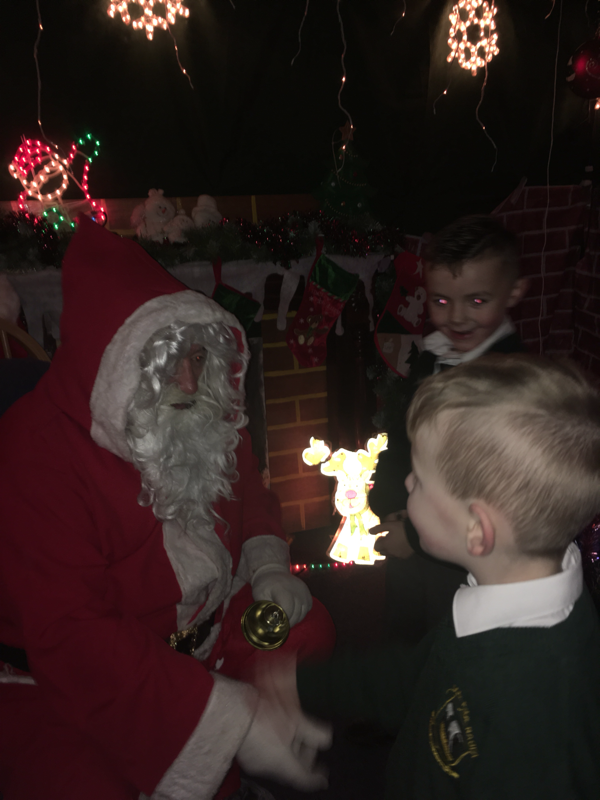 We then went inside and each of us met with Santa. 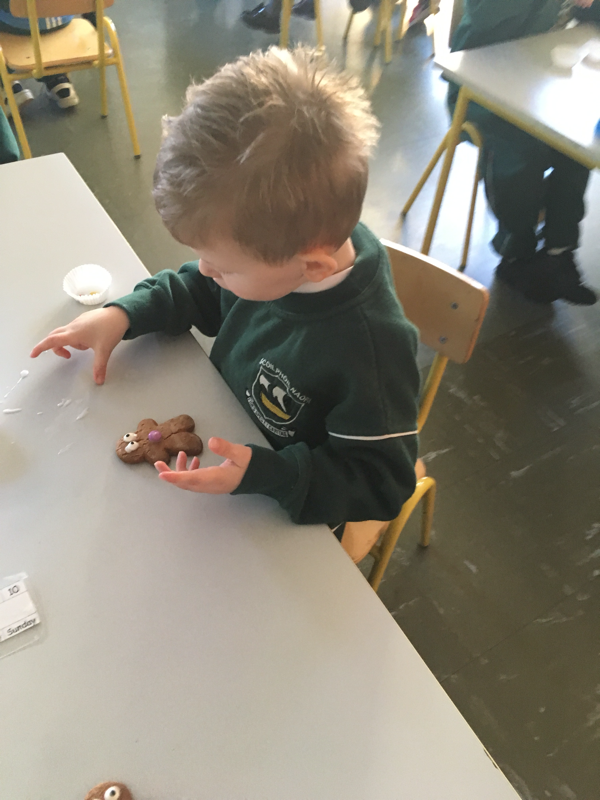 We received a selection box and reindeer food. 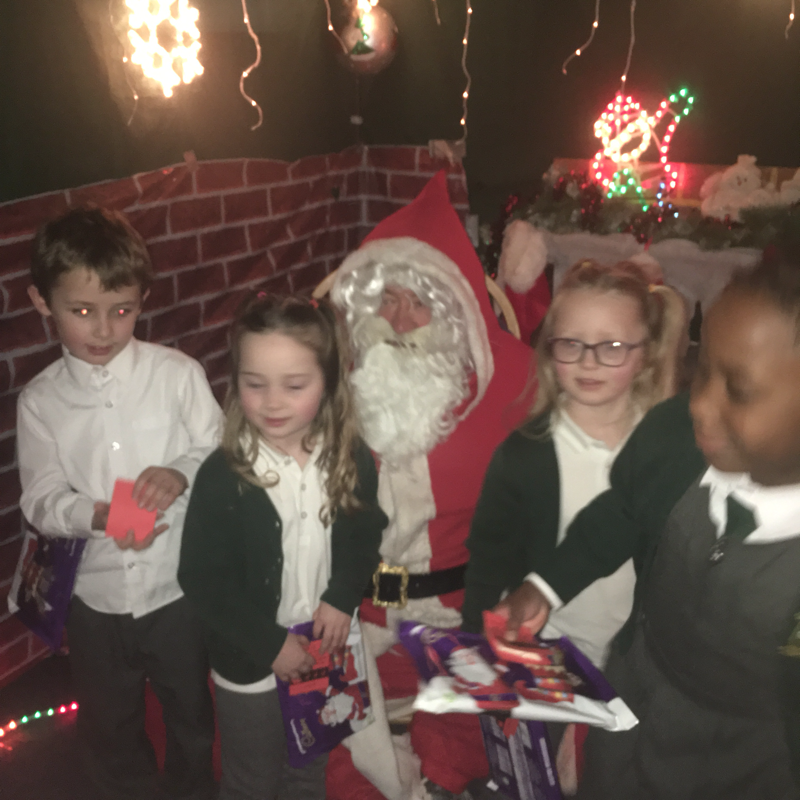 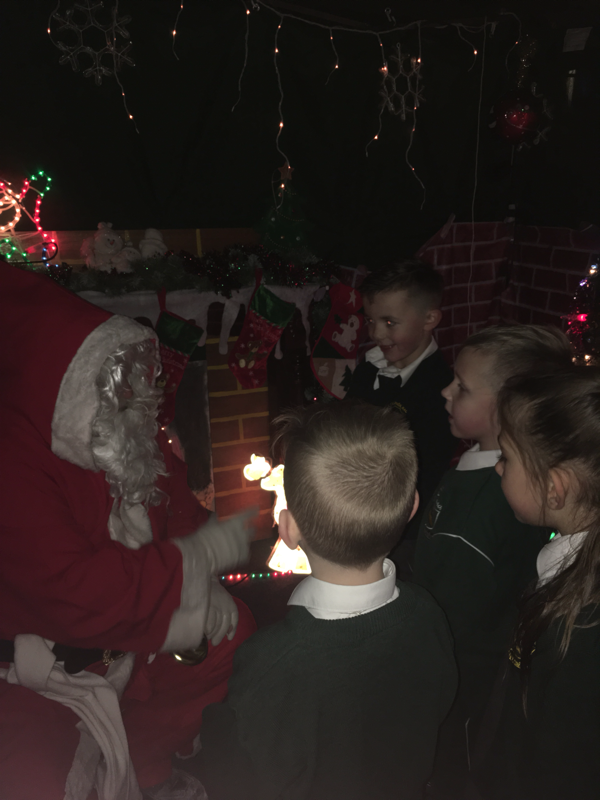 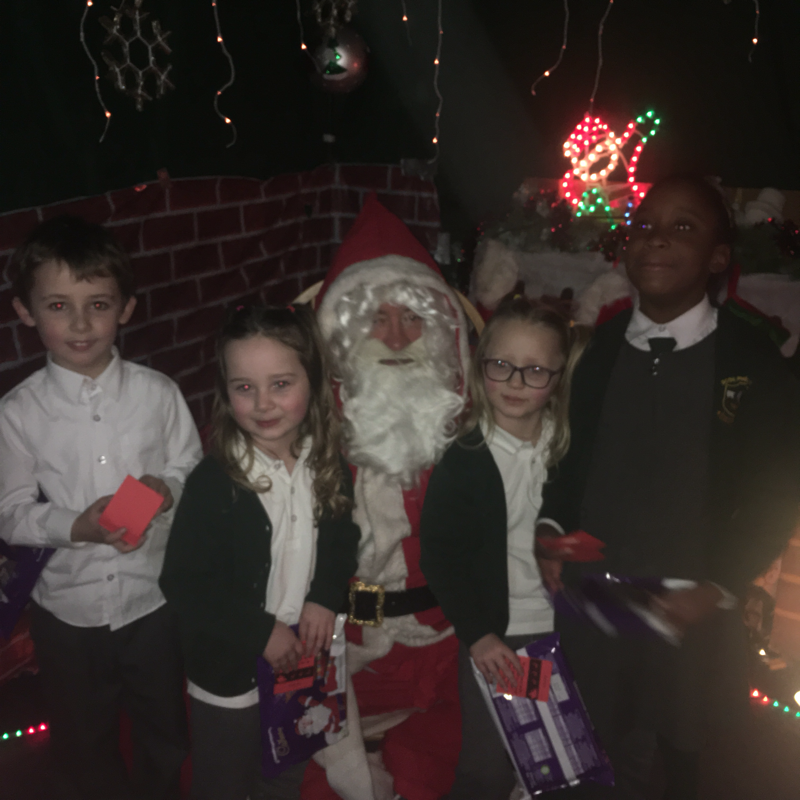 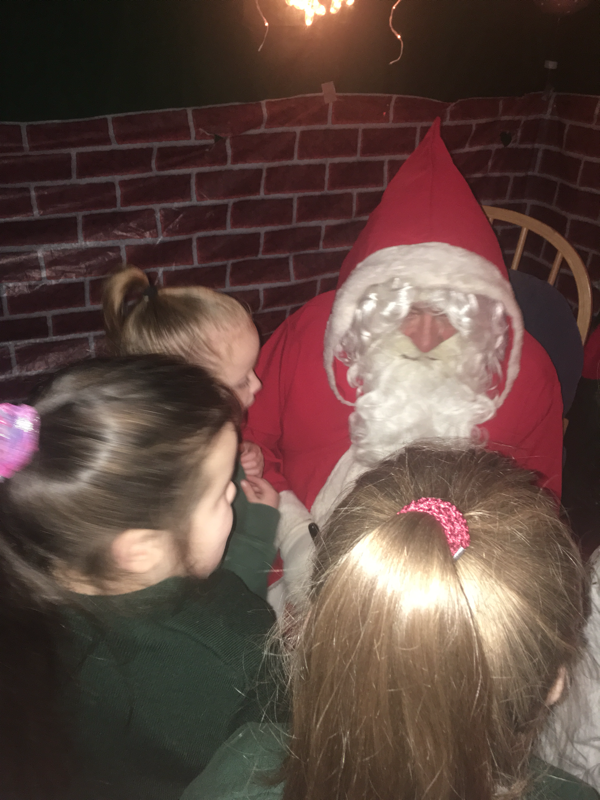 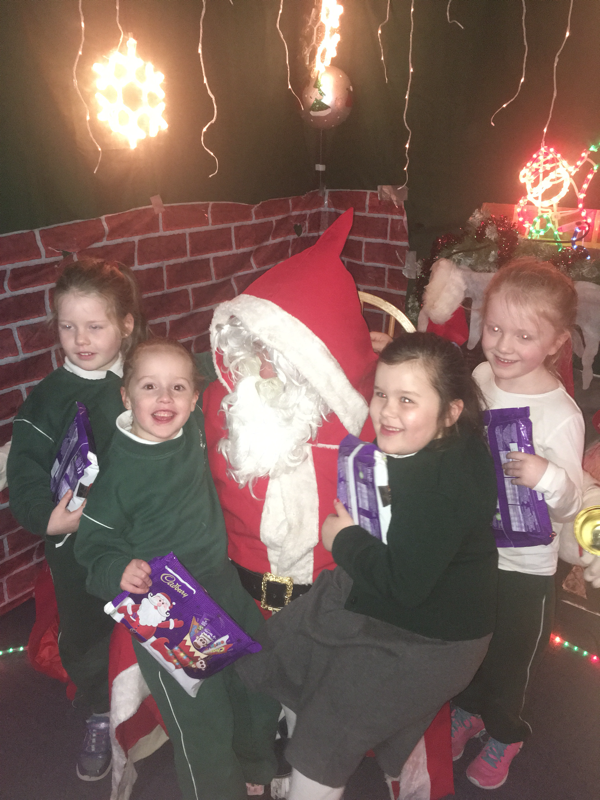 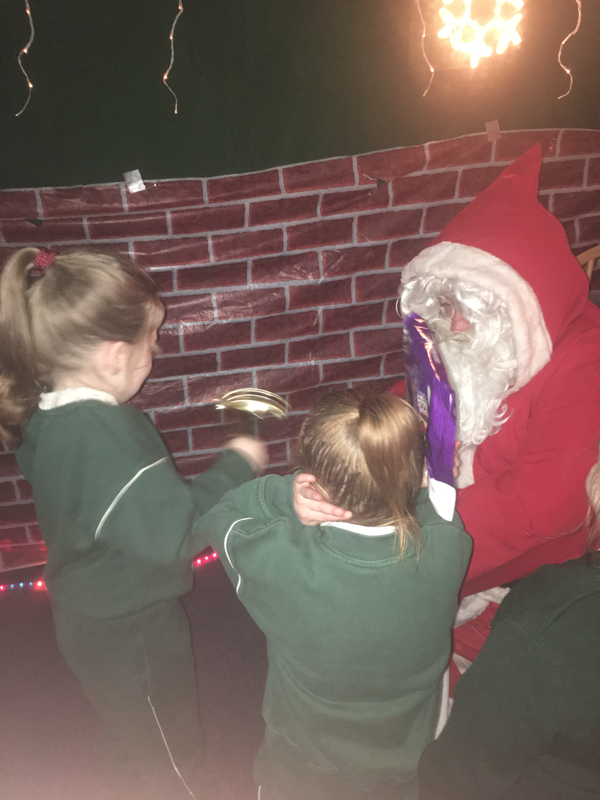 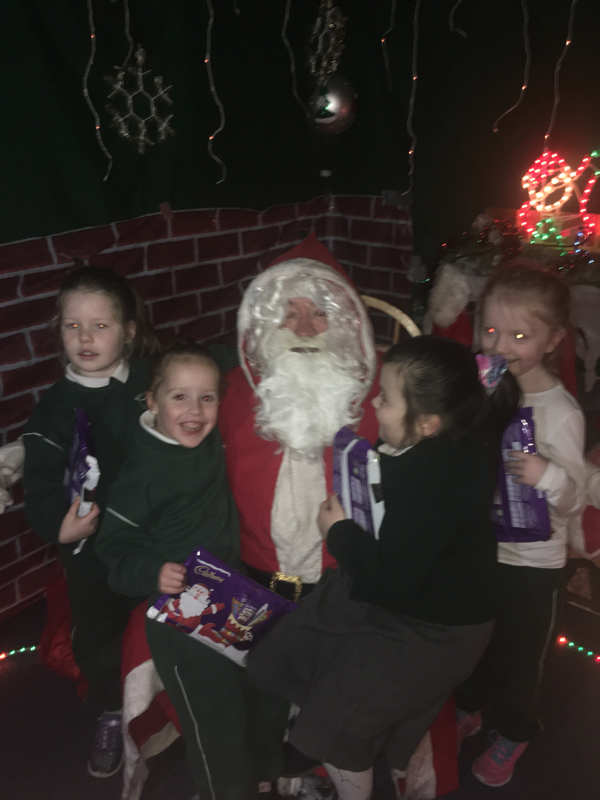 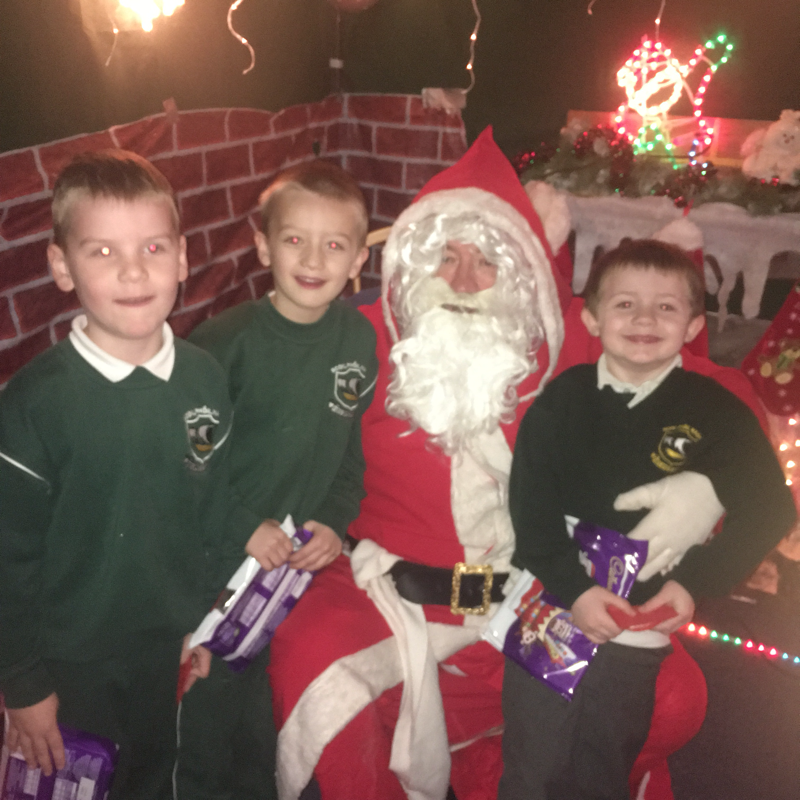 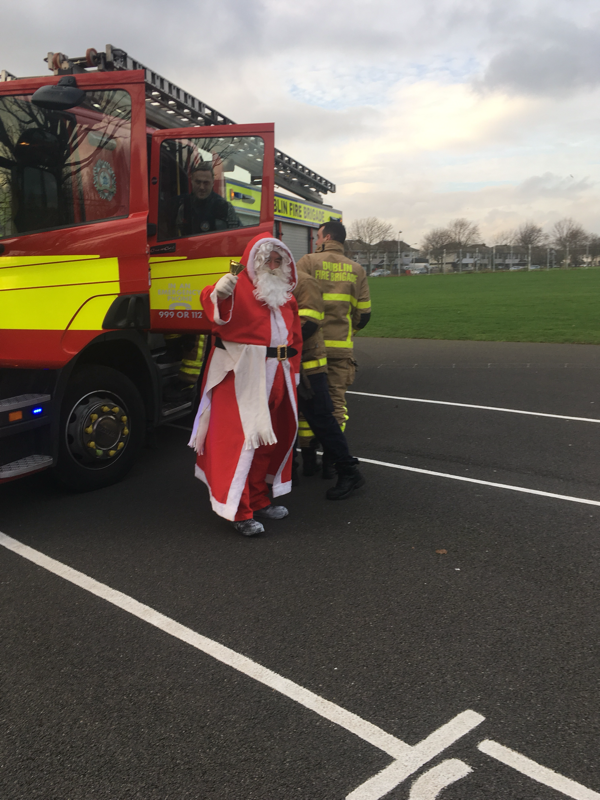 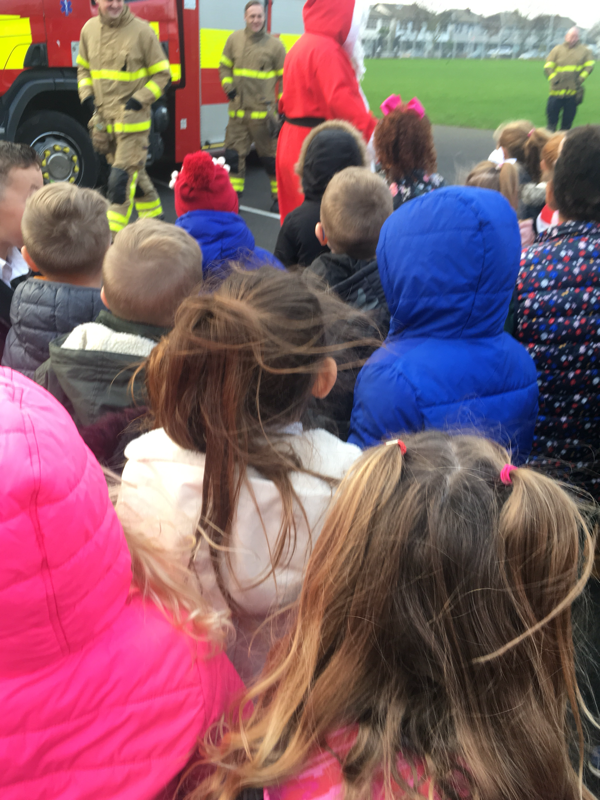 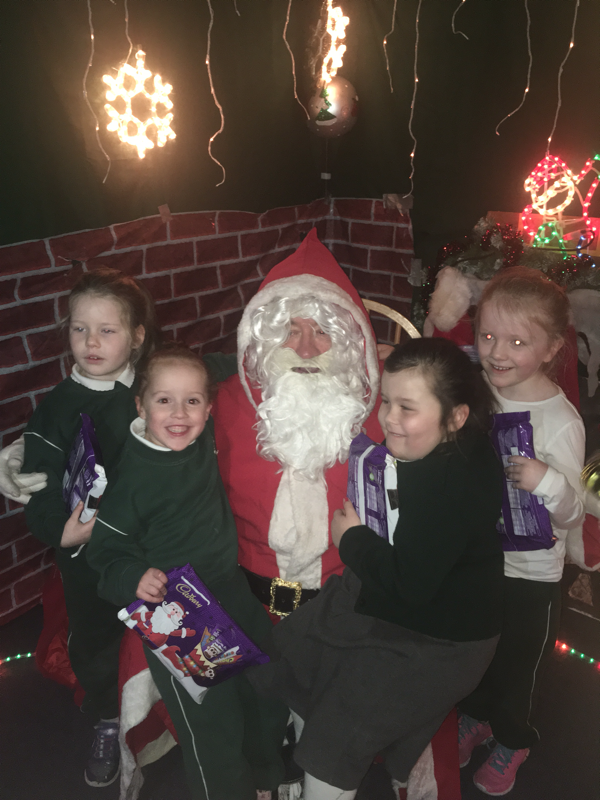 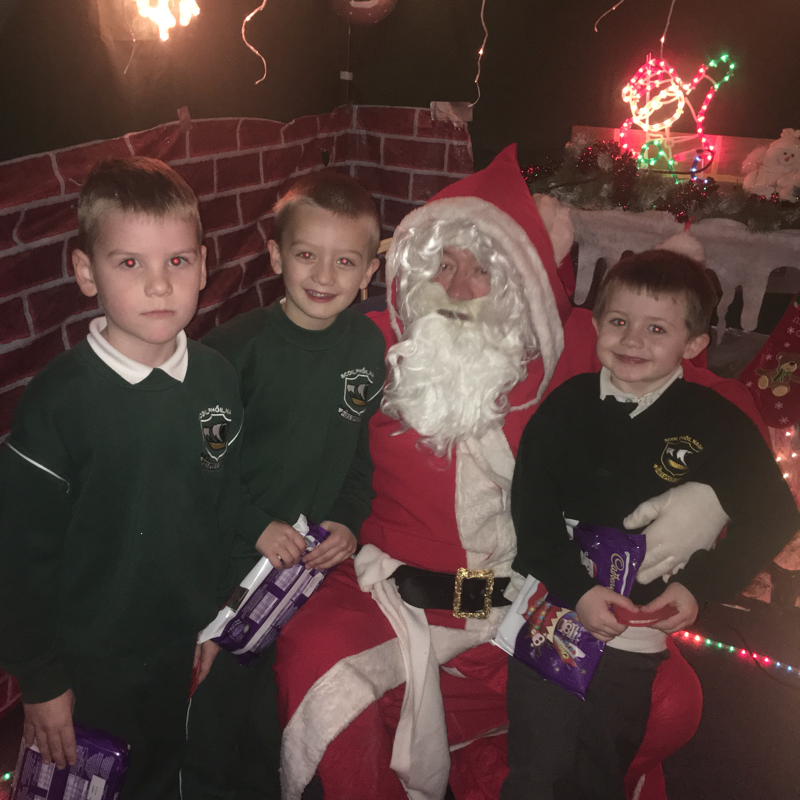 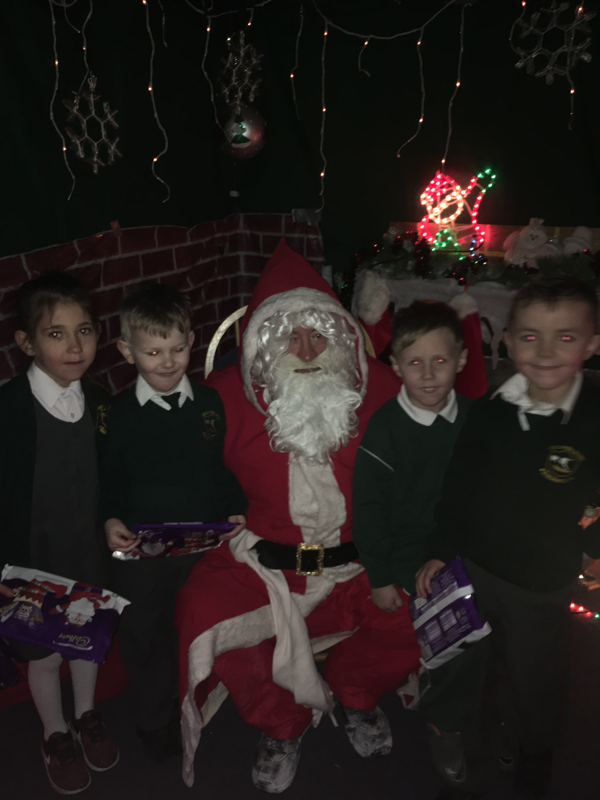 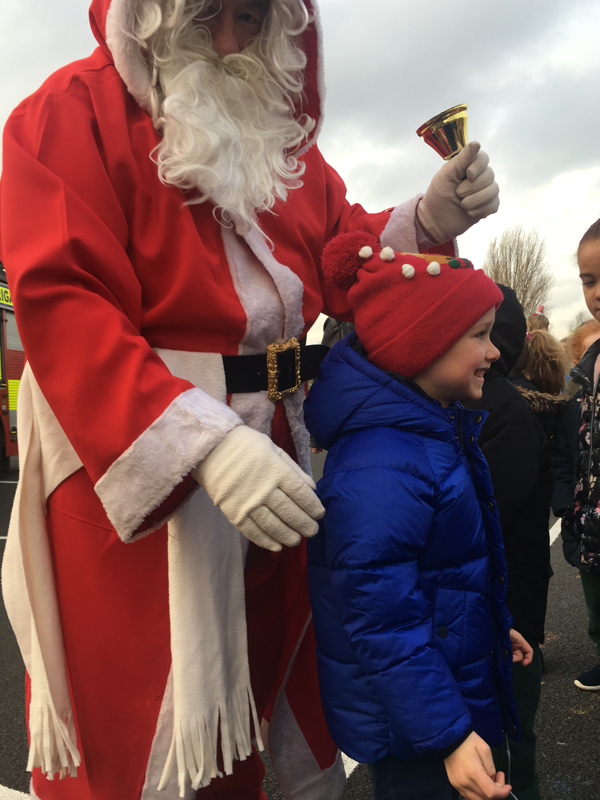 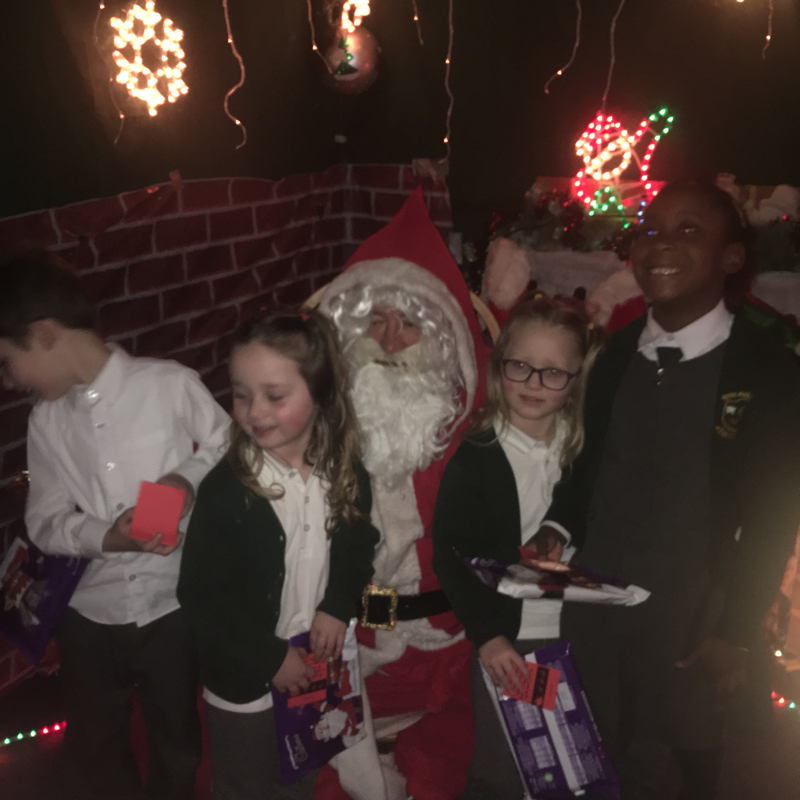 A big thank you to Kilbarrck Fire Station, our wonderful Parents Addociation and Santa for making the most magical and memorable day. 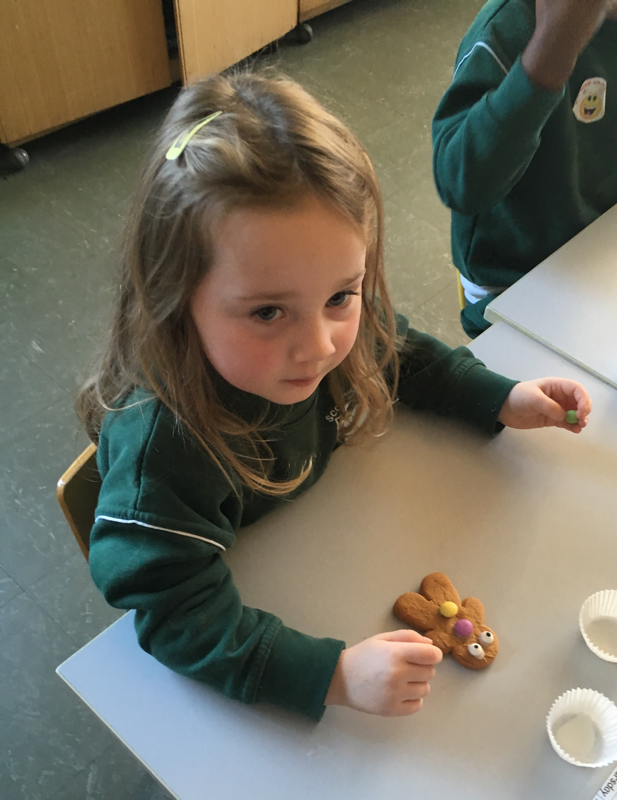 We have really enjoyed listening to the story of The Gingerbread Man. As a treat, teacher brought in some Gingerbread Men that she baked. 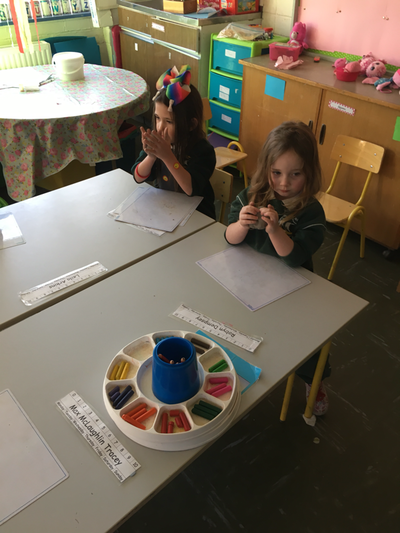 We then decorated them with smarties and google eyes!! They were really yummy! 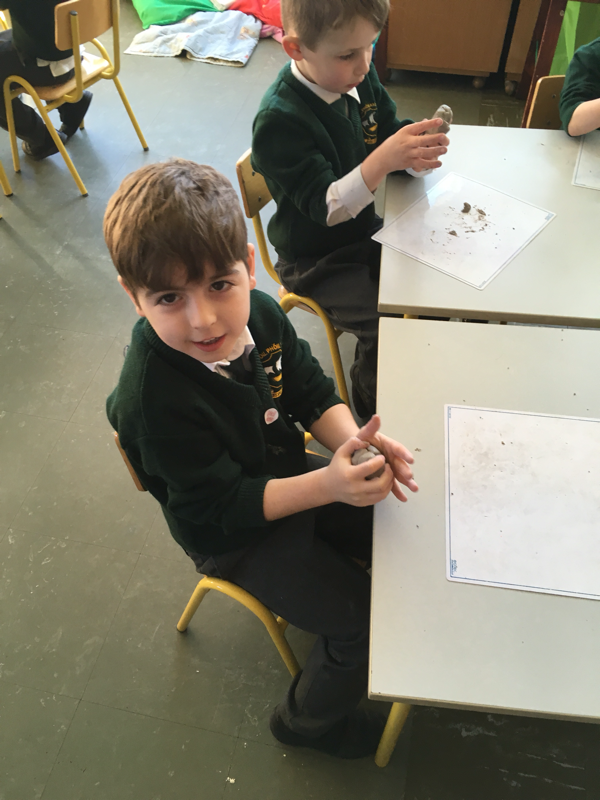 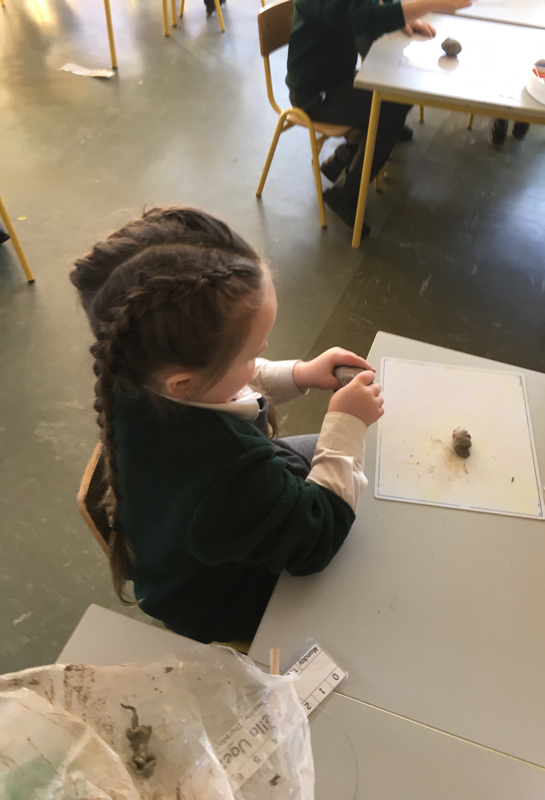 We had so much fun in Room 1 during Science Week. 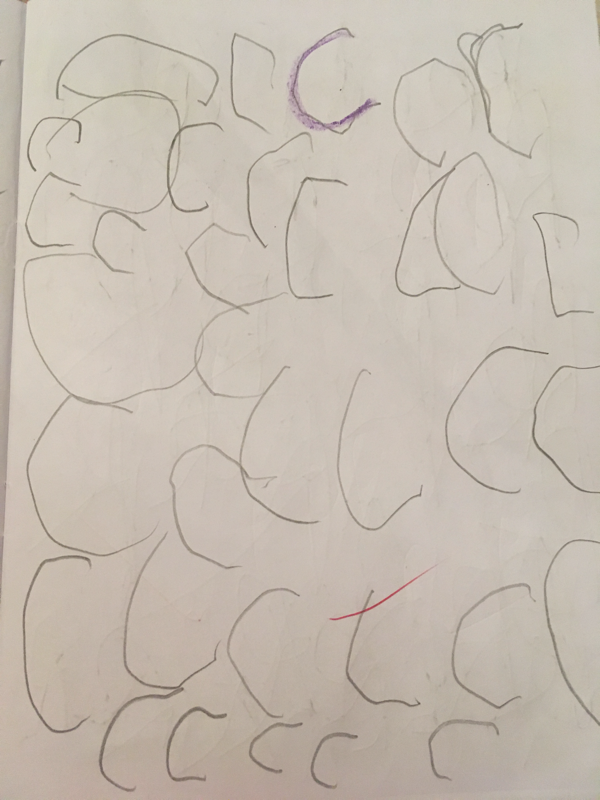 Our first expirement was on loud and quiet noises. 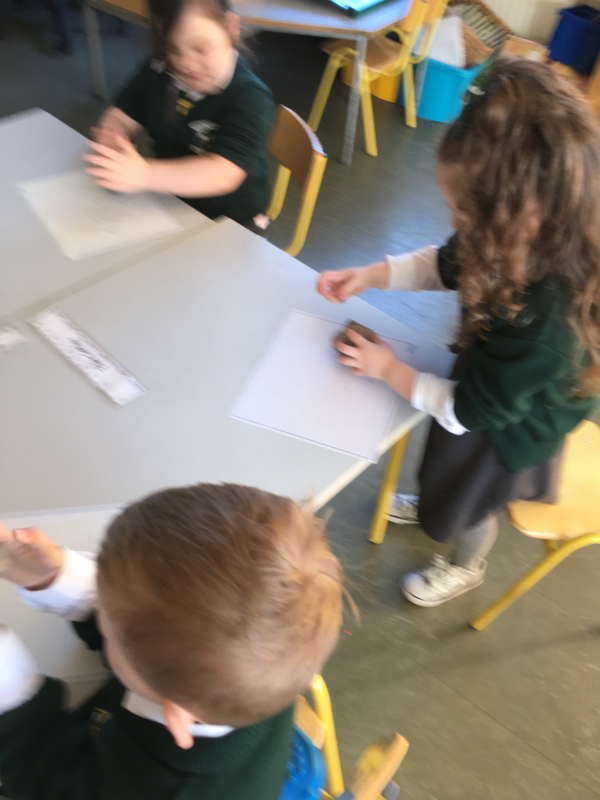 We made predictions on whether an object would make a loud or quiet noise. 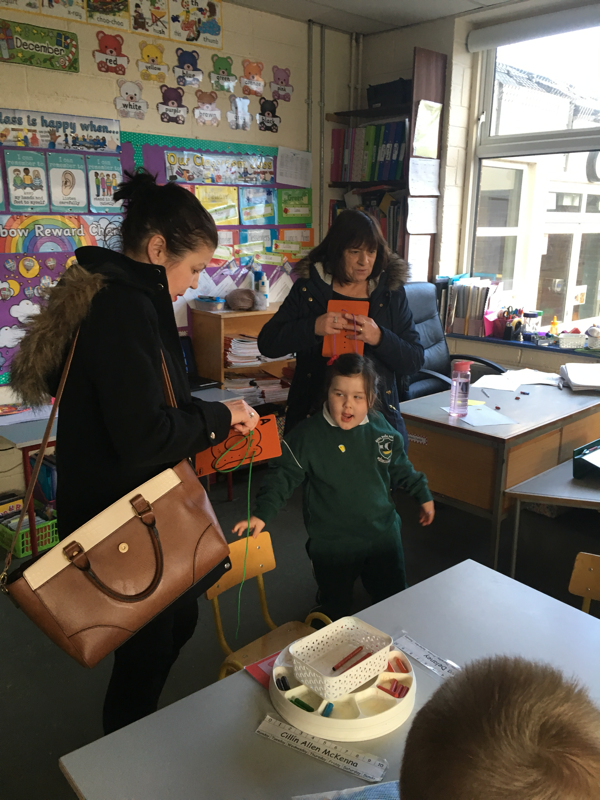 Then we tested the object by putting it in a lunch box! The second expirement was dancing raisins. In one jar was water and in the other 7Up. 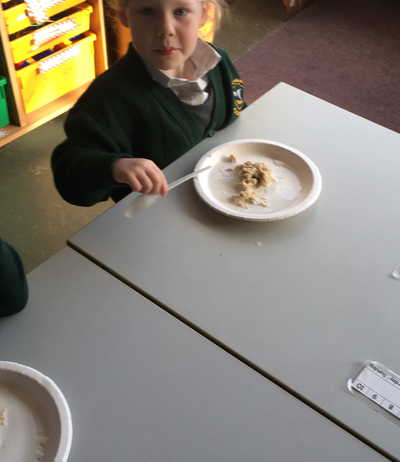 Raisins were then dropped into each. 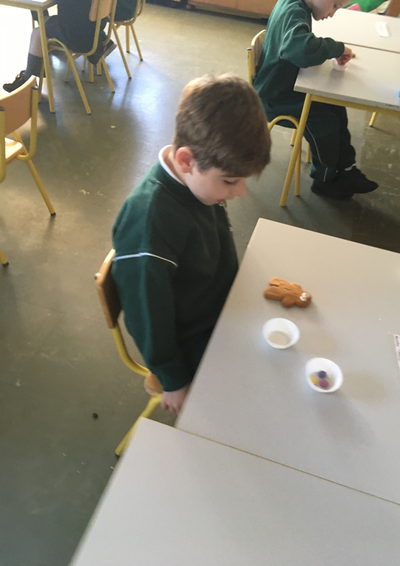 The raisins in the water sank to the bottom. The raisins in the 7Up moved from the bottom to the top of the jar for 18 minutes!!!!! 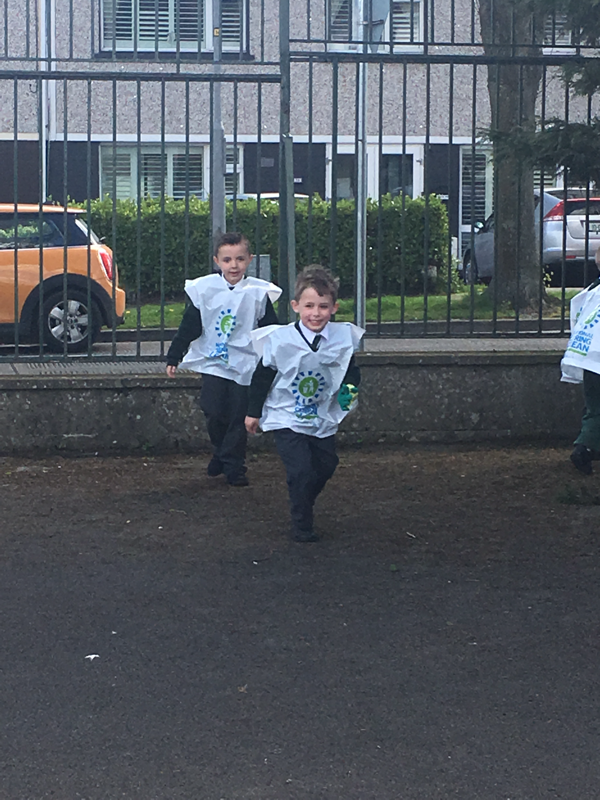 They danced in the 7Up because the 7Up has fizz called carbonated water which the raisins collect and release as they move in the jar. 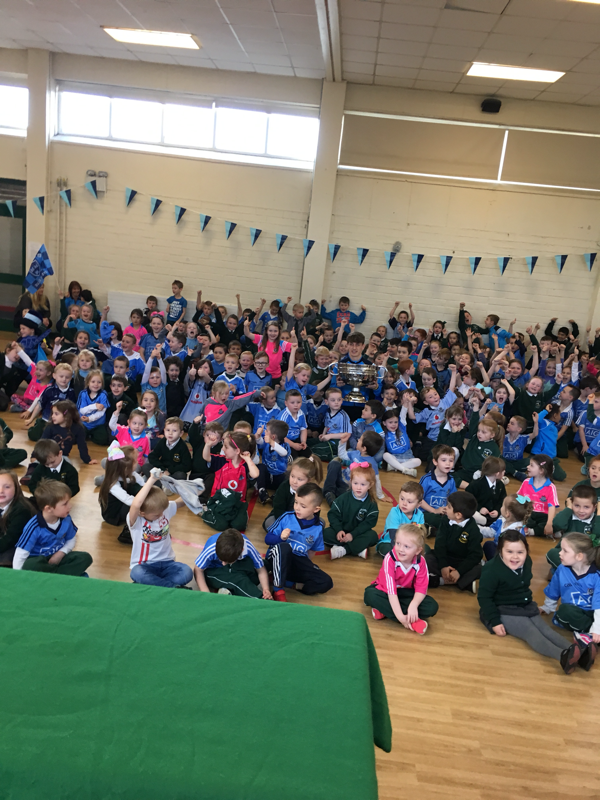 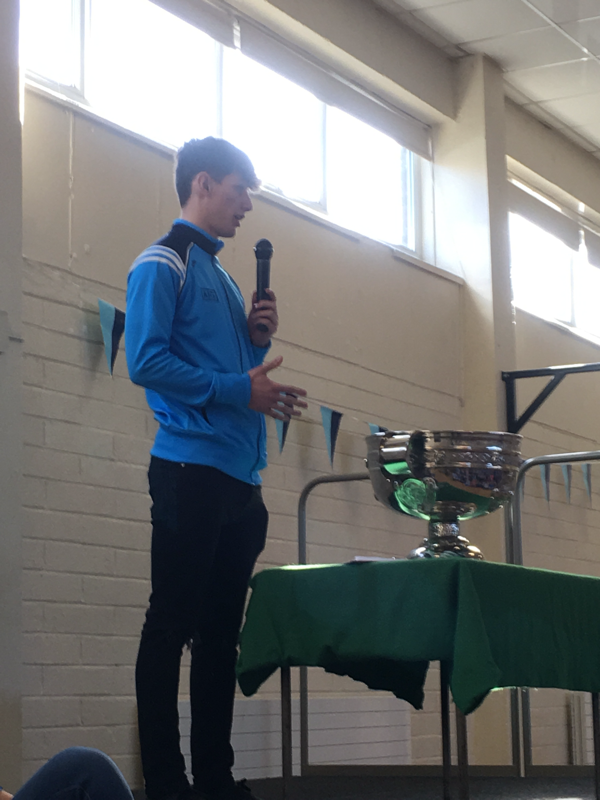 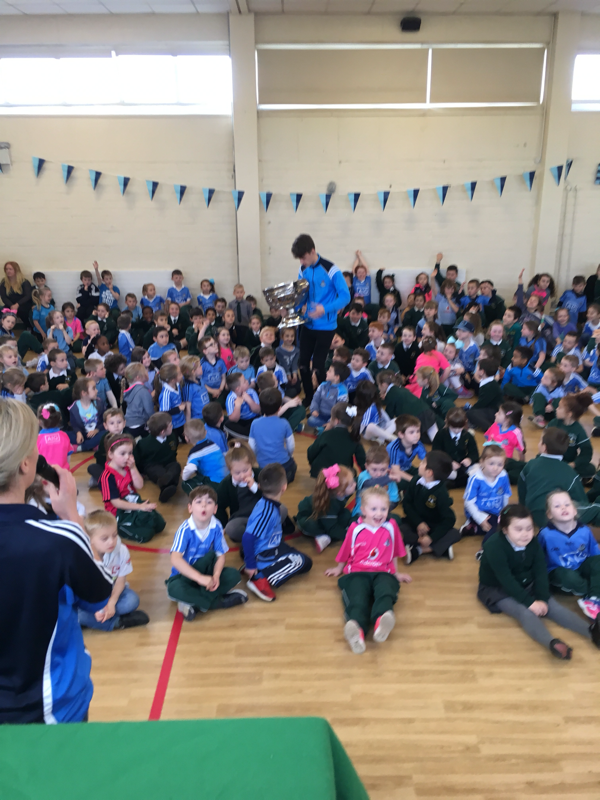 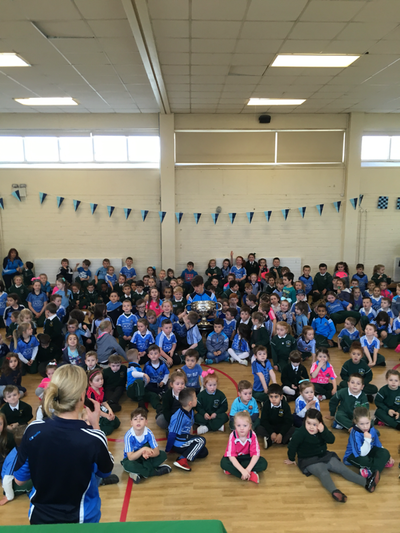 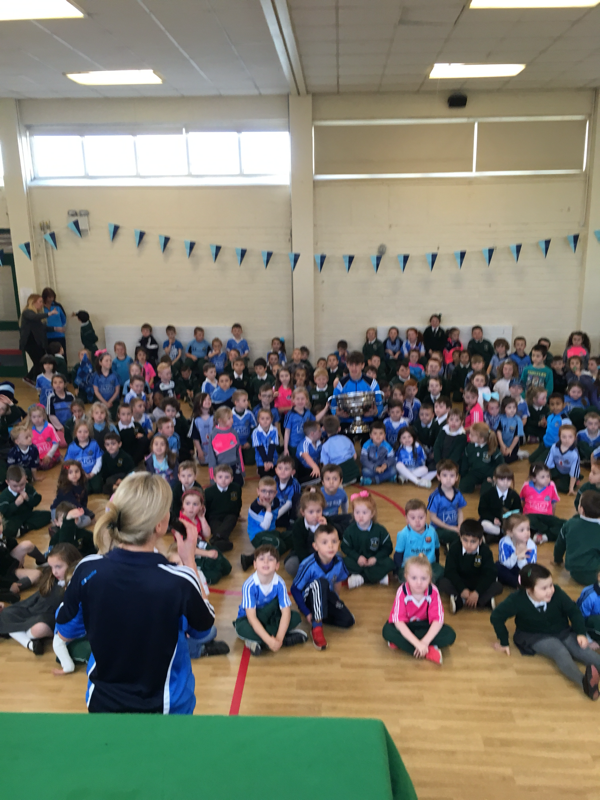 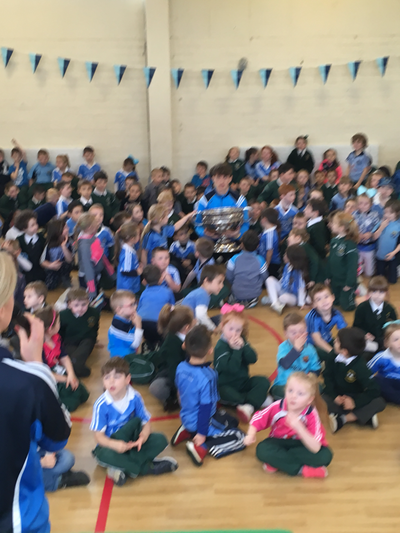 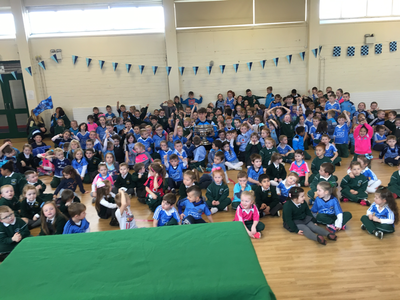 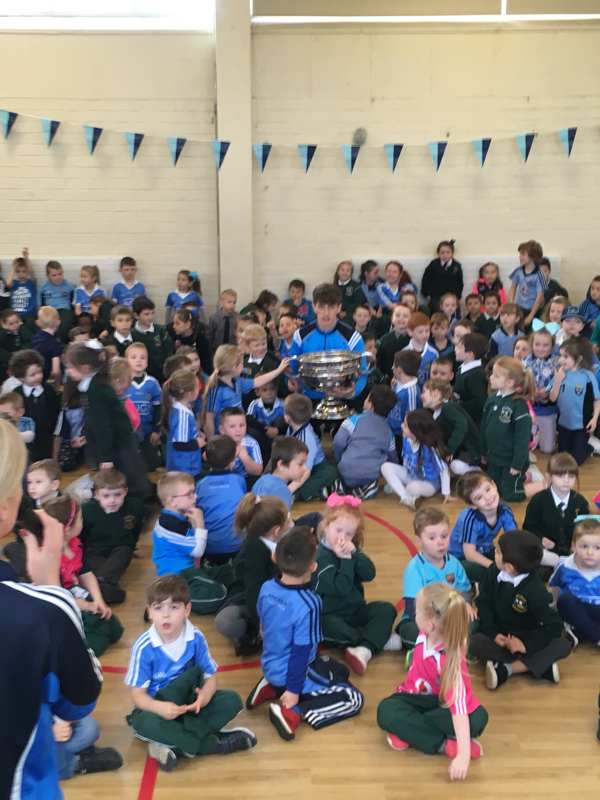 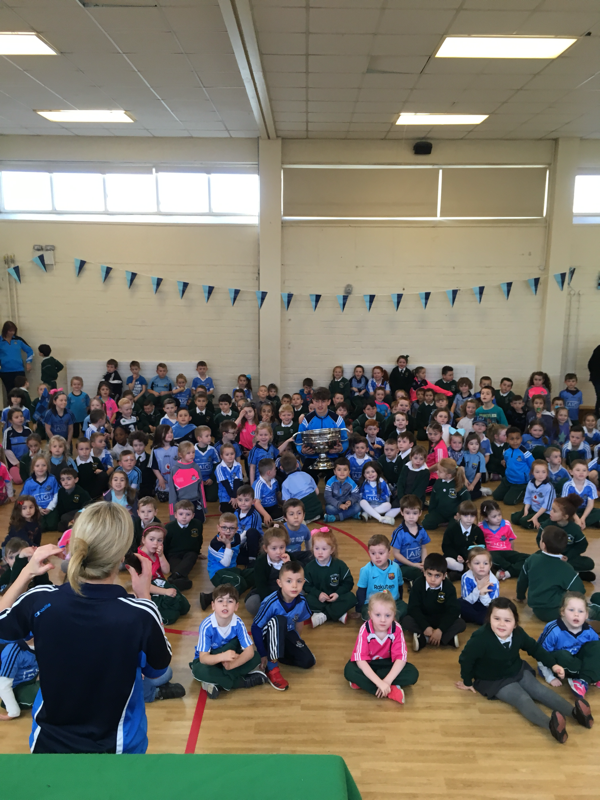 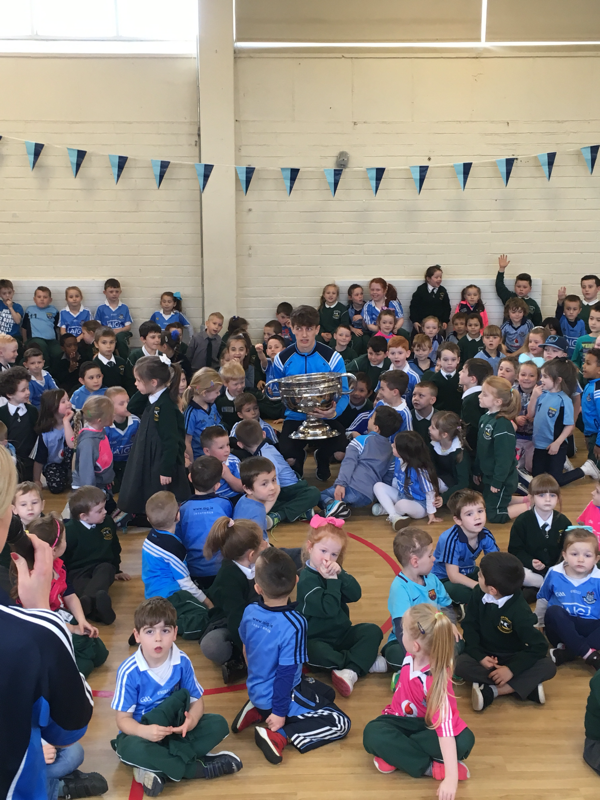 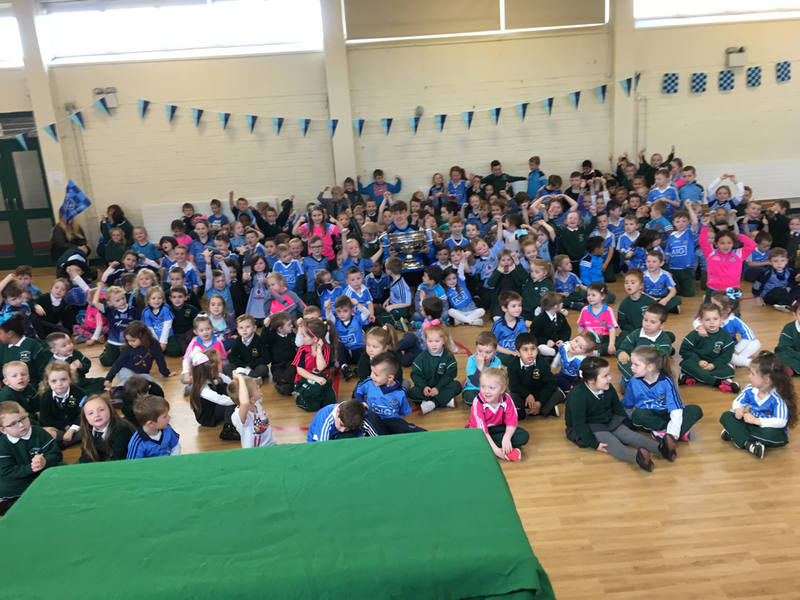 Today the Sam Maguire cup cane to our school with the sub-goalie for the Dublin team Evan Comerford. 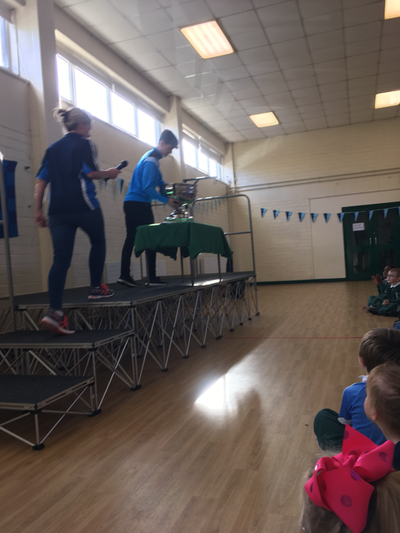 We were so excited to see the cup and hear all the fantastic things Evan has to say about being on an All Ireland winning team. 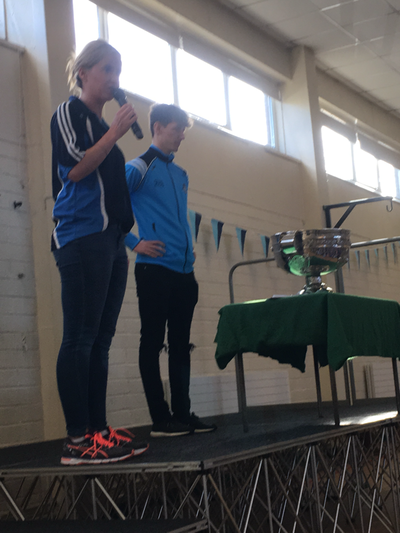 Thank you to David our GAA coach for organising this special day. 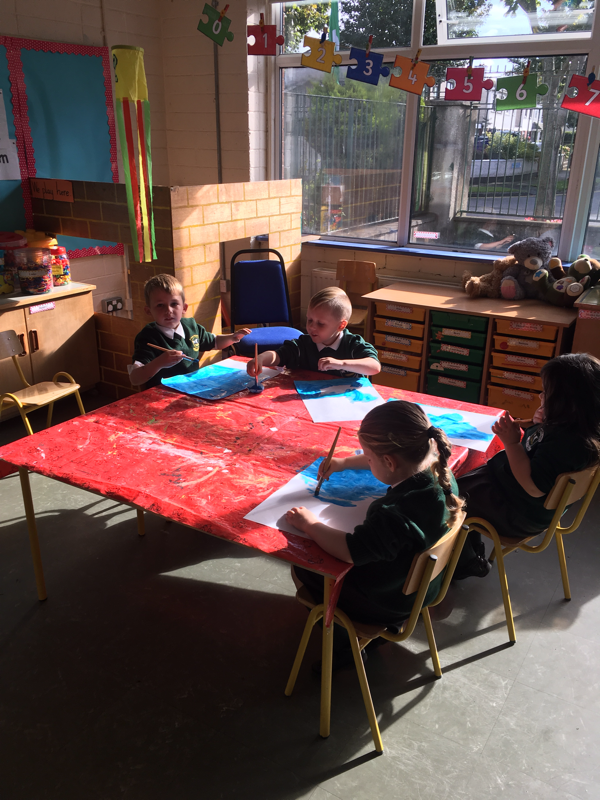 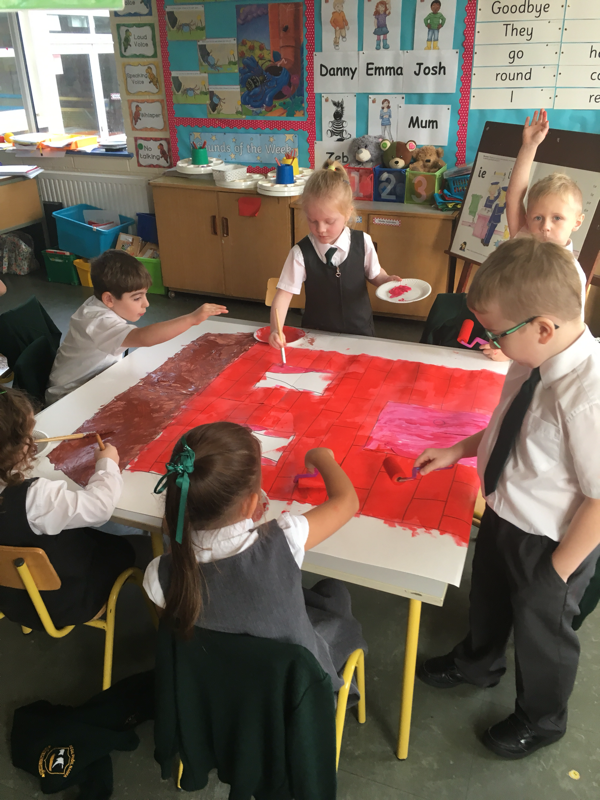 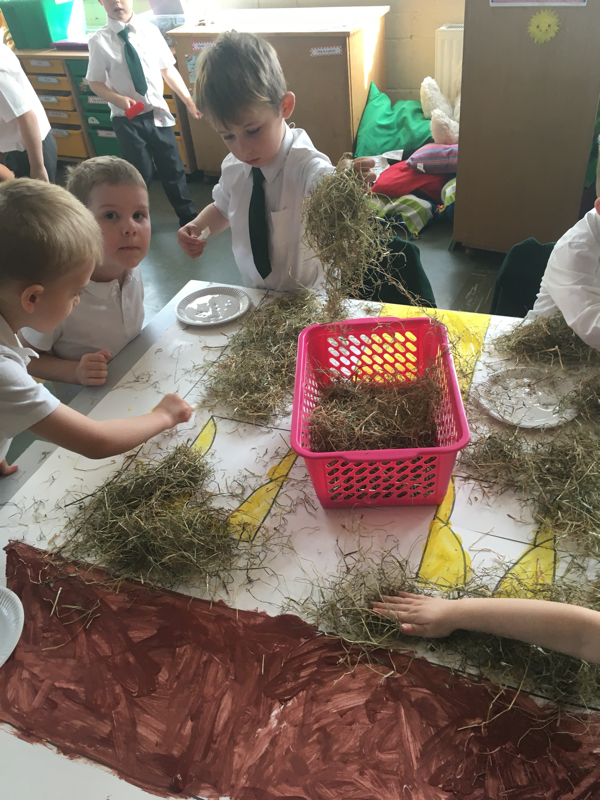 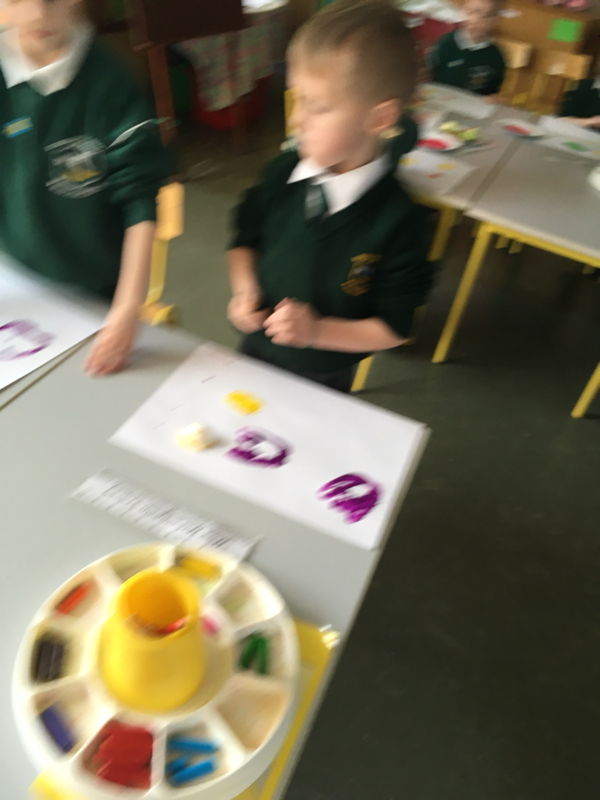 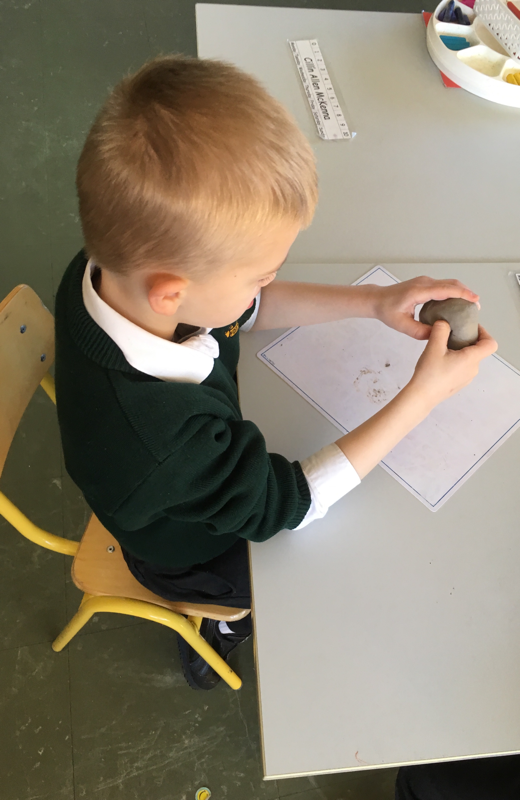 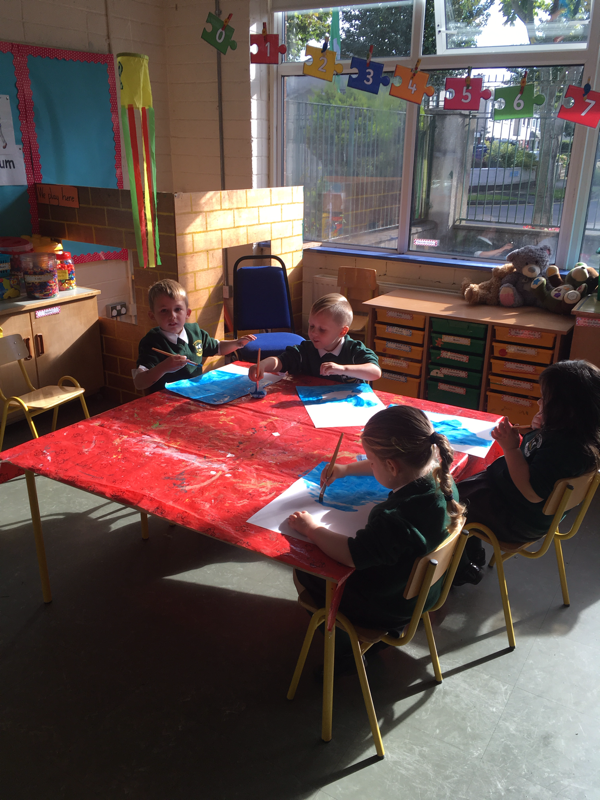 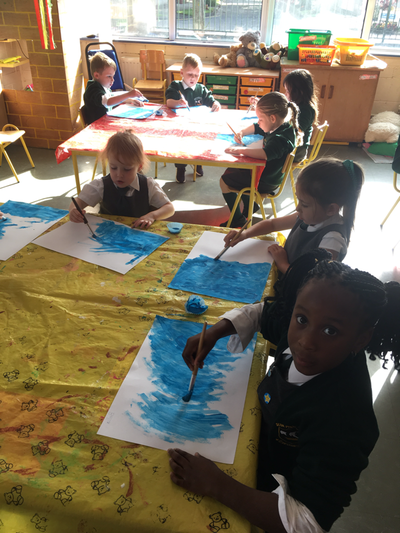 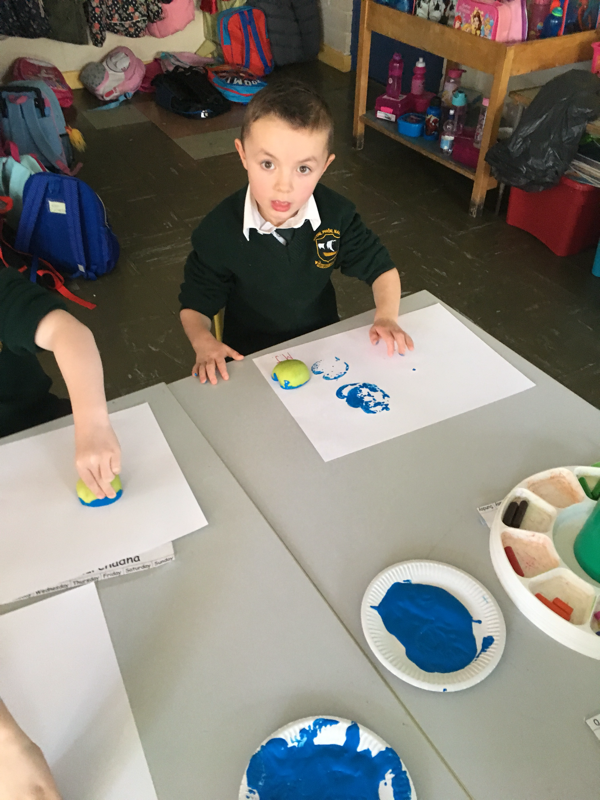 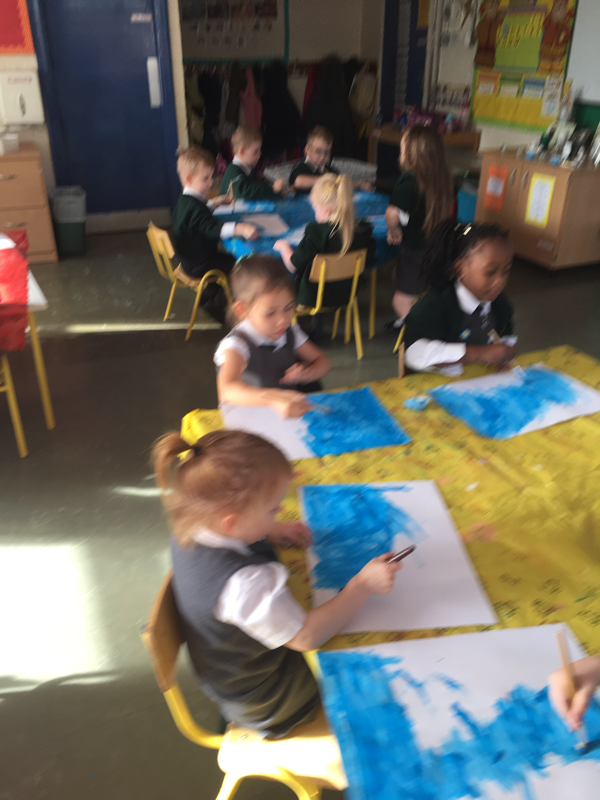 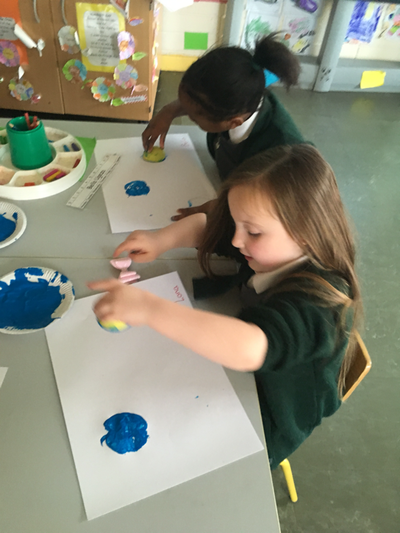 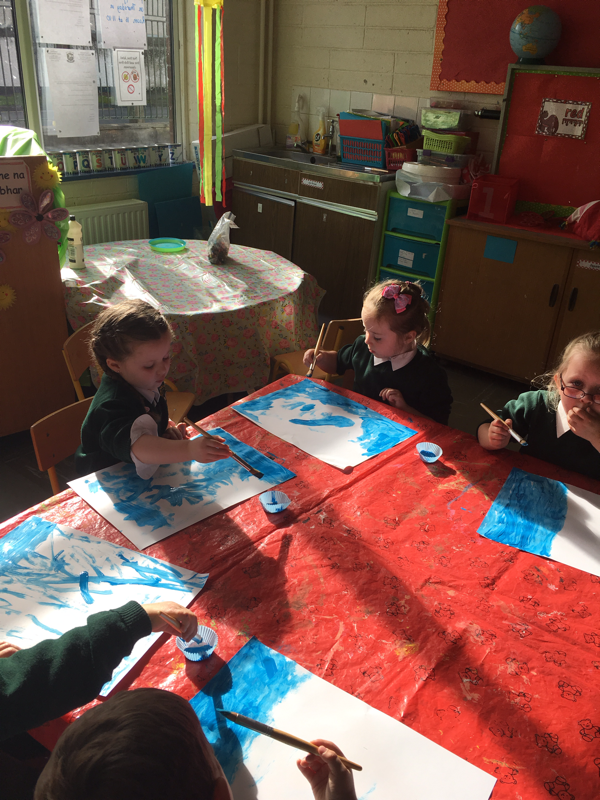 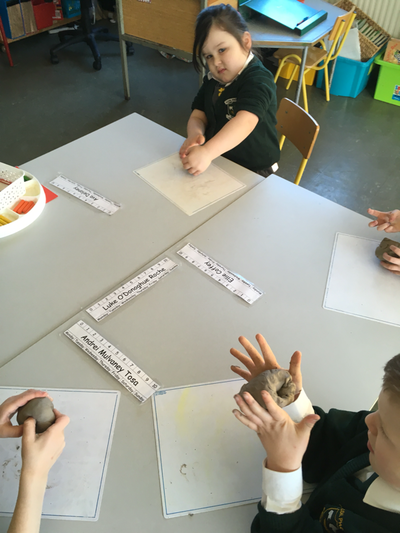 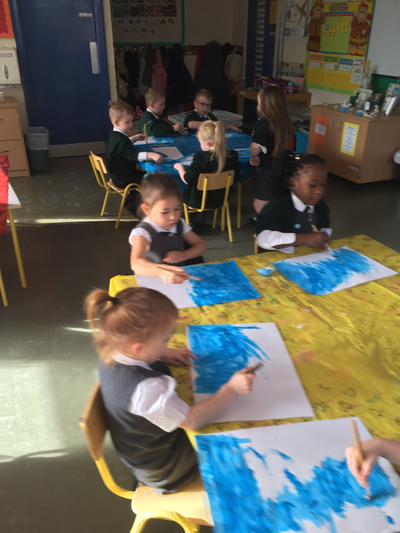 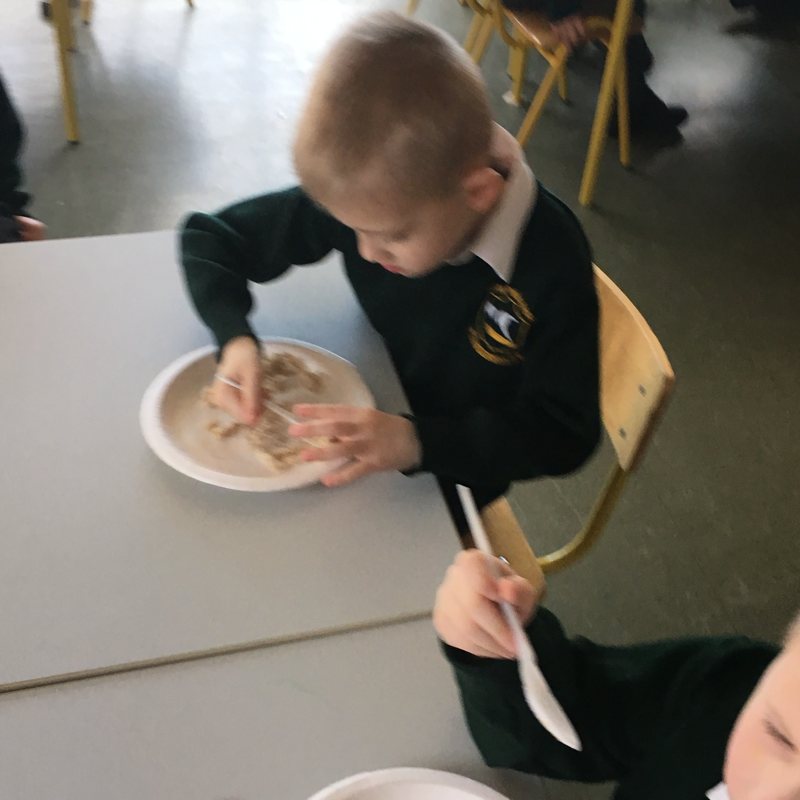 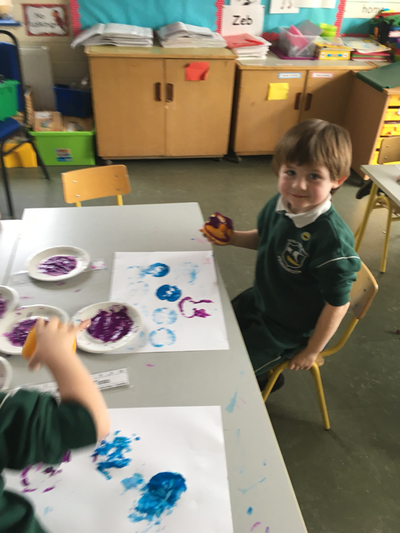 During Golden Time this week we had two fun activities. 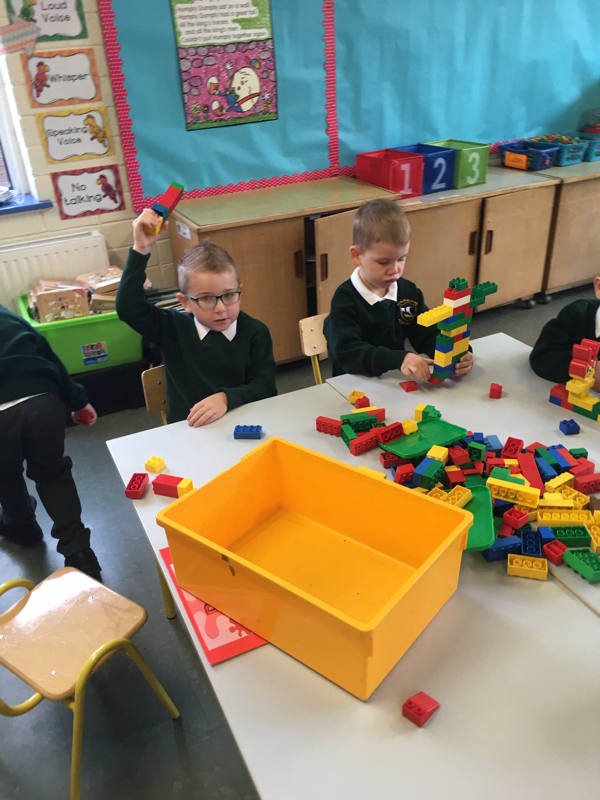 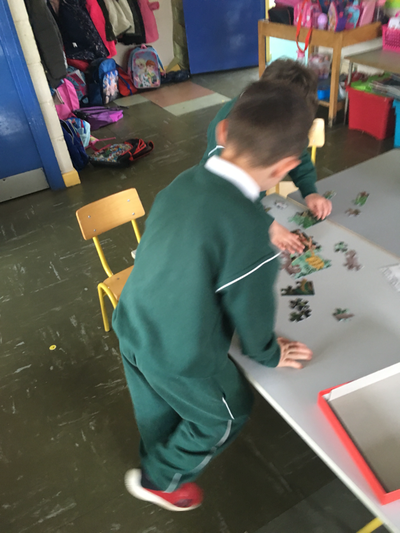 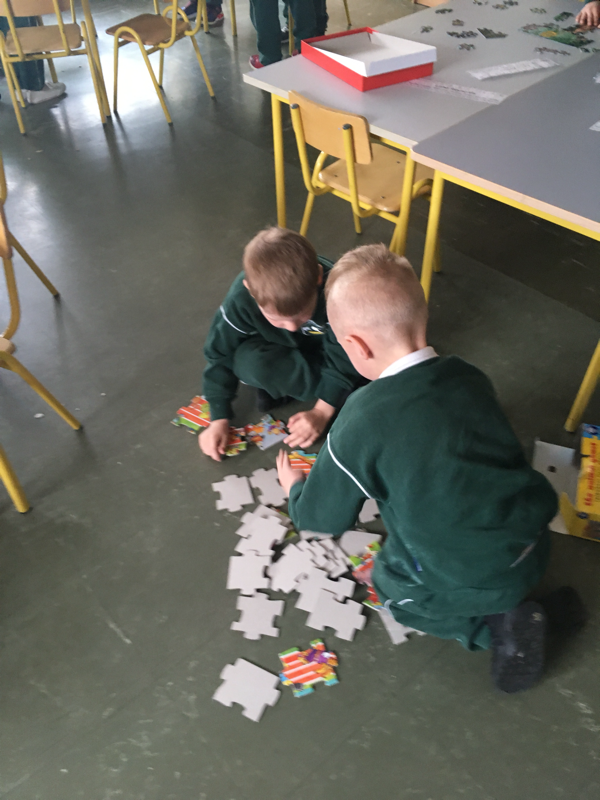 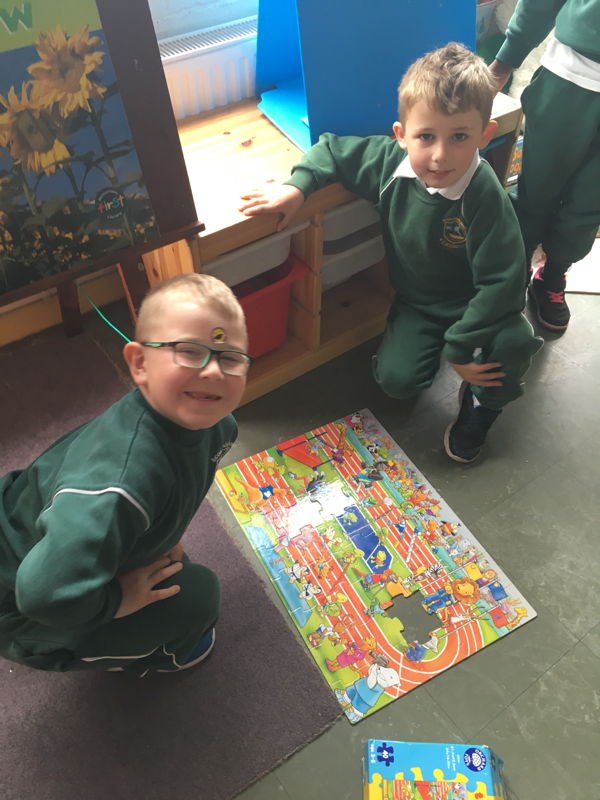 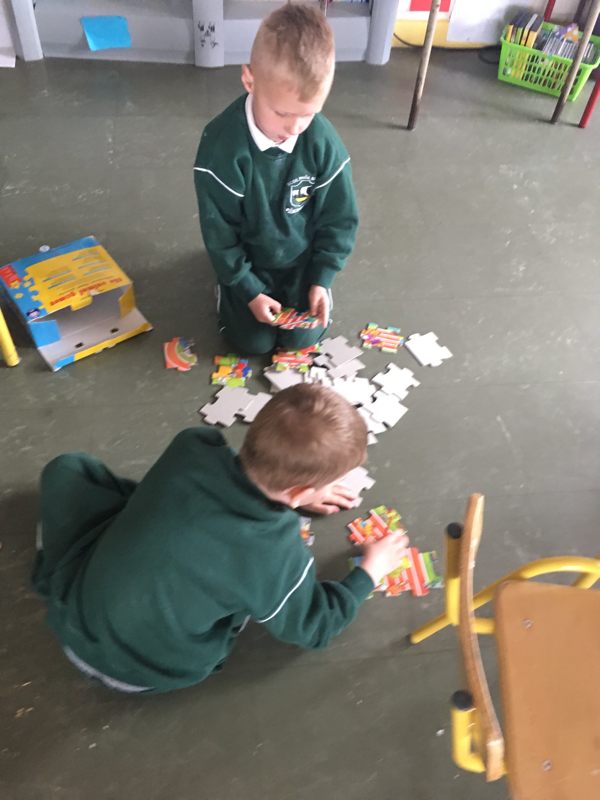 One group played with jigsaws whilst the other group used the large building blocks. When time was up we swapped over and played the other activity. 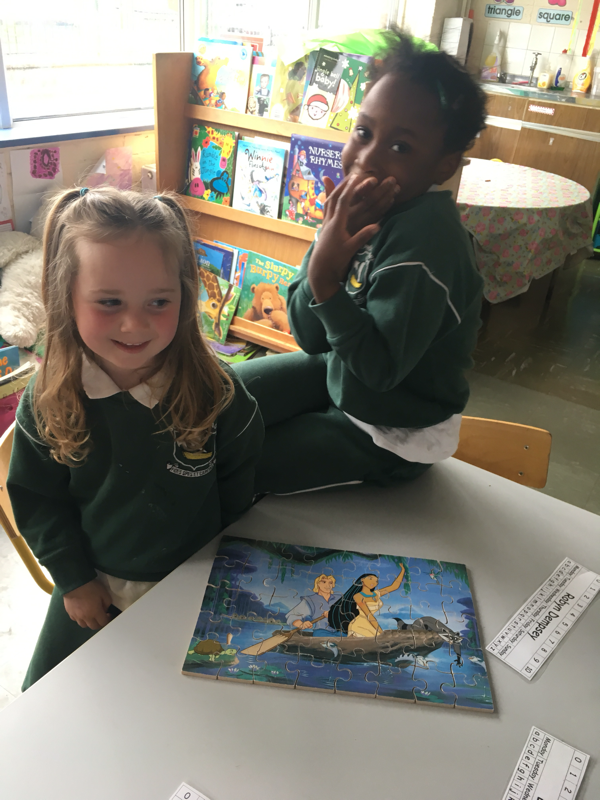 We are getting better every day at our jigsaws. 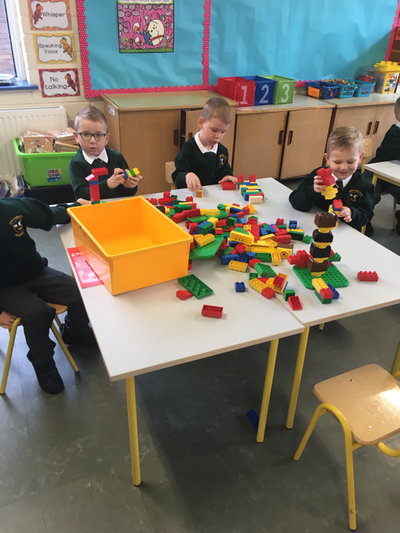 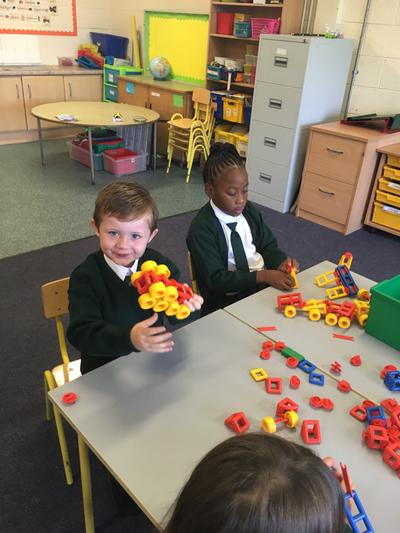 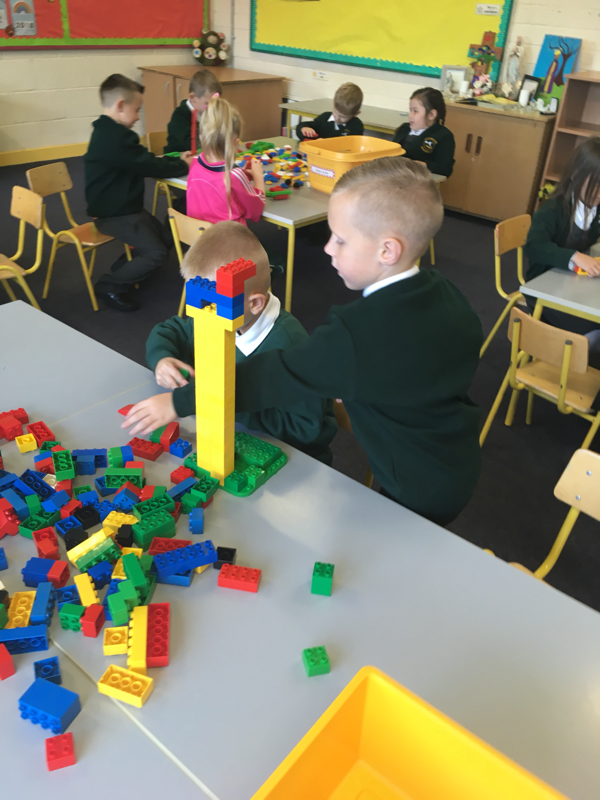 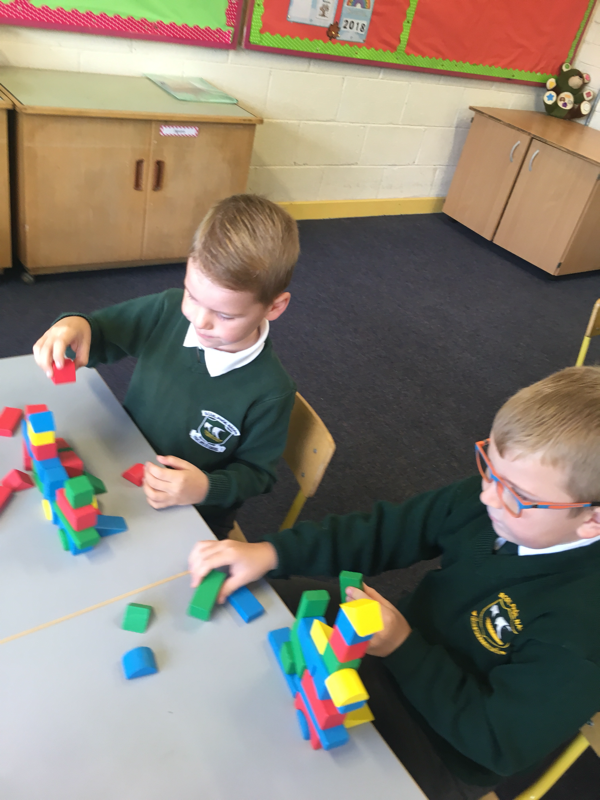 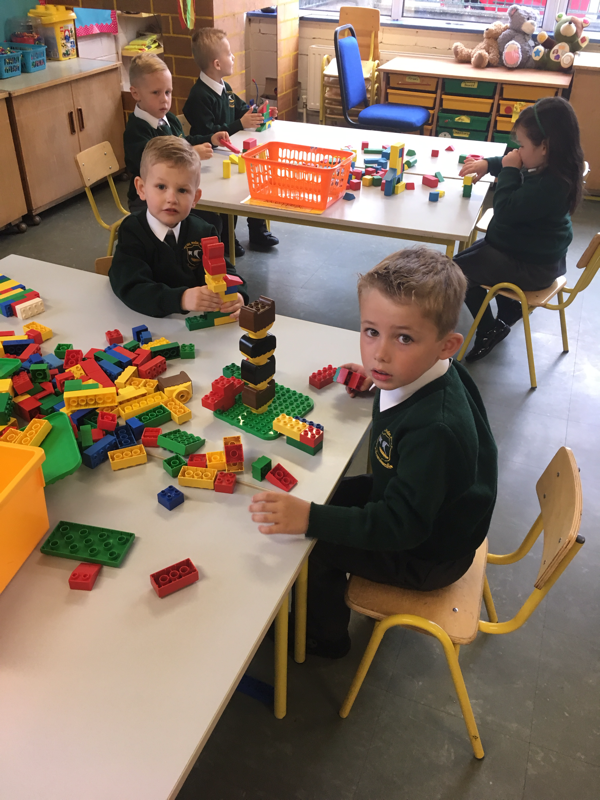 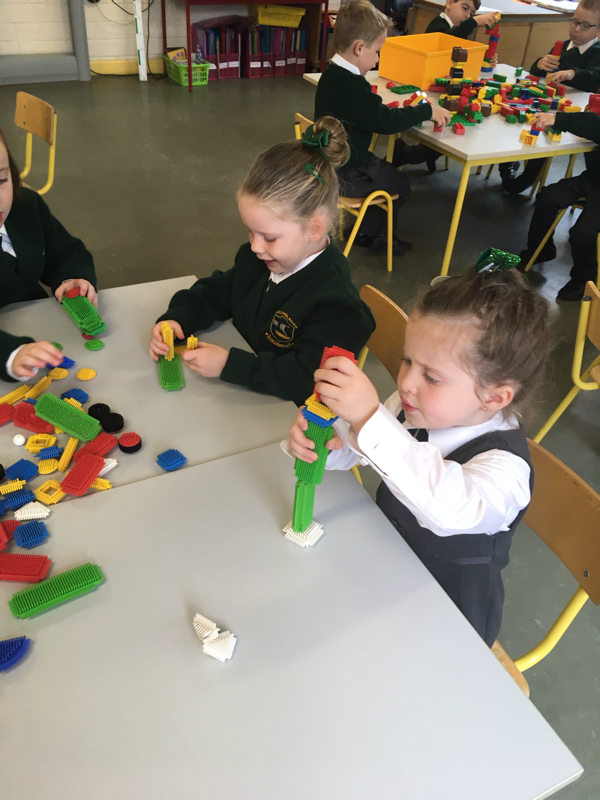 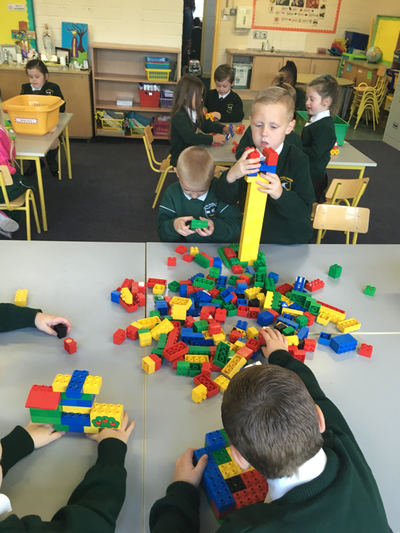 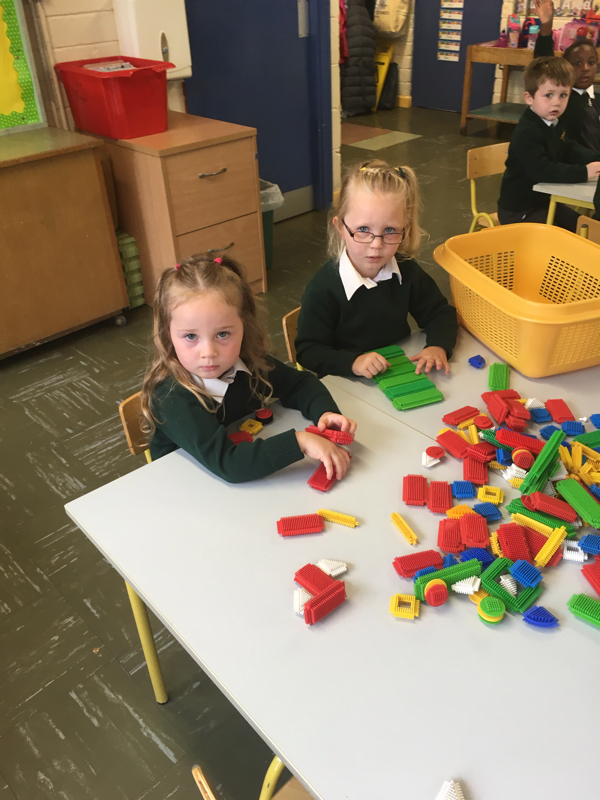 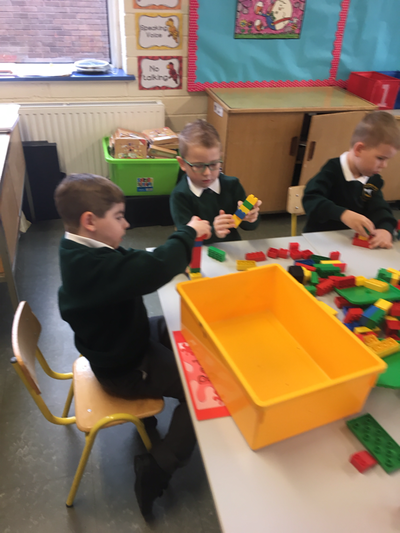 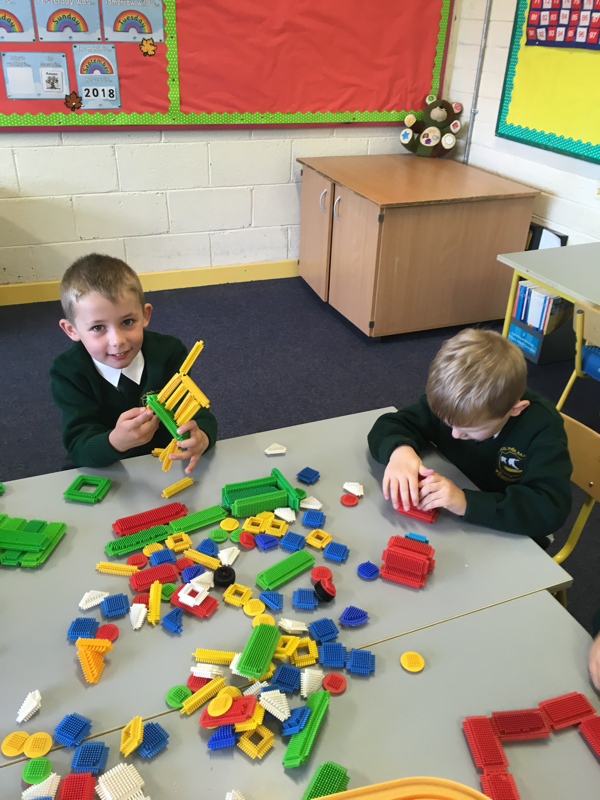 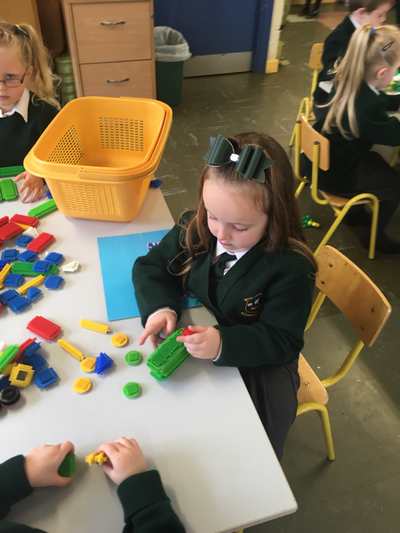 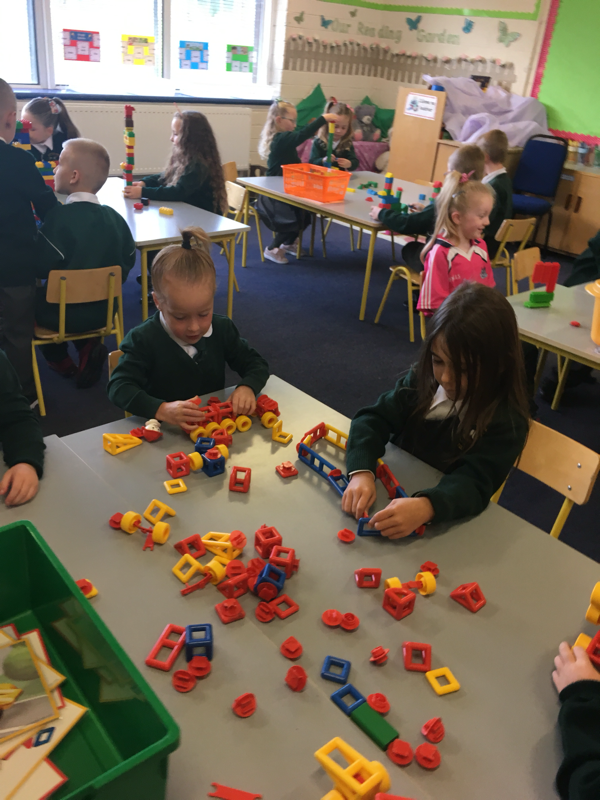 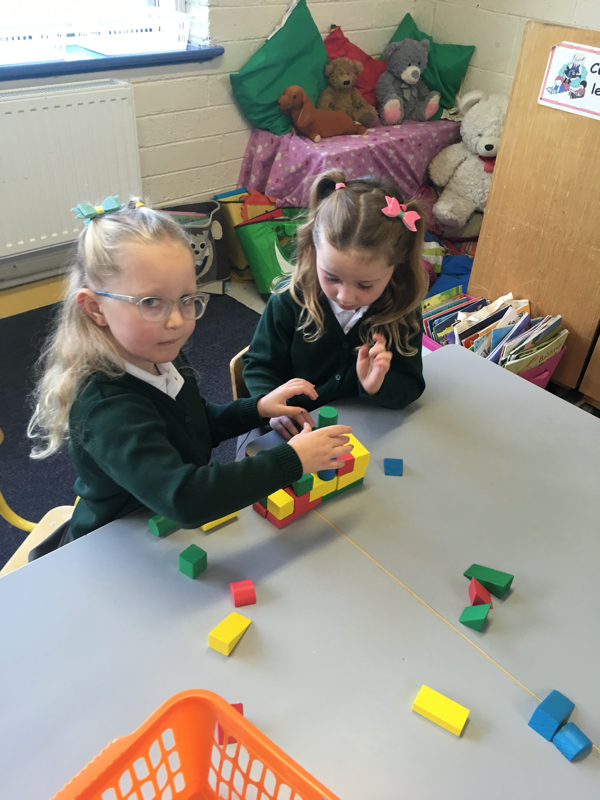 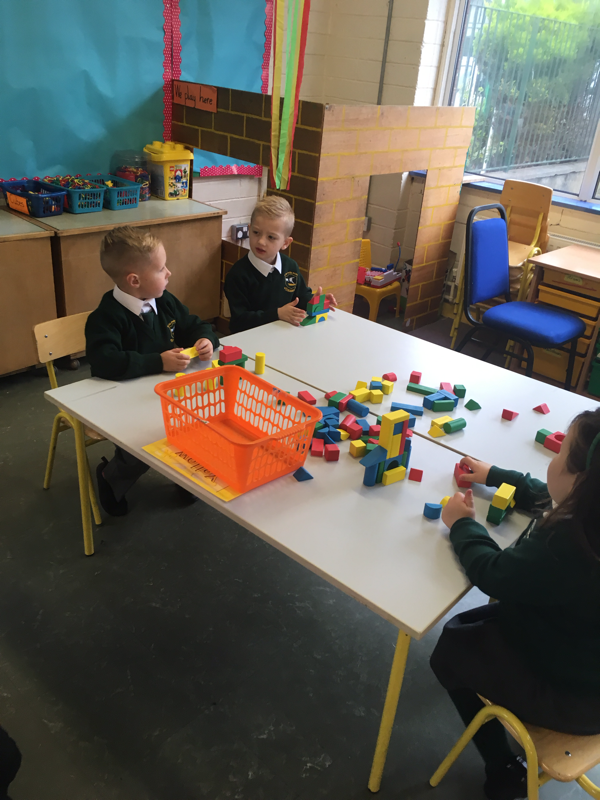 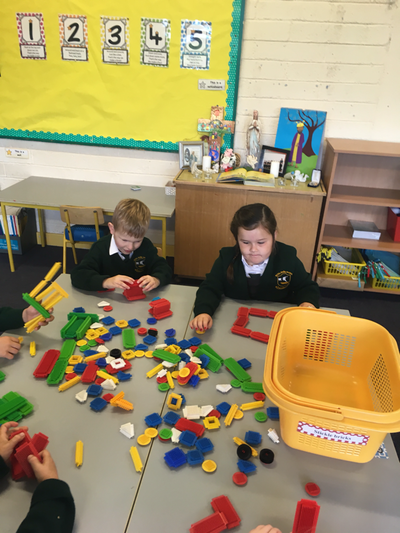 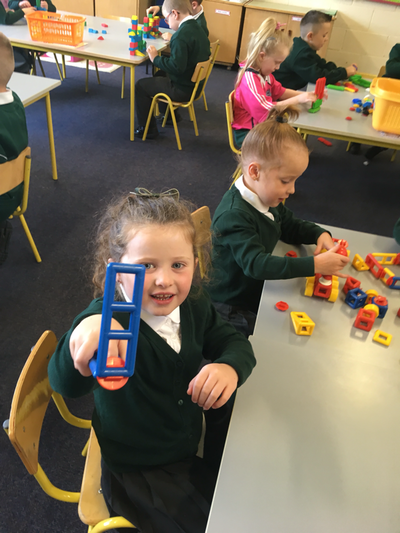 We are already looking forward to the next time we play with the blocks. 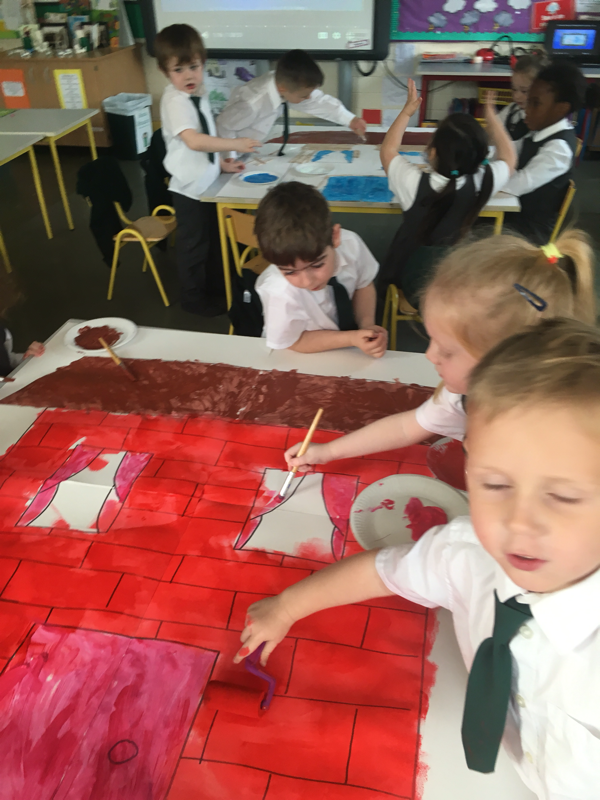 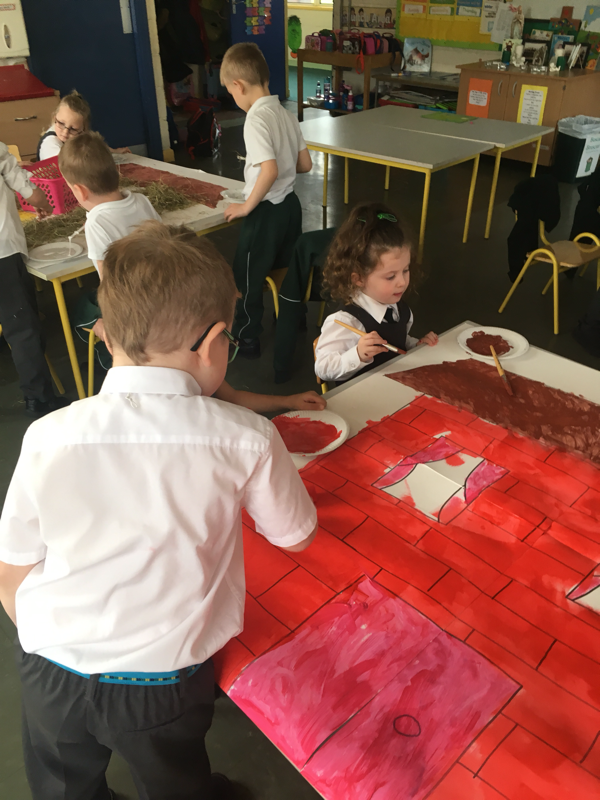 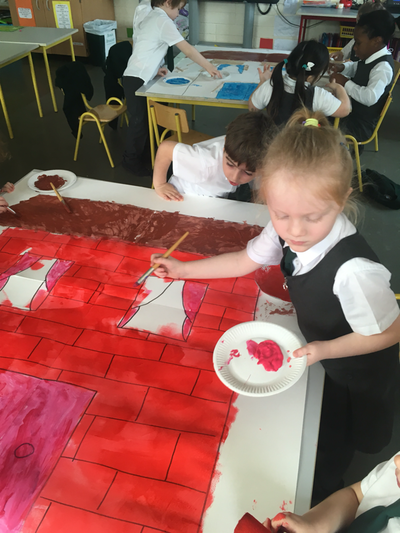 In Art this week we worked in groups to make a collage of The Three Little Pigs. One of the houses was made from lollipop sticks, another from straw and the last house we painted to look like bricks. 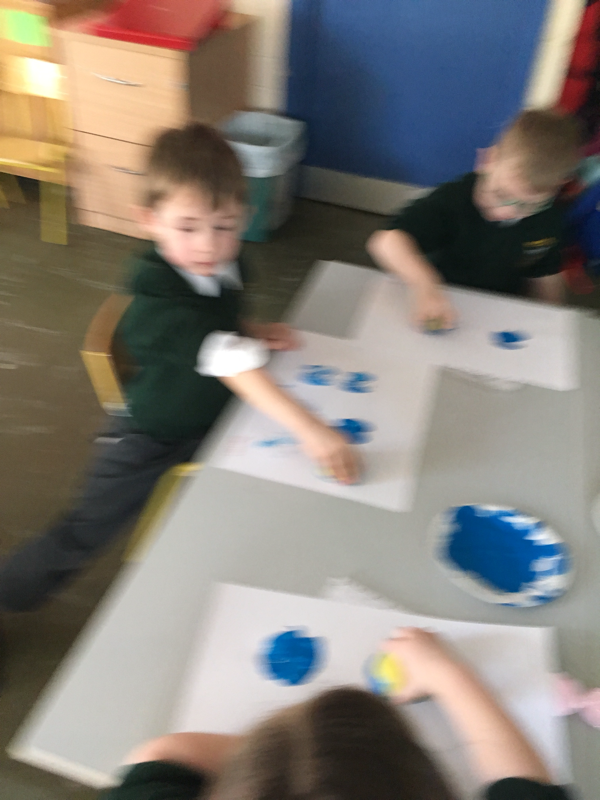 It was a really mess art and we loved it. On Friday, teacher told us she had a “super surprise” for us - baking. We would make spooky Halloween spider fairy cakes. 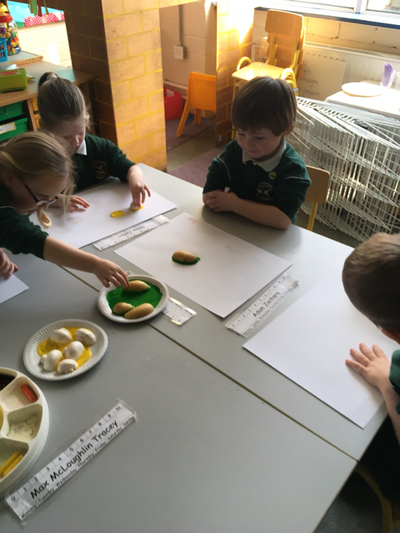 First, we named the ingredients - eggs, flour, sugar, butter and a little water. 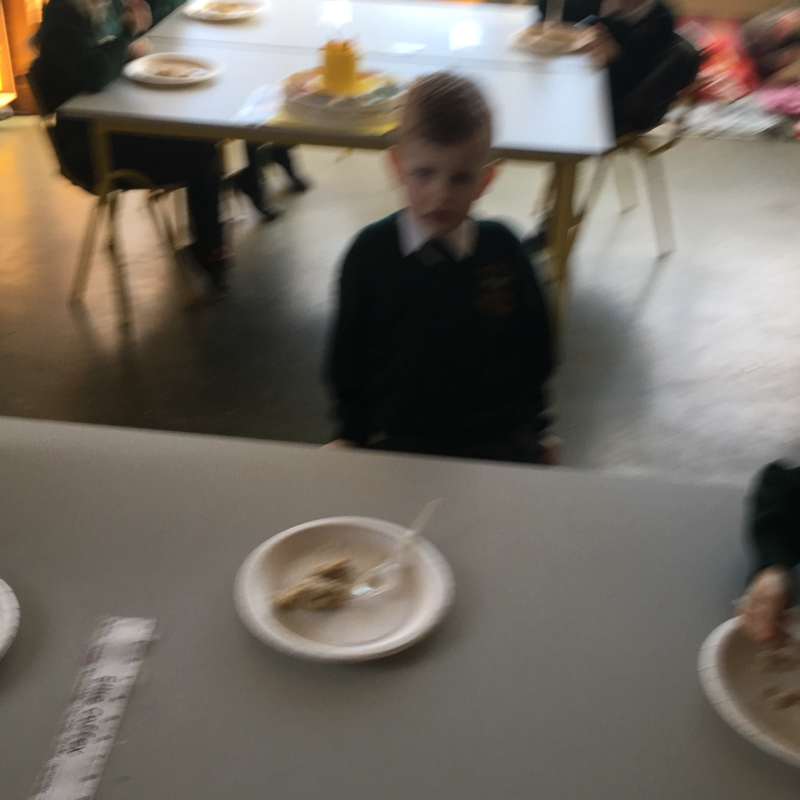 Next, we looked at and talked about the various utensils we would use. 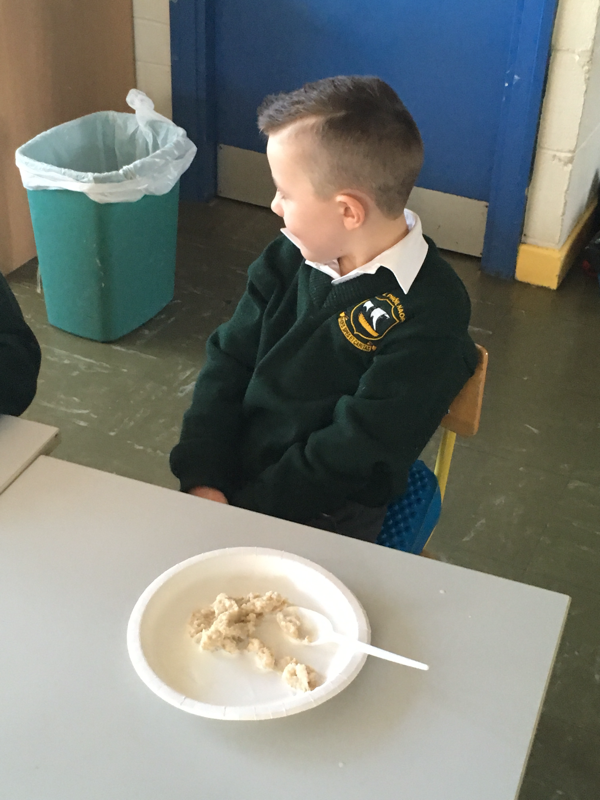 Then, we combined the ingredients to make the mixture for the fairy cakes. 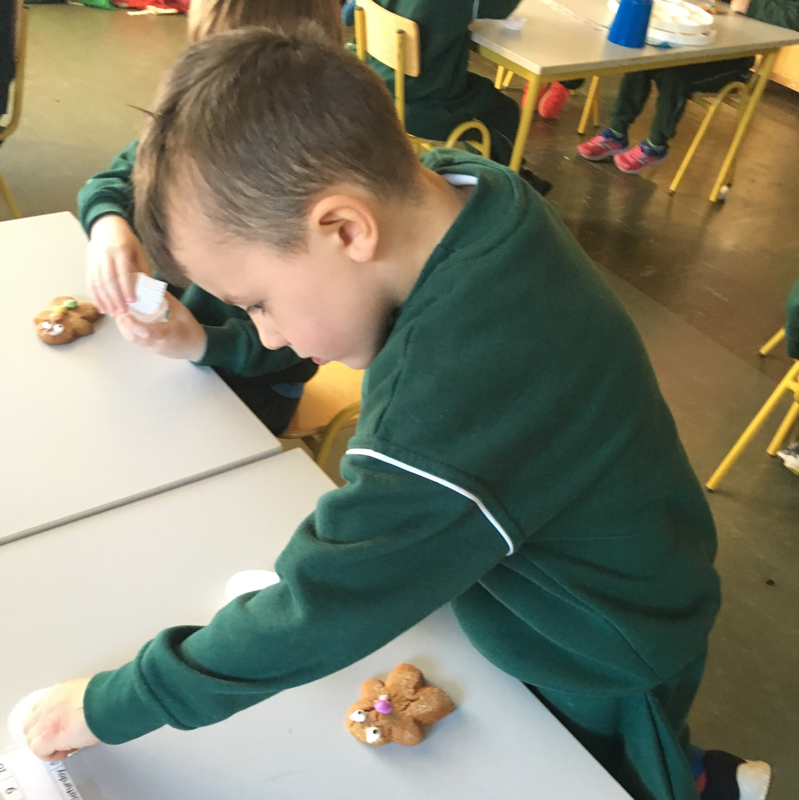 Afterwards, teacher put the mixture into the bun cases and put them in the oven!! 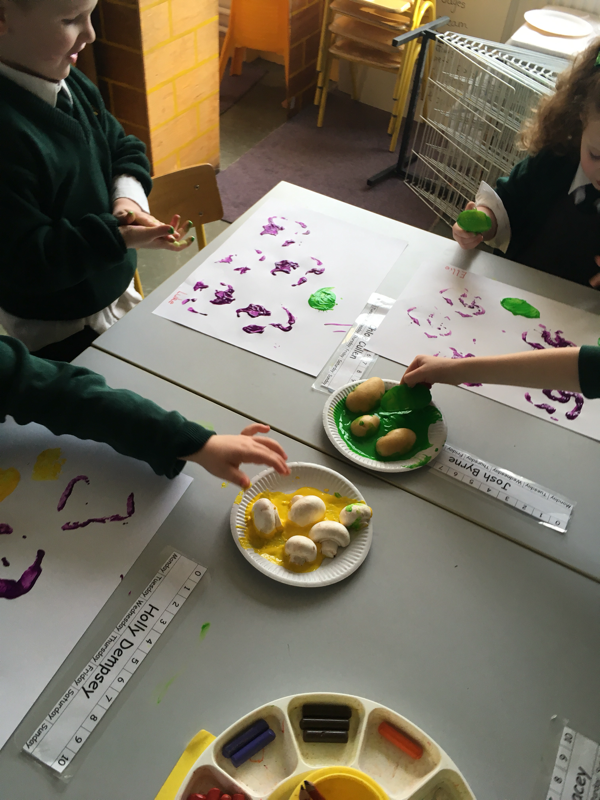 When the buns cooked downteavger decorated the buns like spooky Halloween spiders. 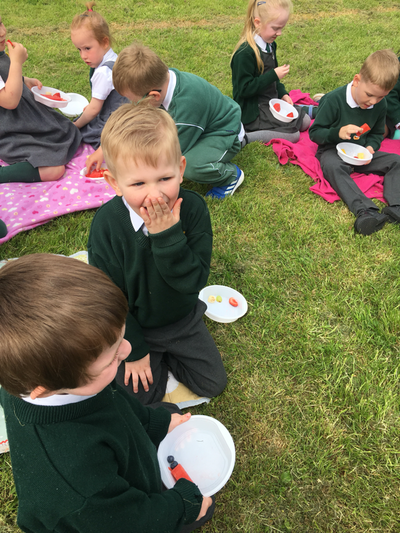 They were yummy and delicious. 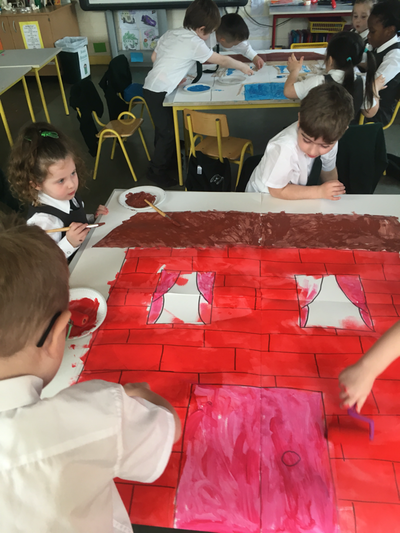 This week the boys and girls in Room 1, were working extra hard in preparation for Halloween. 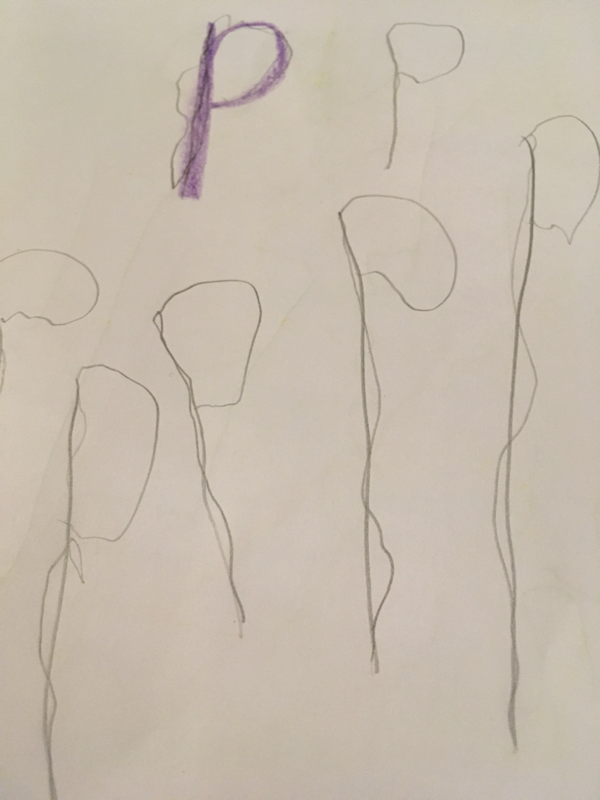 We made spooky art decorations and learned frightening poems. We also learned the song, The Halloween Ghost, which we performed in front of the whole school at our show. 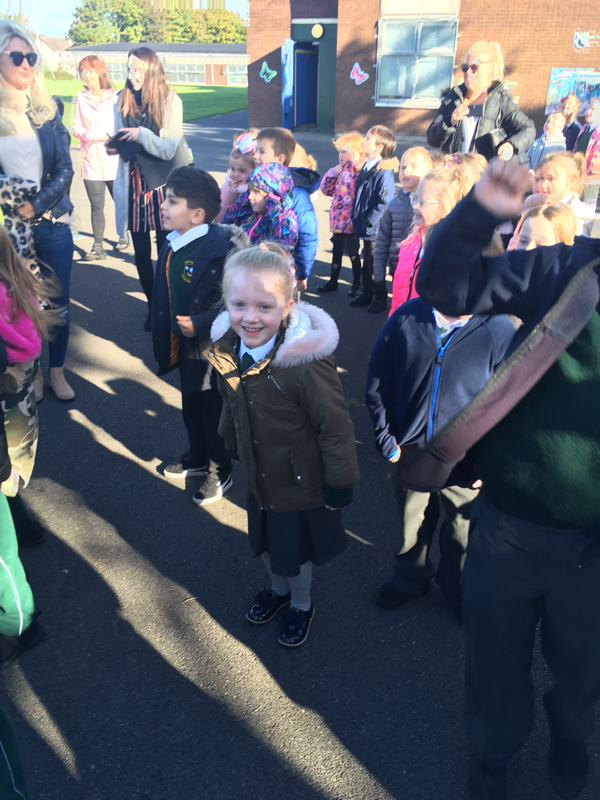 We sang it out really loud for everyone to hear. 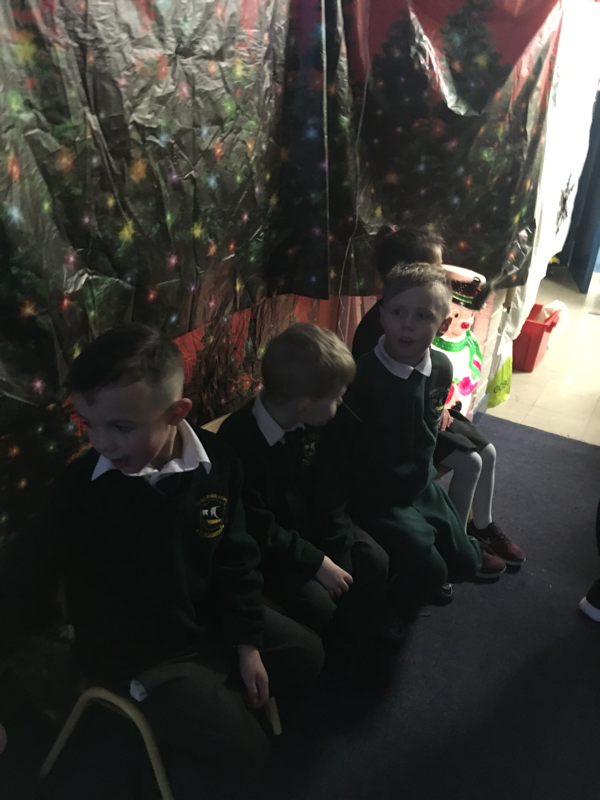 We visited the spooky haunted room in school. We decorated Halloween treat bags and we also received some yummy treats. 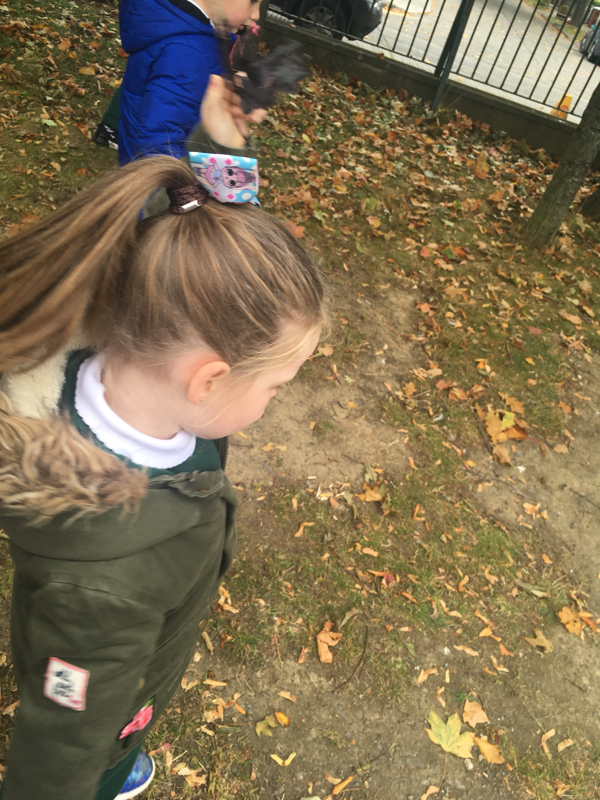 We went on our Witches Walk in the estates around school. A very big thank you to all who donated to the Witches Walk. 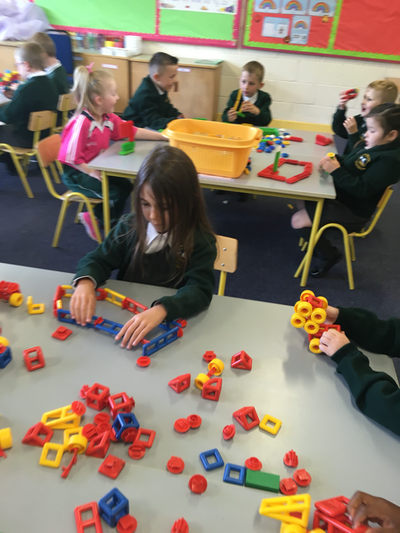 The generous support you give our school is greatly appreciated. 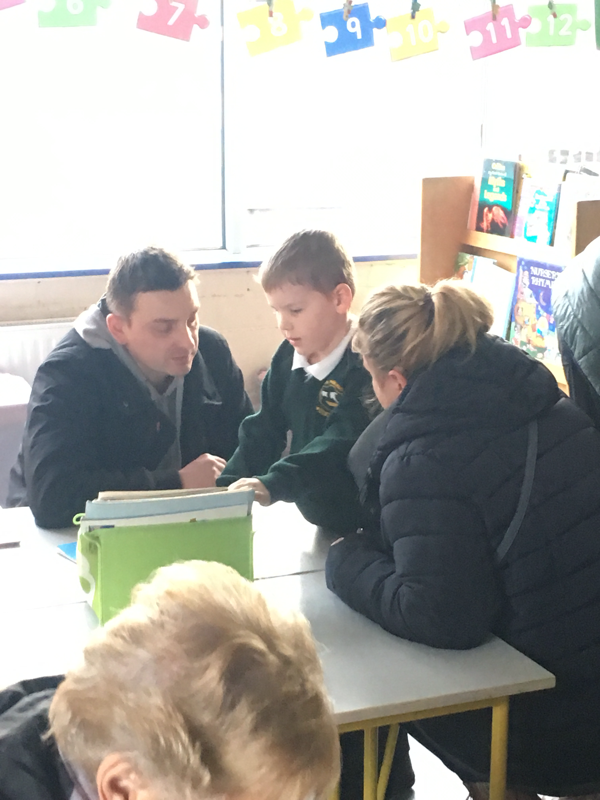 Also, thanks to our fantastic Parents Association who organised and facilitated the spooky room. 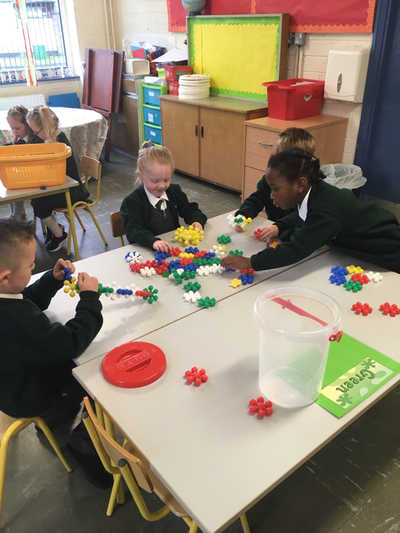 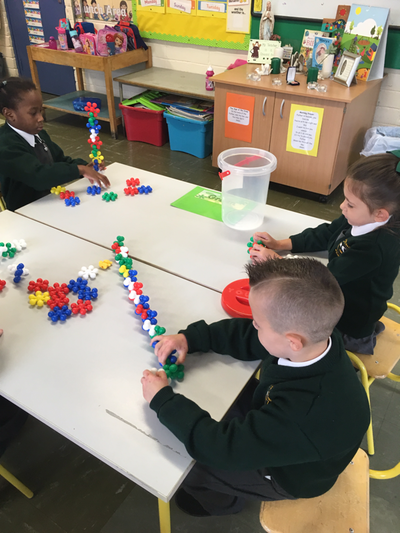 During Maths Week, we made an extra effort with our counting in Room 1. We continued to play lots of counting games - Humpty Dumpty game, snail game, number tennis, teddy bear counting. 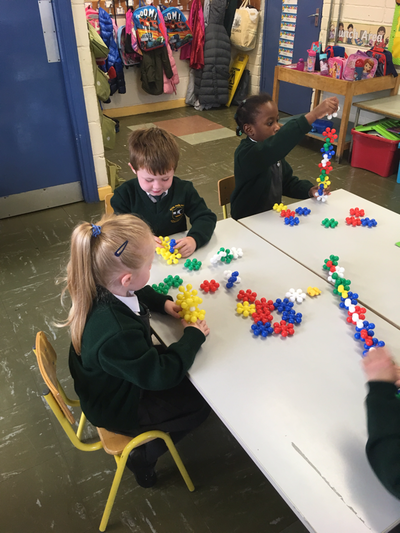 We also practiced patters lots with links, beads and pegs. 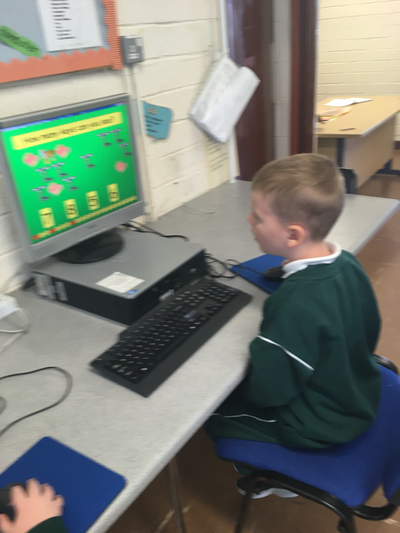 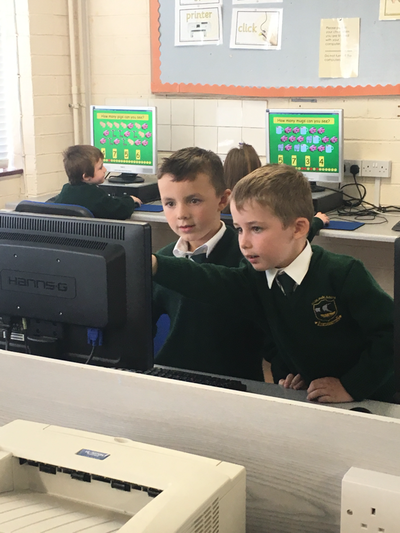 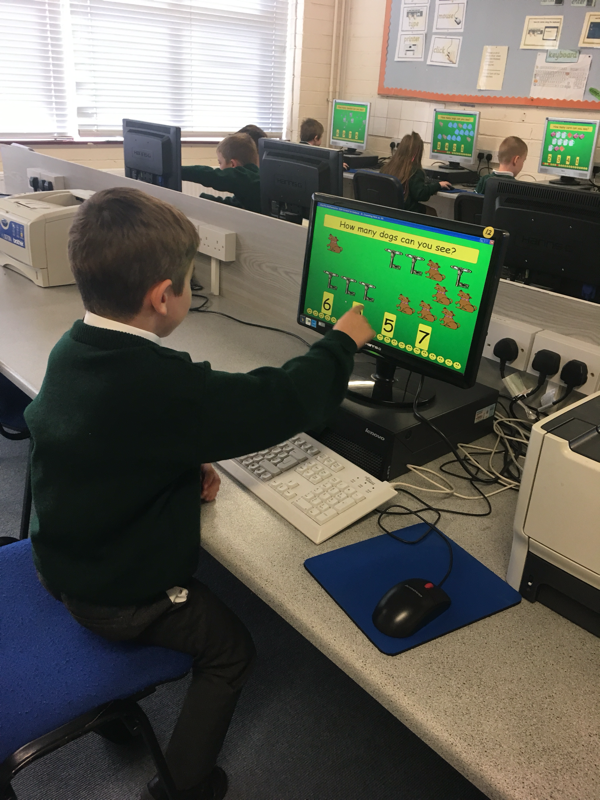 We played games on the interactive whiteboard and went on a maths trail around the school. 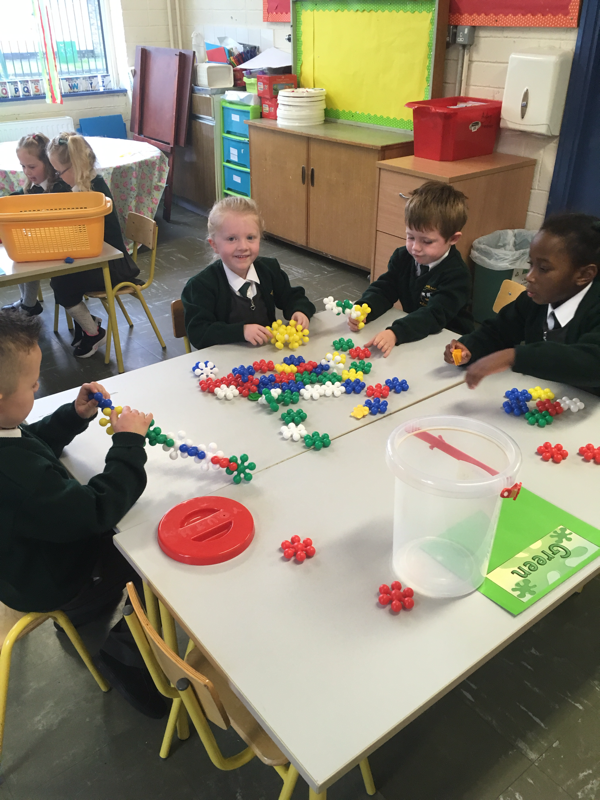 Remember to practise lots of counting at home. In P.E. 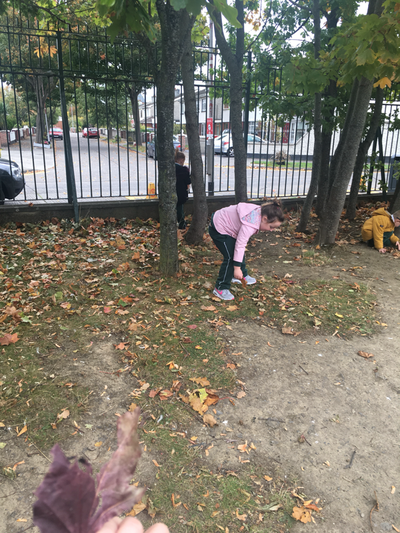 today, after our warm up we listened to a spooky Halloween tape and followed the instructions they gave. 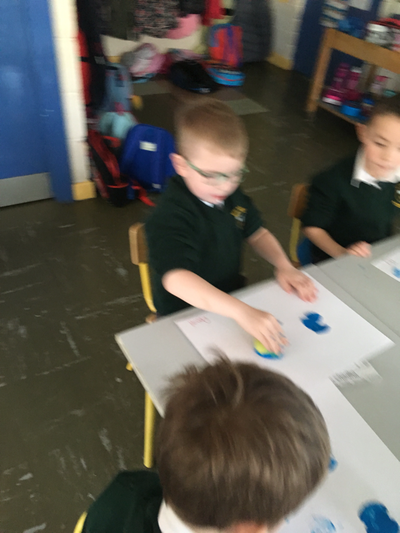 We made different shapes with our body to move around the hall. 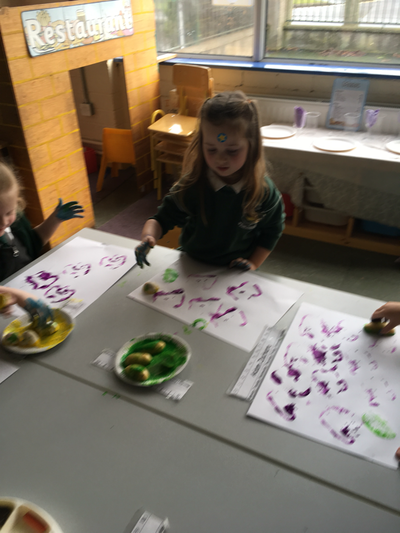 We had so much fun today. We are very busy boys and girls in Room 1. 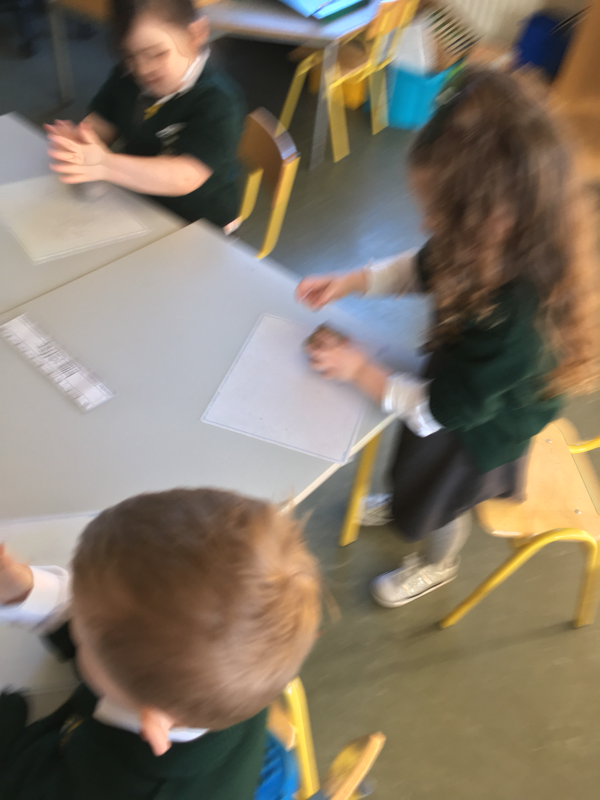 Every day, we learn a new sound but on Friday we practice writing the sounds we learned that we. 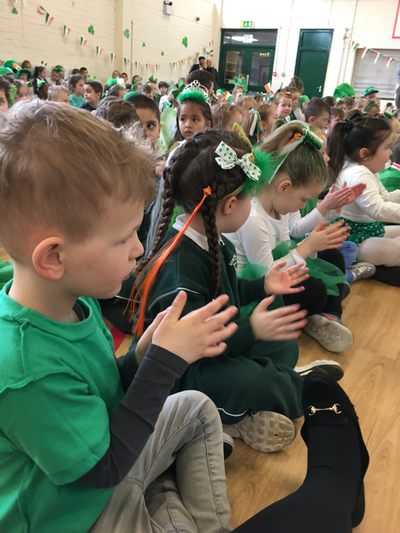 We really enjoy this part of our week. 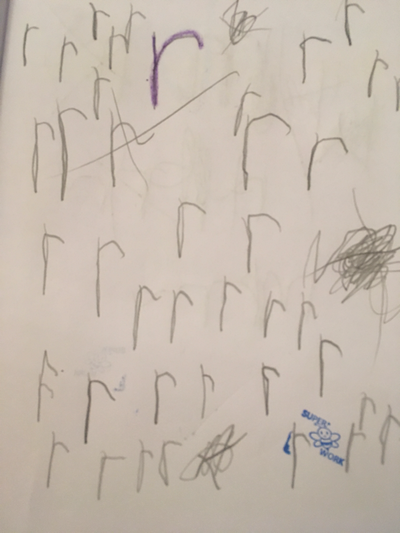 Teacher reminds us to sit properly when we are writing and to have crocodile fingers, with the pencil lying on the log. 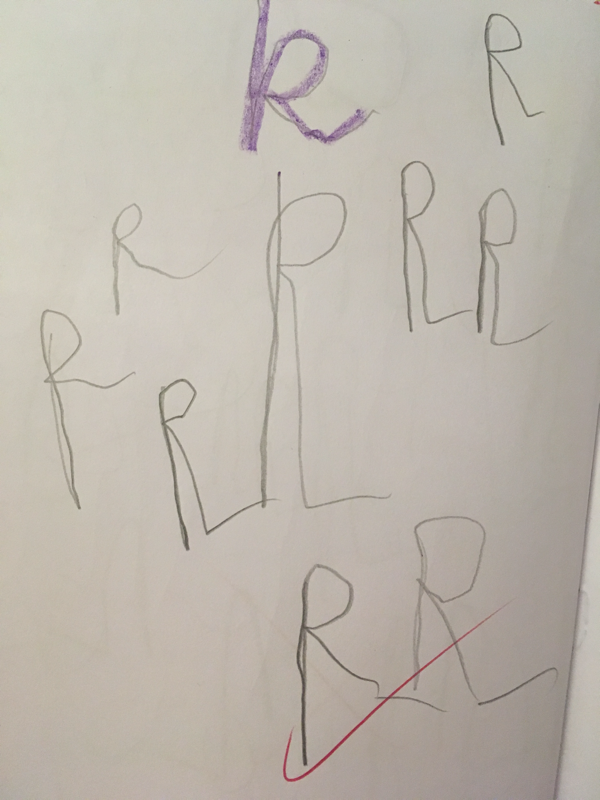 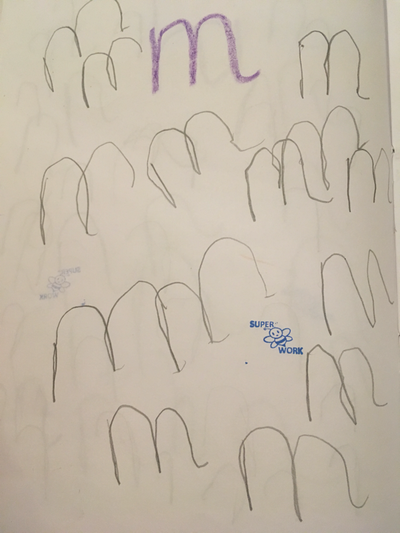 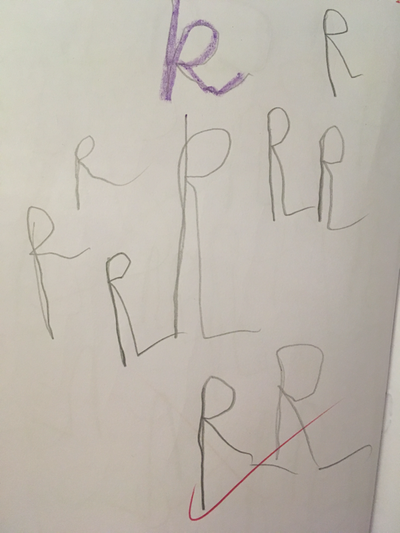 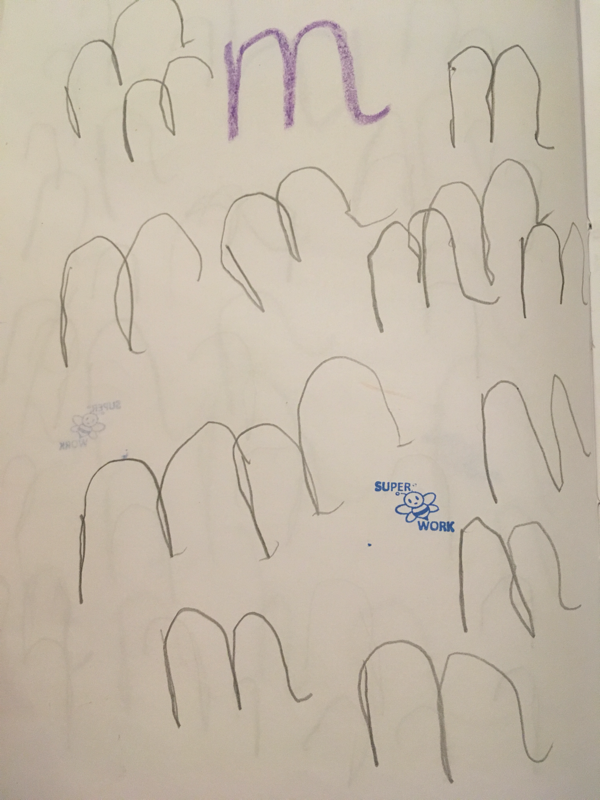 Using our inside voice, we say how to form the letter and then write it in our copy. 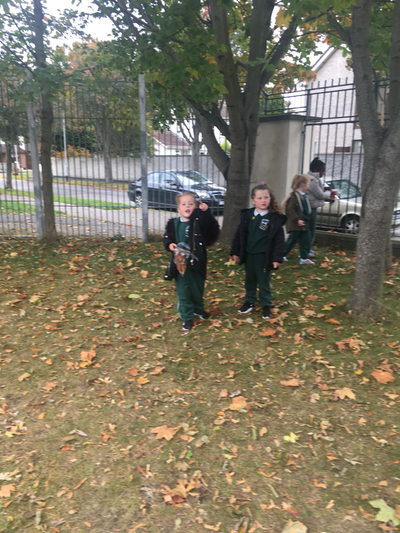 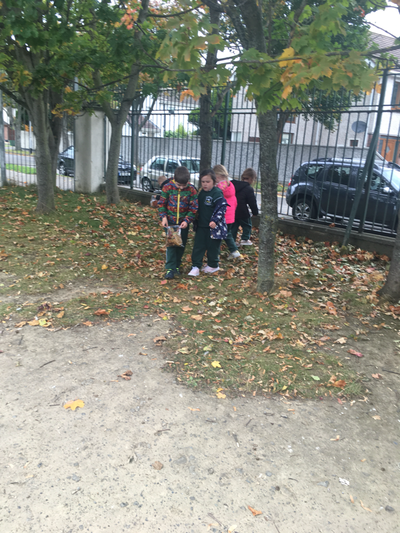 On Friday, the boys and girls of Room 1, along with the children from Rooms 2 and 3 went on an autumn nature walk. 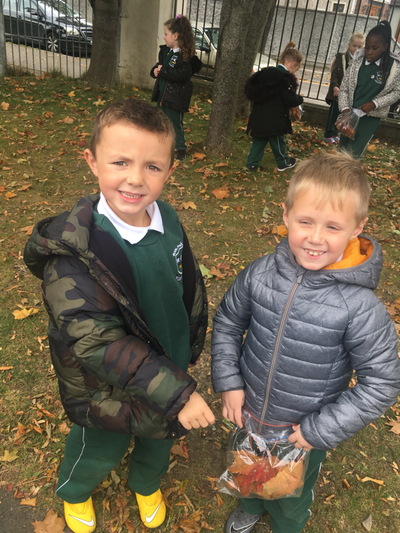 We put on our coats and went on an autumn hunt. 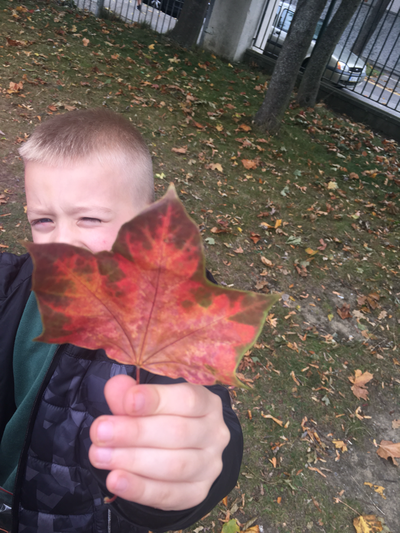 For the past few weeks we have talked about the autumn leaves changing colours and the hibernating hedgehog. 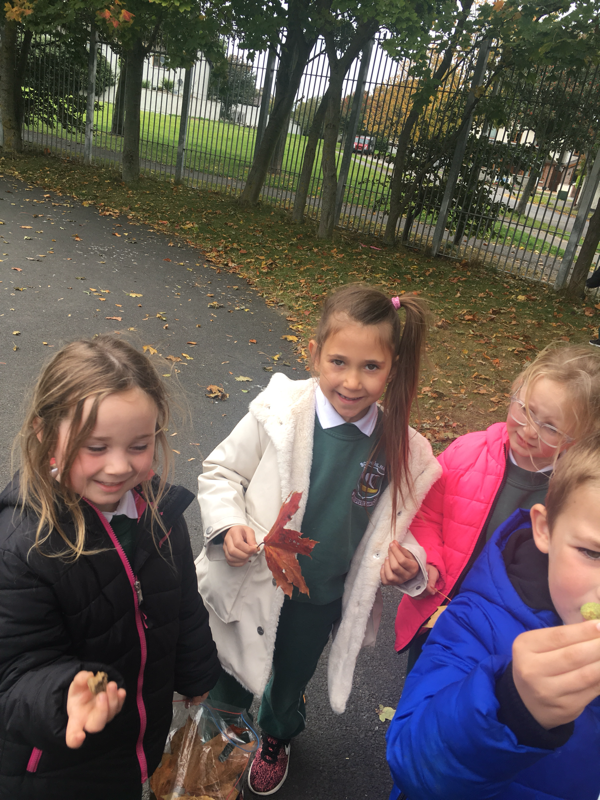 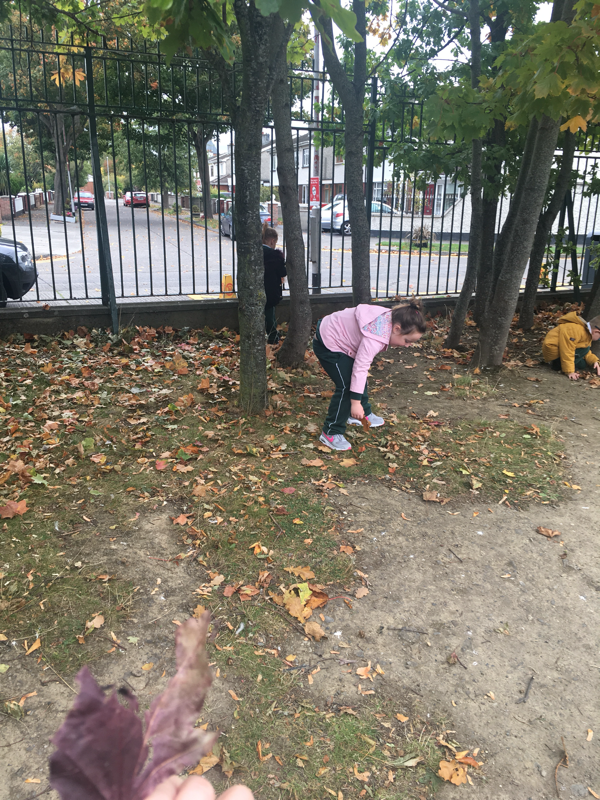 On our walk, we stopped to look at the leaves changing colours on the tress, the leaves falling to the ground and berries on the trees for the birds to eat. 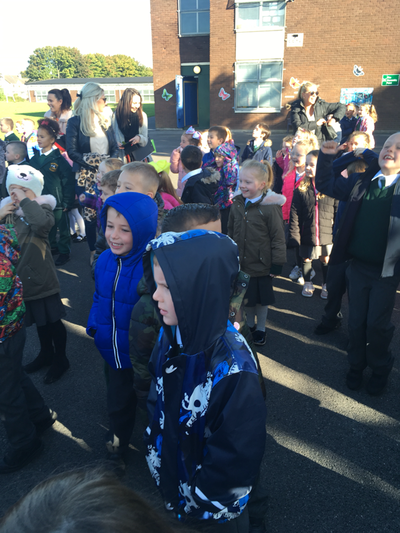 We even listened to the birds singing. 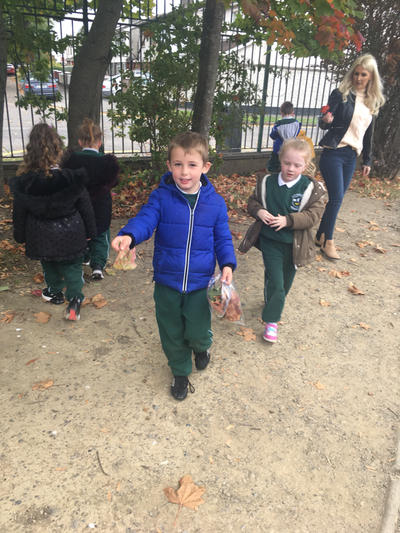 We then collected autumn leaves to make a picture in our classroom. 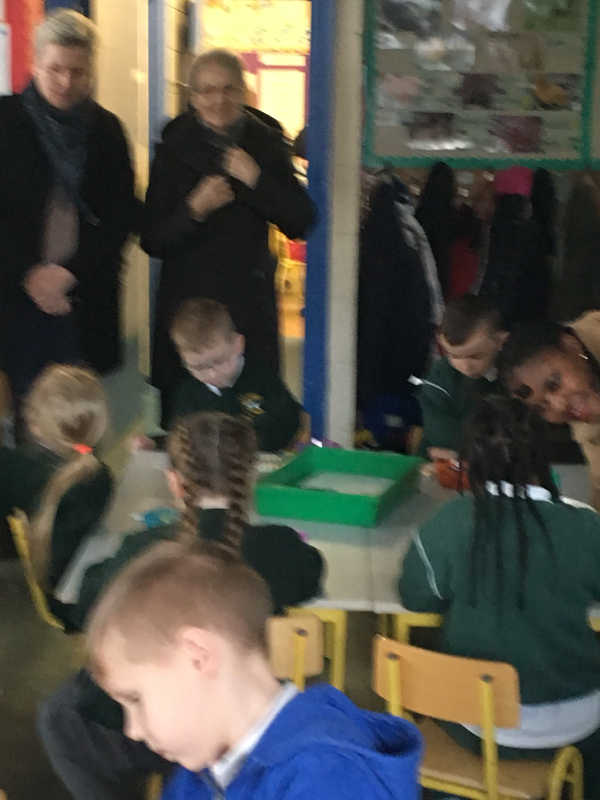 Thank you to all the Parents and Guardians who attended the recent meeting on routines in St.Pauls Junior School as well as in Room 1. 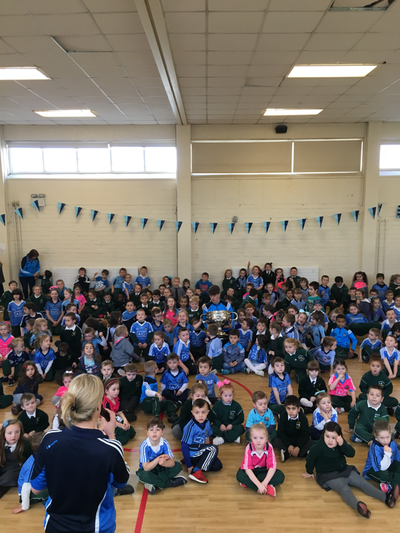 Please find below a link to all that was discussed at the meeting. 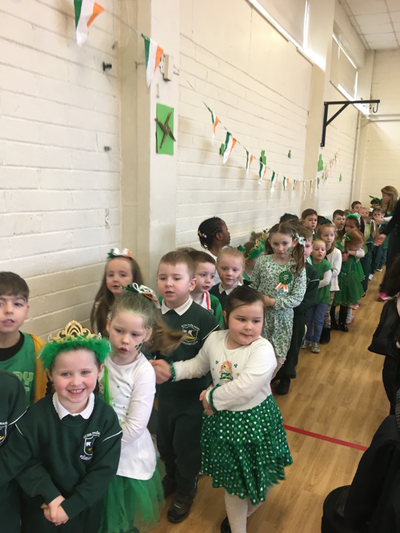 Welcome to all the Junior Infant boys and girls and to their parents and guardians. 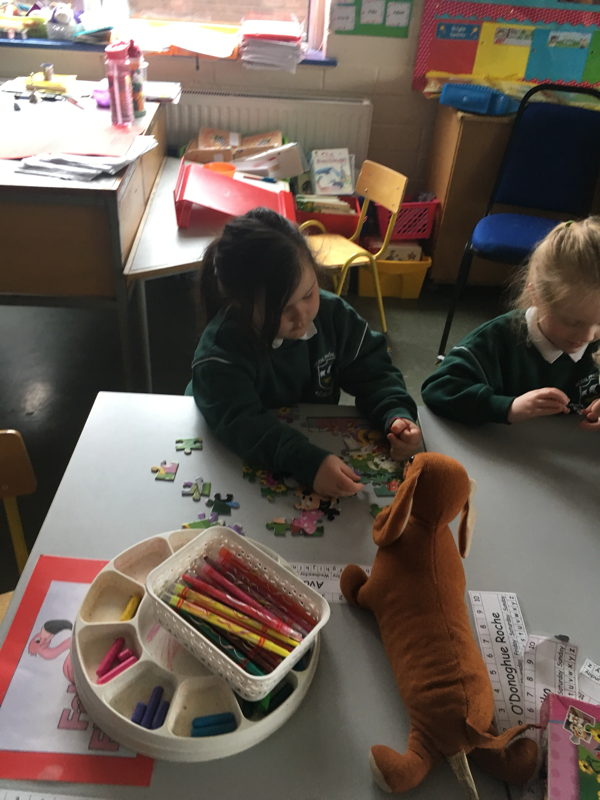 This page is for you to keep you up to date on all that is happening in our classroom. 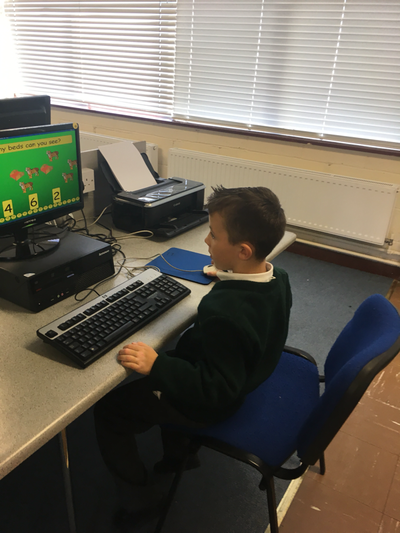 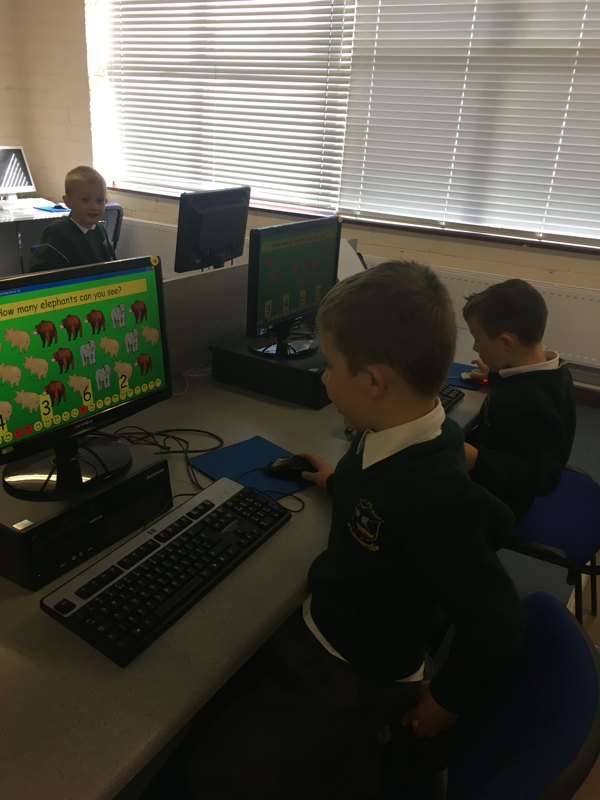 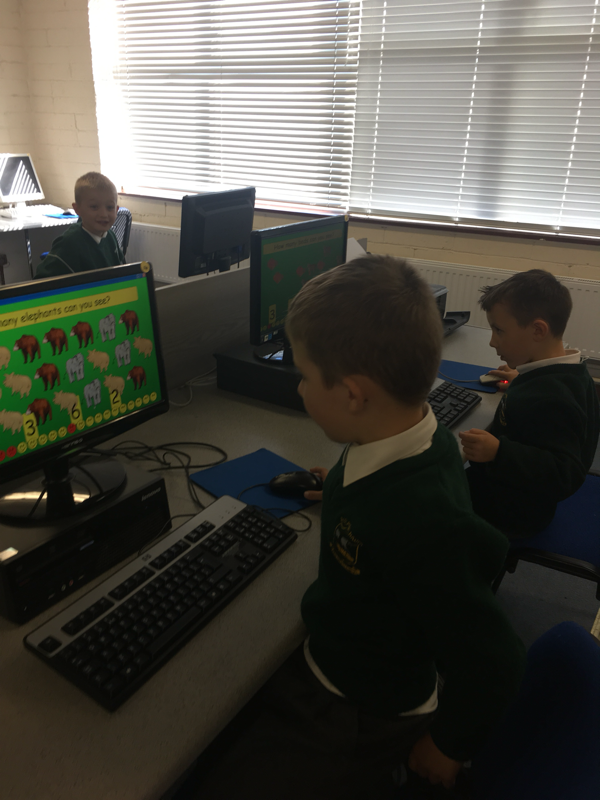 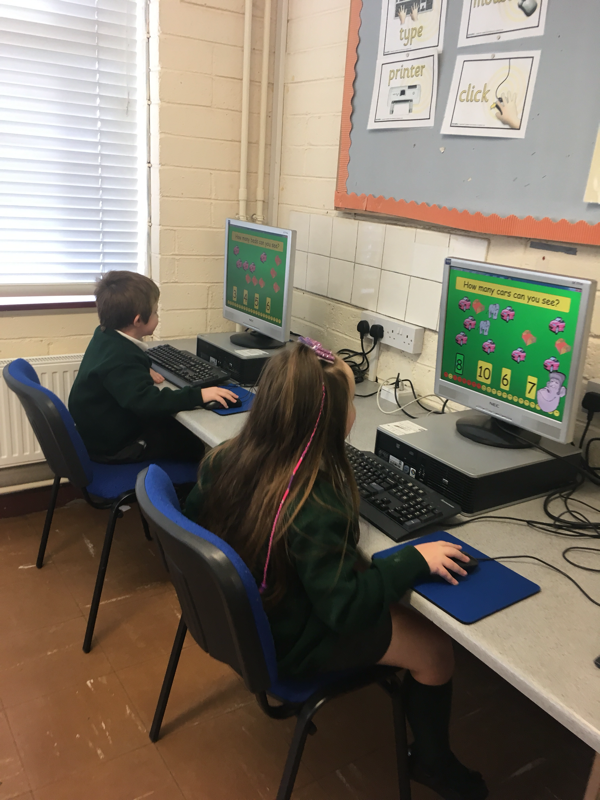 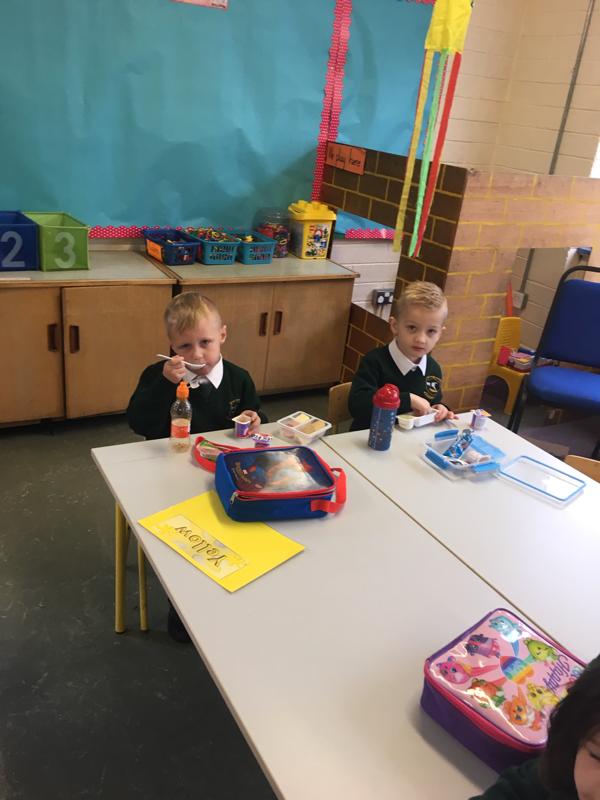 All the children in Room 1 have settled in so well into school and are enjoying all our activities. 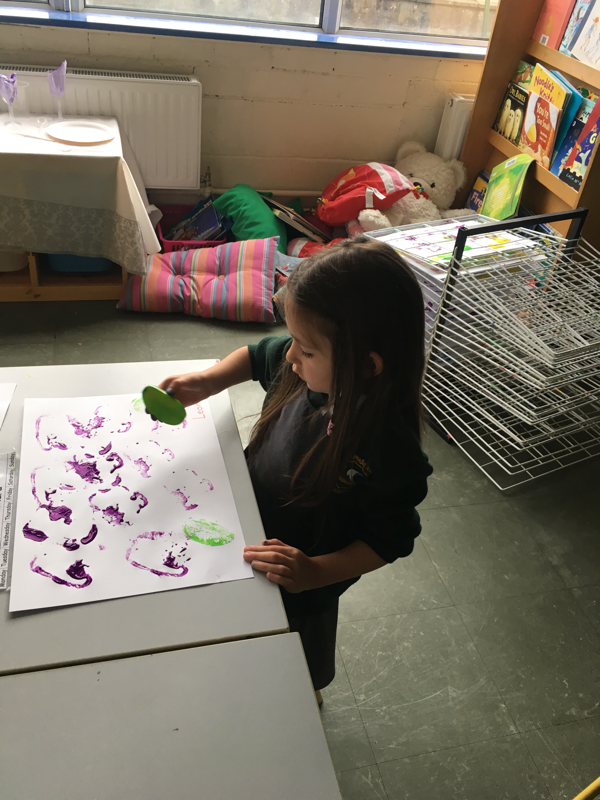 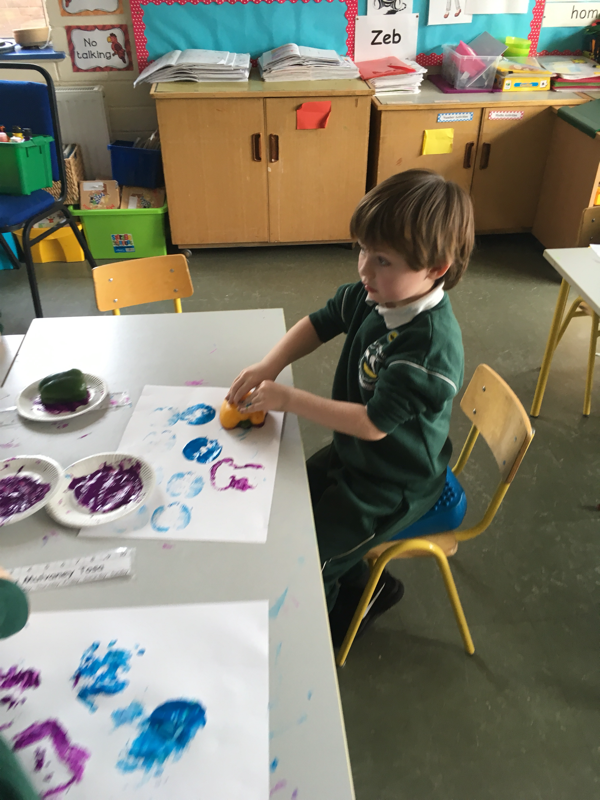 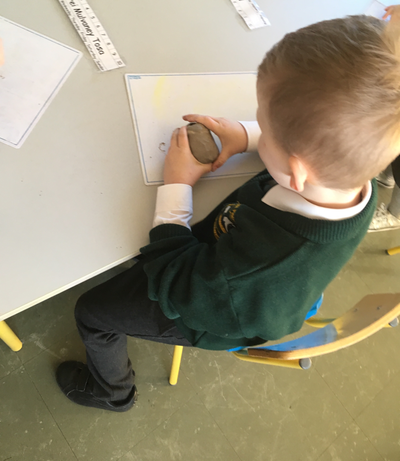 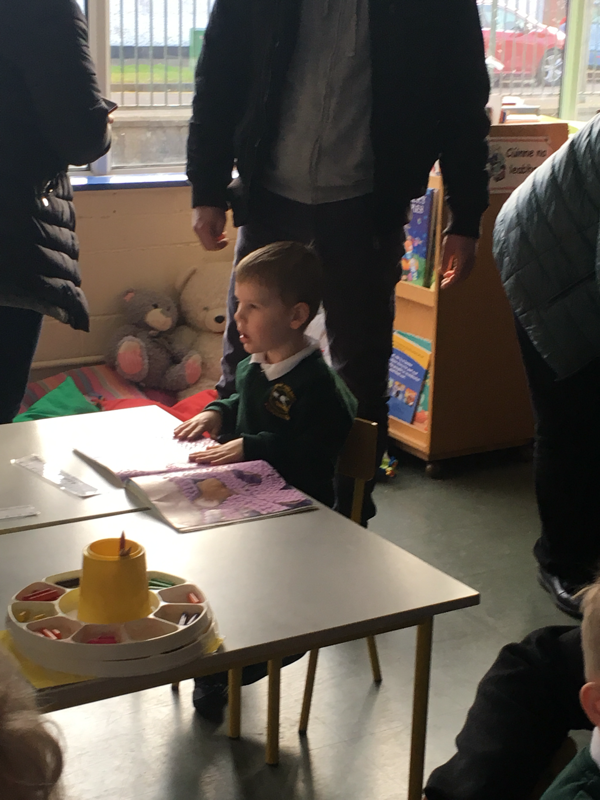 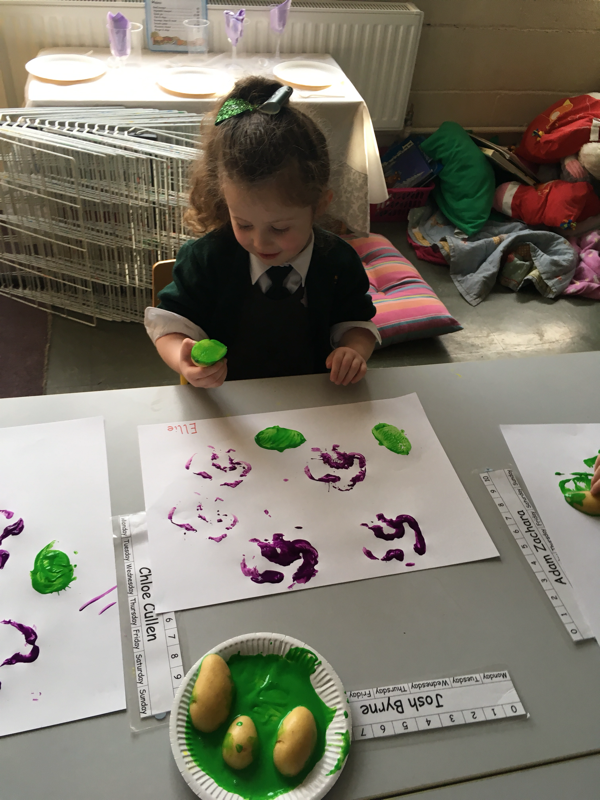 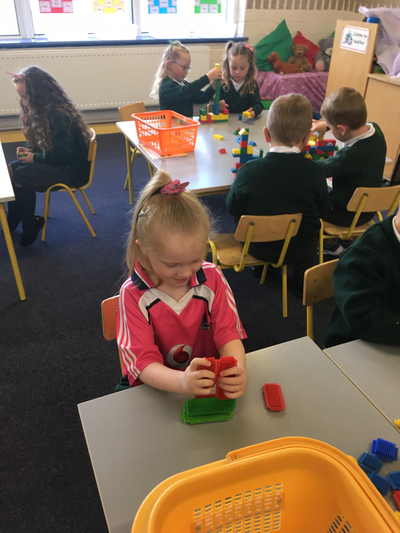 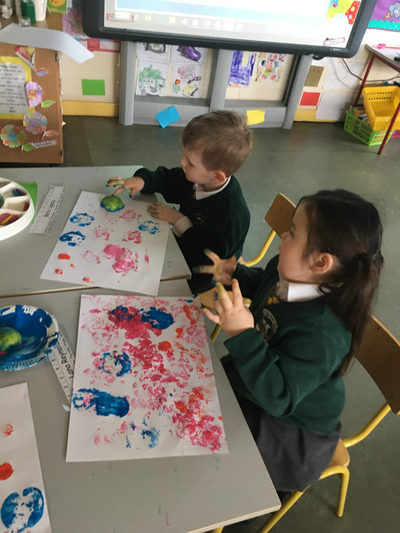 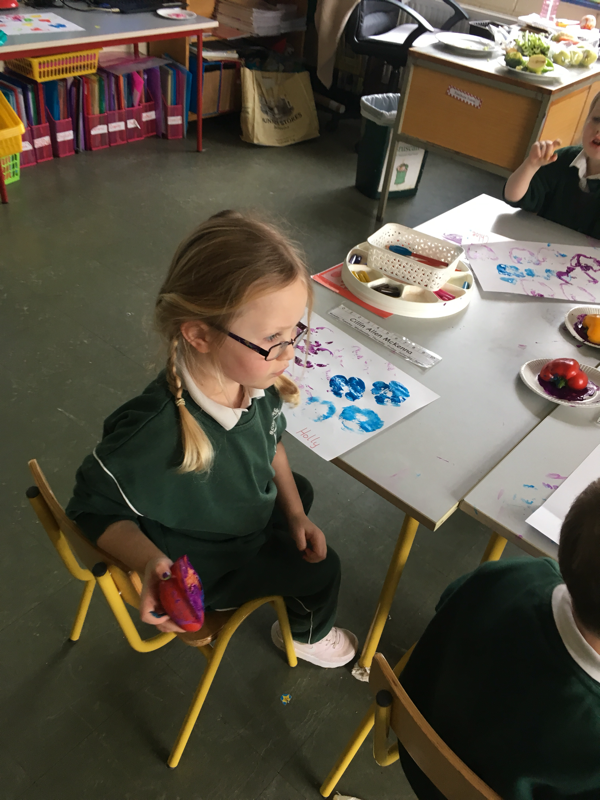 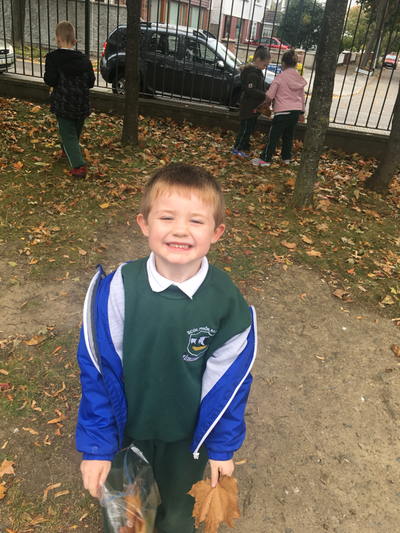 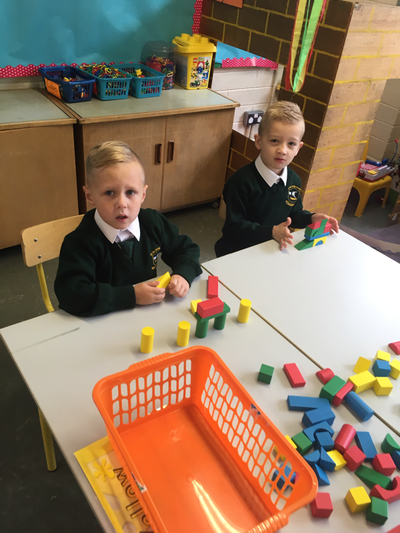 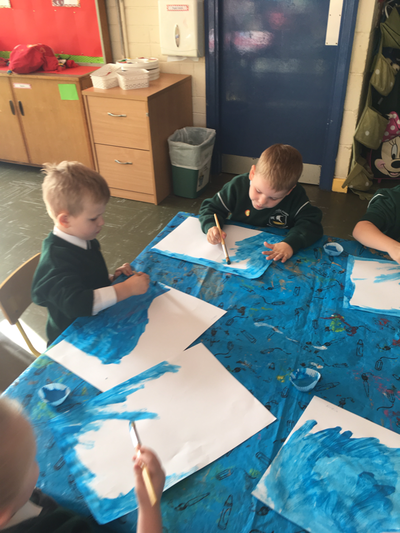 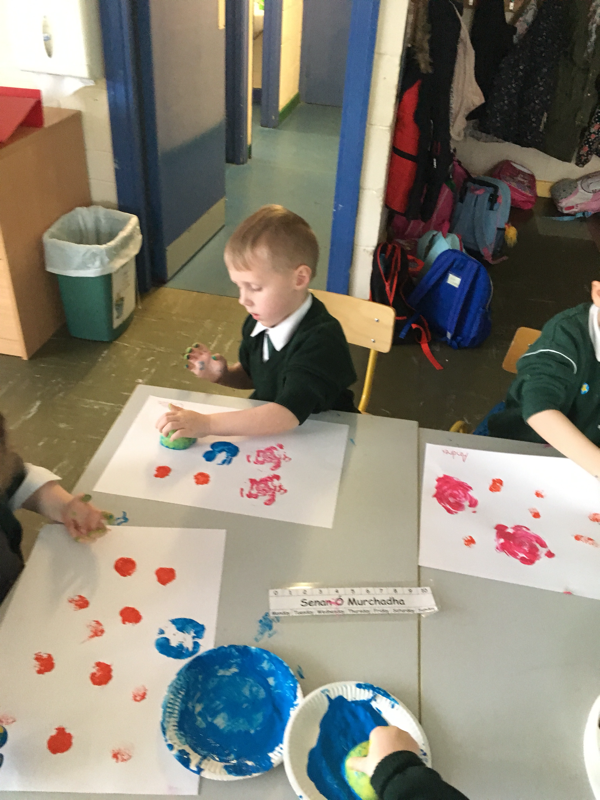 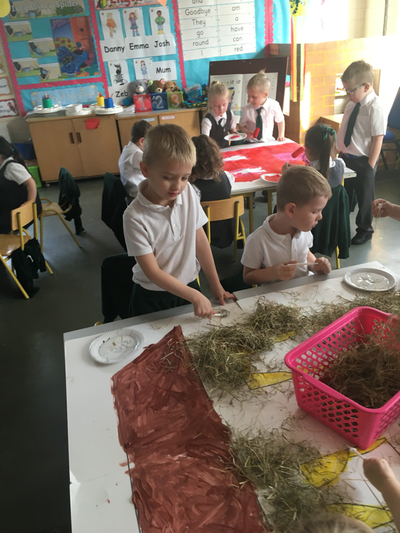 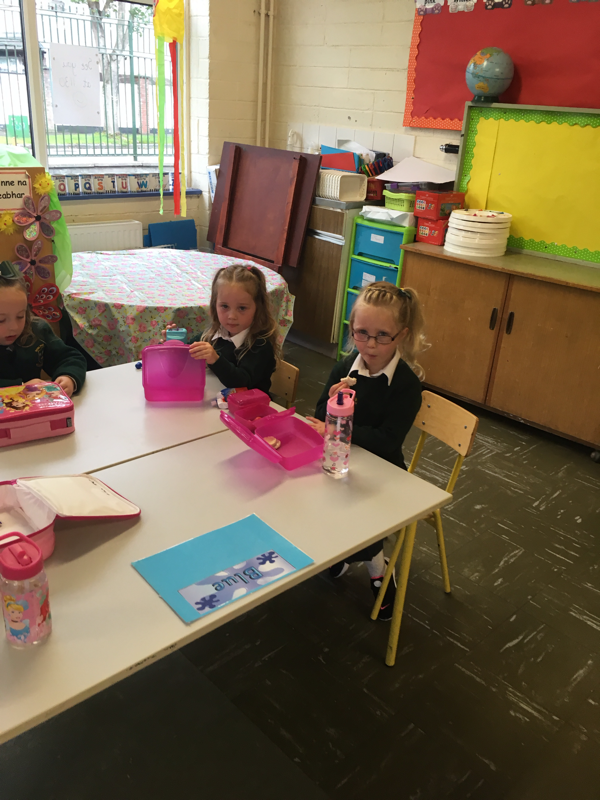 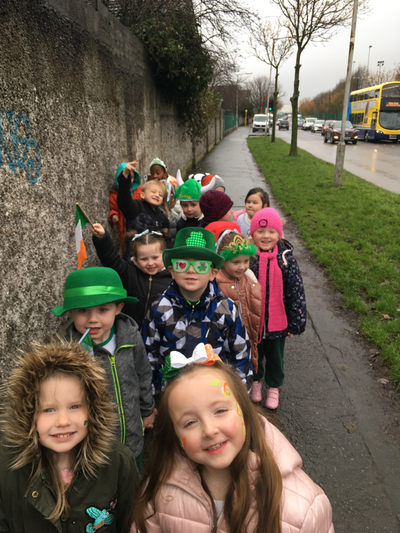 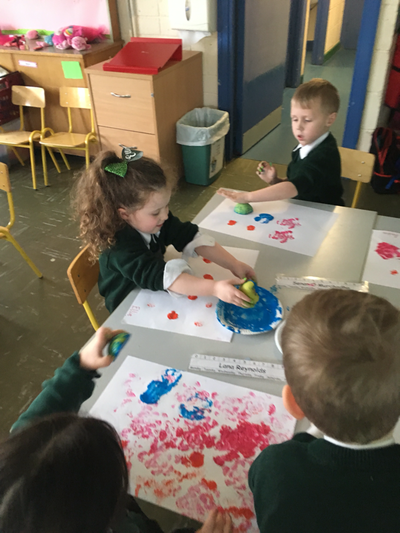 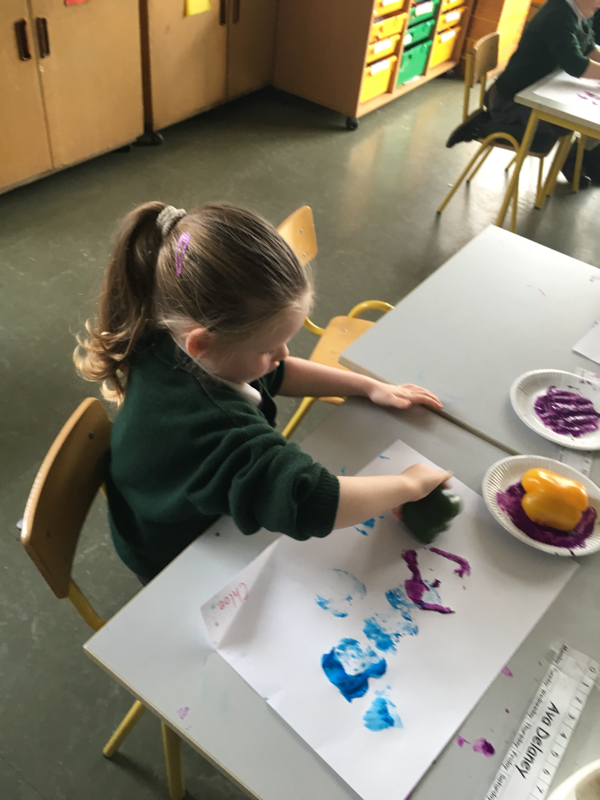 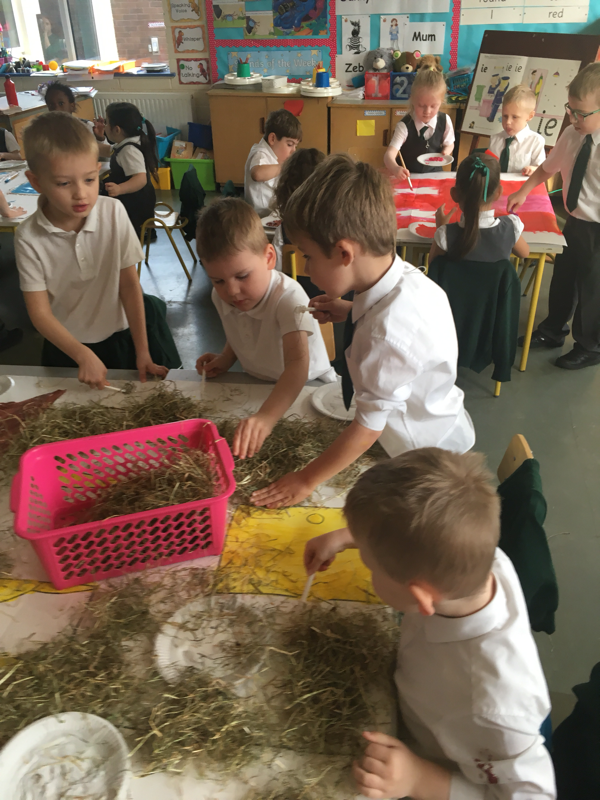 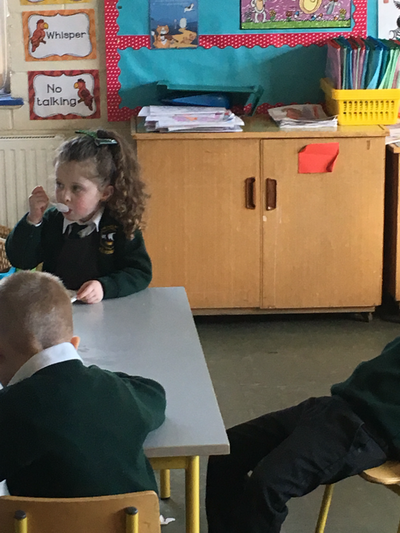 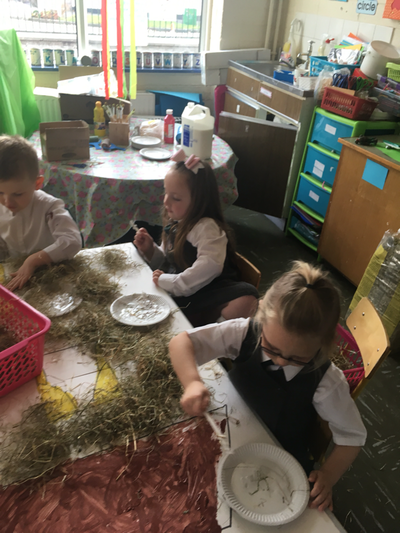 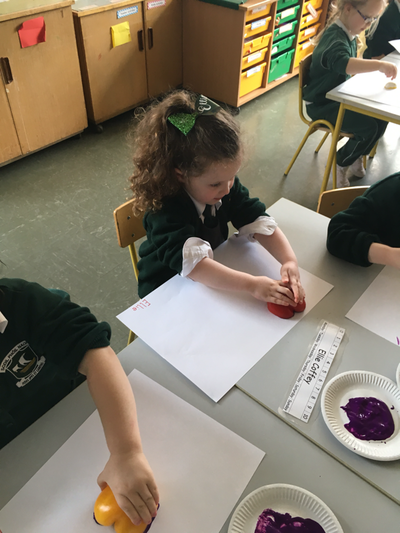 Since starting school we've learned songs, played new games, practised our counting, painted, used scissors, started to learn Irish, learning new sounds along with many many more activities. ​Have a look at some of the photographs below to see what we've been up to.